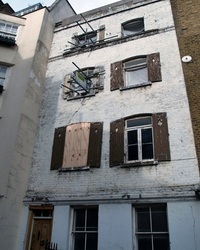 Shoreditch - Flat to let? 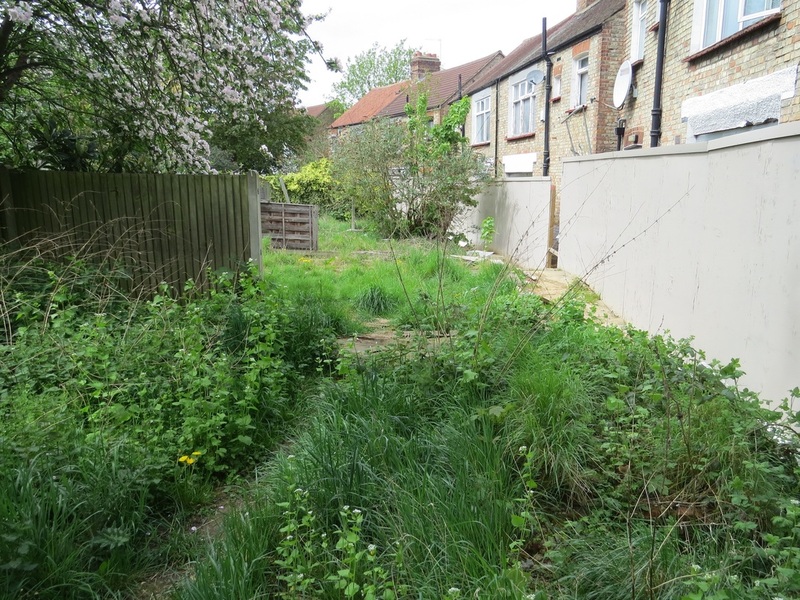 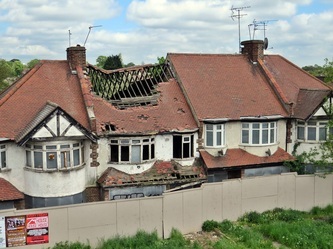 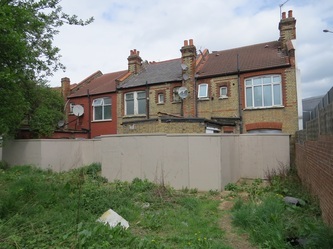 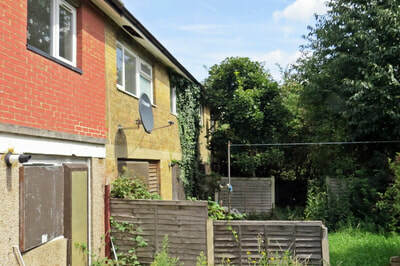 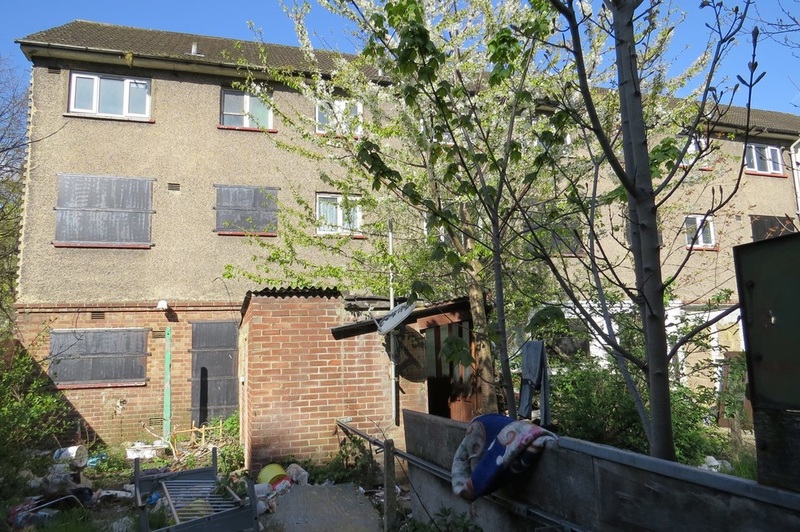 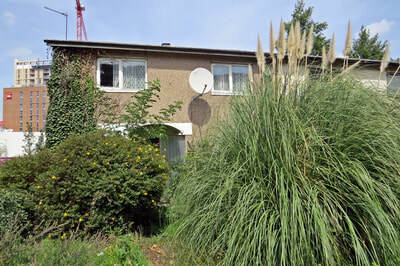 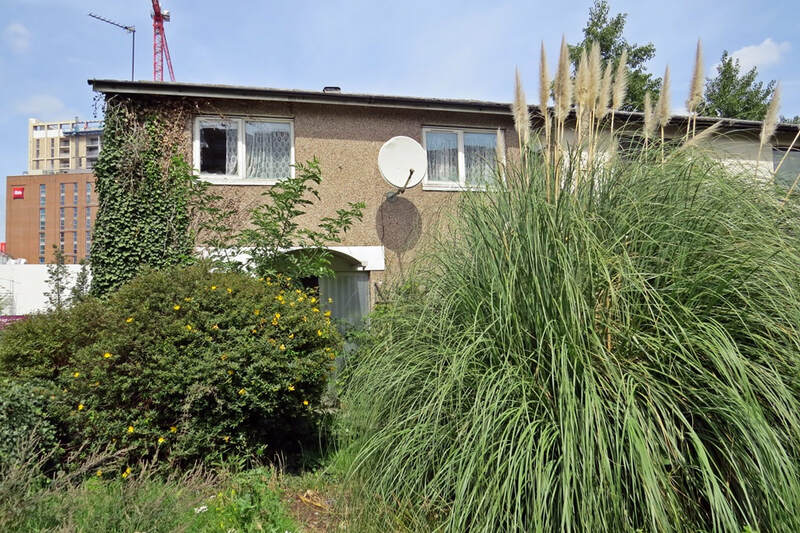 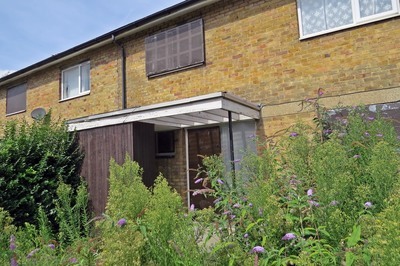 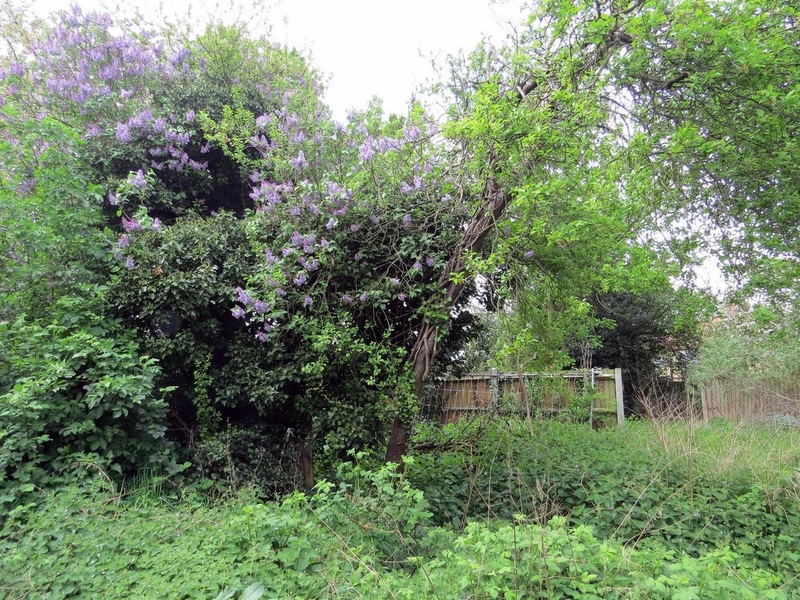 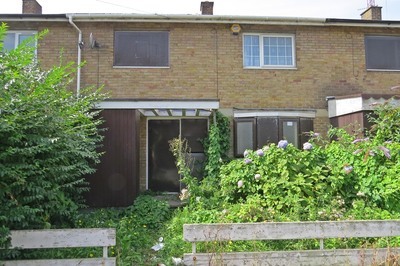 This site of low density residential dwellings on Wouldham Road, Chedworth Close, Rathbone Street and Clarkson Road was a residential area where the residents have been decanted since 2015 and the site is to be cleared for redevelopment. 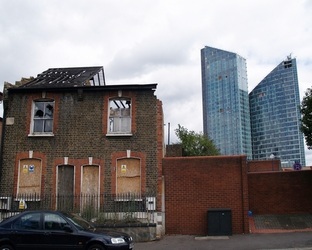 It has a prime location being opposite Canning Town station.The surrounding 4 story blocks were demolished in 2011 and replaced by high rise apartments. 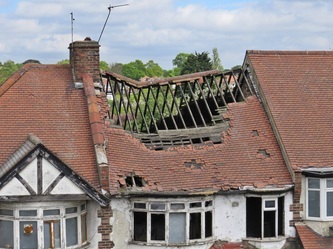 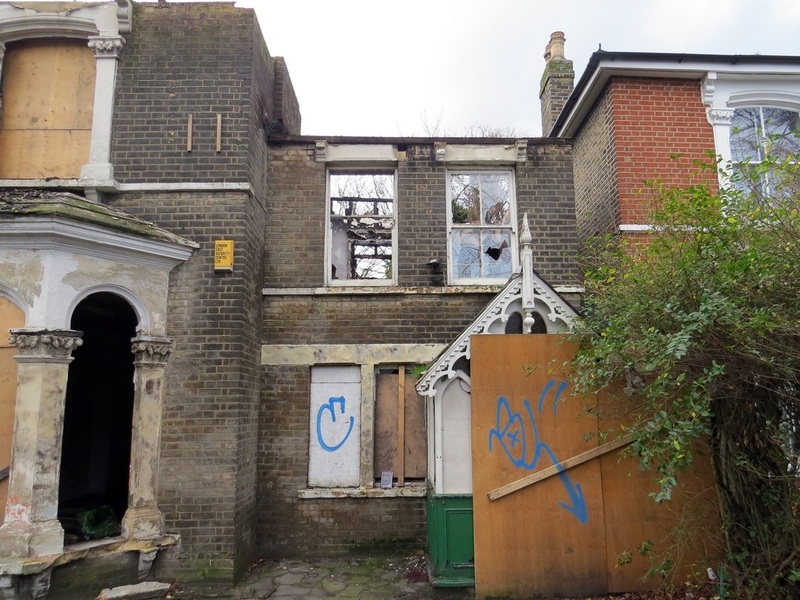 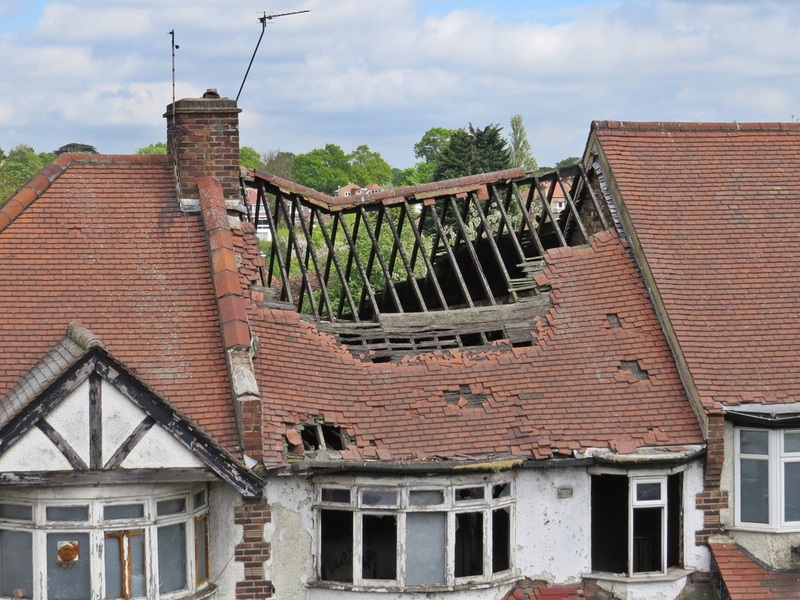 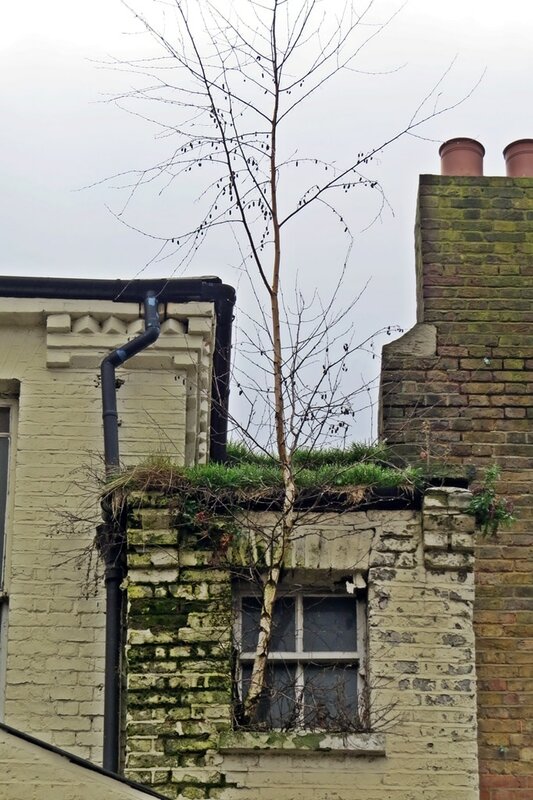 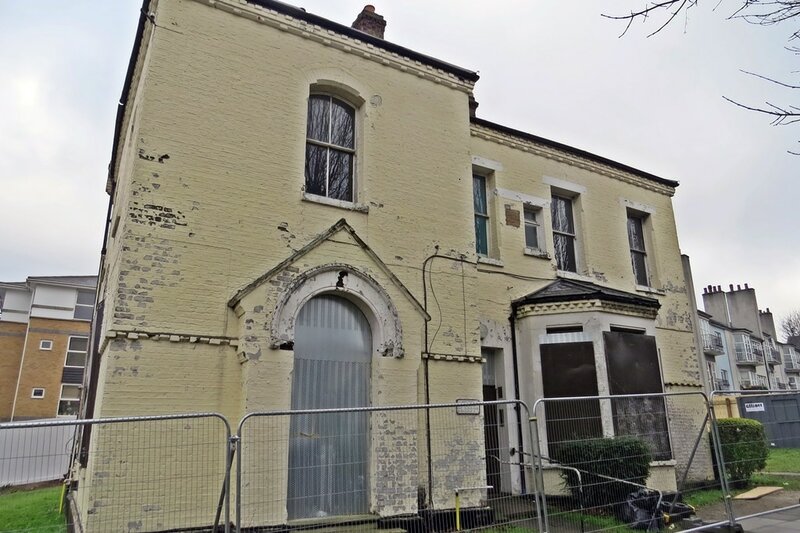 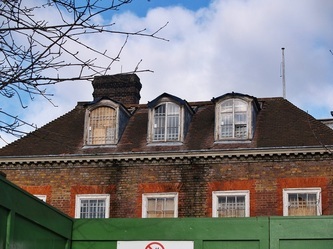 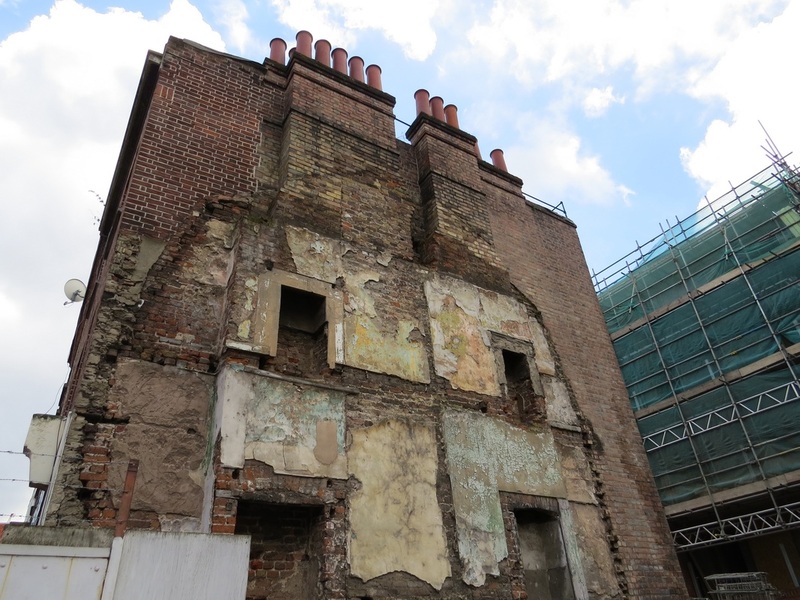 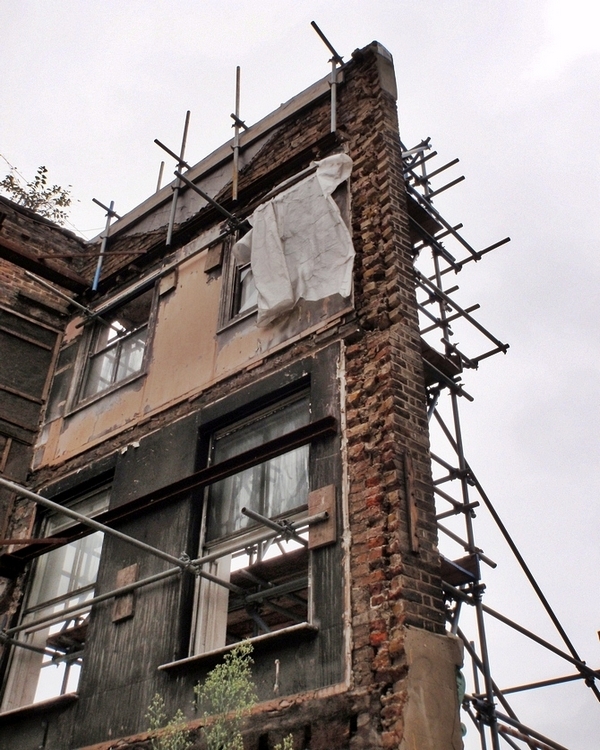 ​This old residential building built in 1868 consisting of council flats was reported as being structurally unsound in 2011 with major works required to roofing as well as windows, chimney stacks, heating, stairs, plasterwork, kitchens and bathrooms. 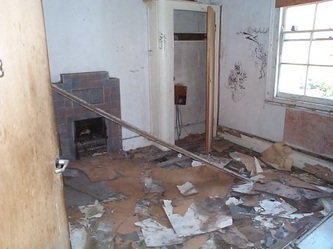 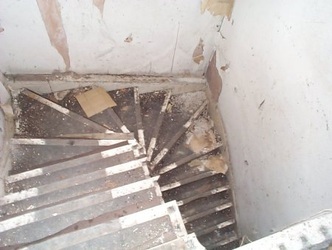 According to the council remedial works cost estimates made work unfeasible and a full decant was recommended. 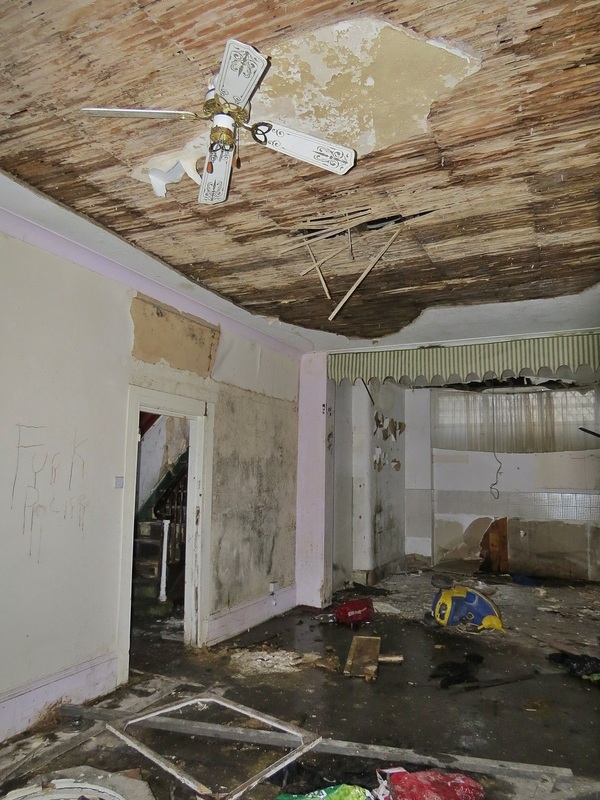 Leaks from the roof caused the top floor ceiling to collapse shortly after the decant completed. 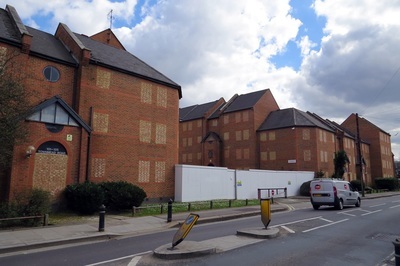 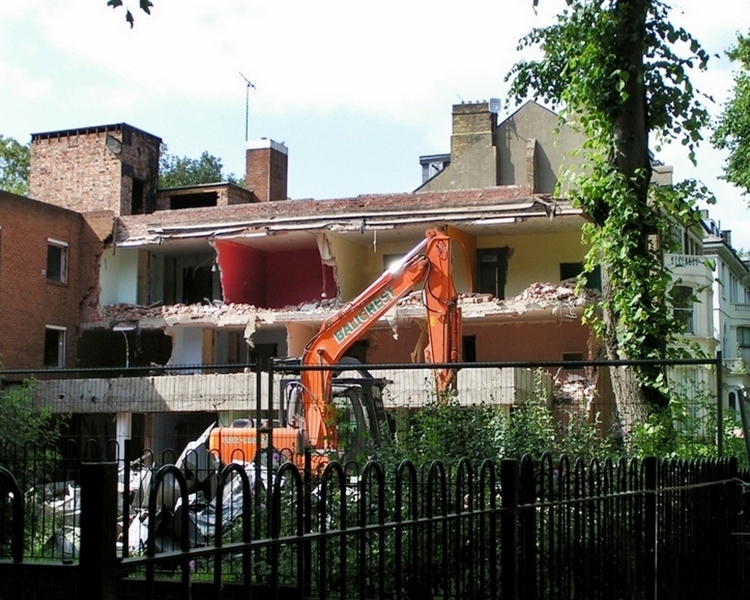 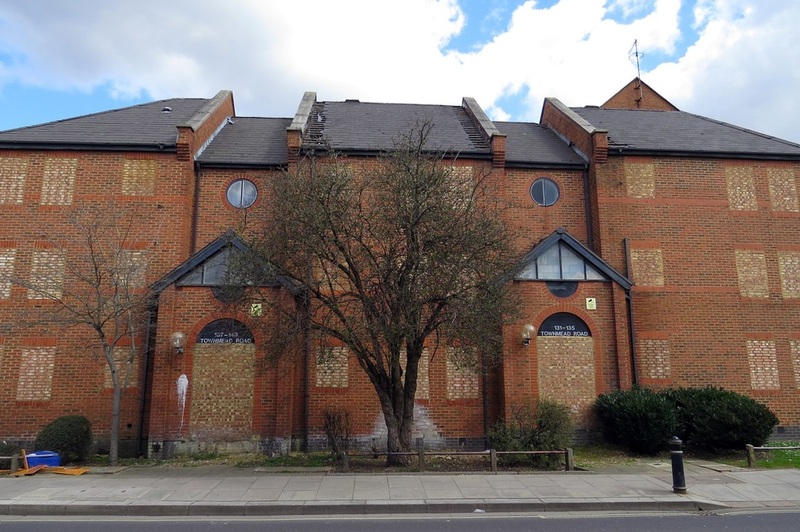 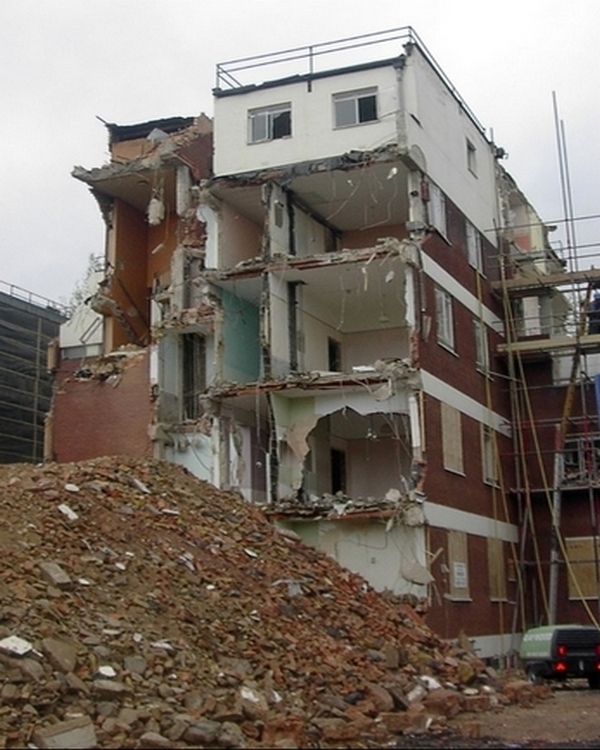 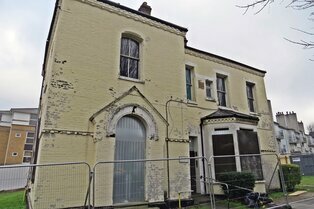 Plans are demolish the building and to build 19 flats that will be managed by Waltham Forest Housing. 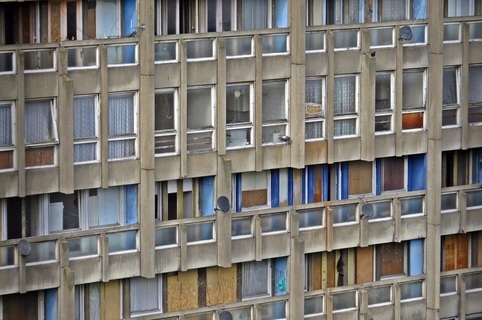 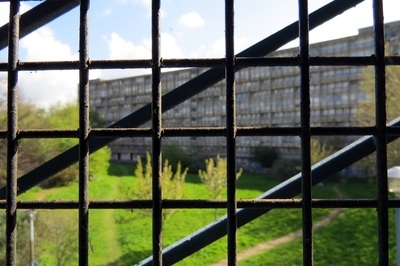 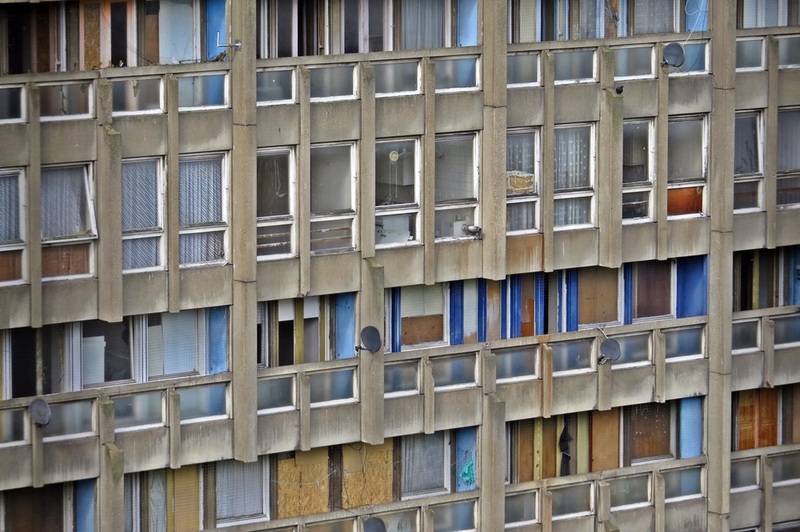 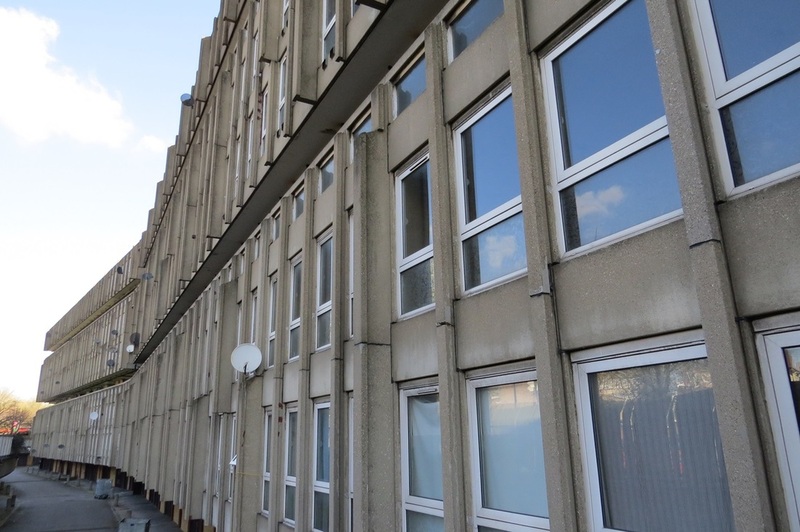 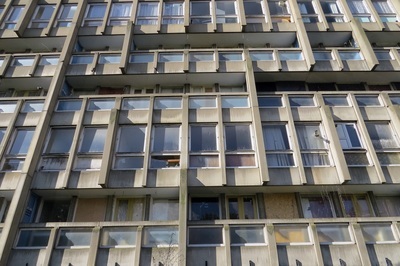 ​Designed in the late 1960s by architects Alison and Peter Smithson and the council estate was completed in 1972. 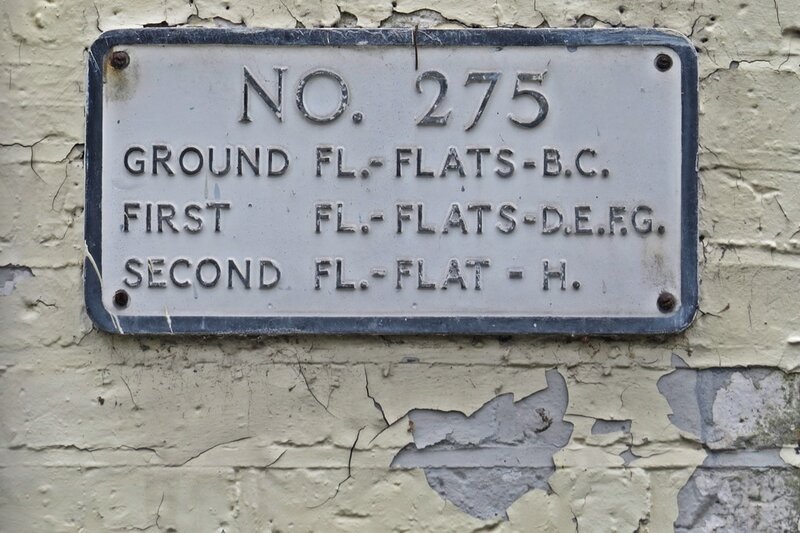 213 flats are comprised of two long curved blocks,built from precast concrete slabs, facing each other across a central green space. 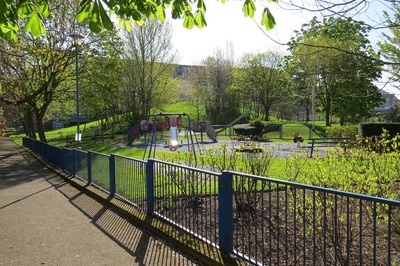 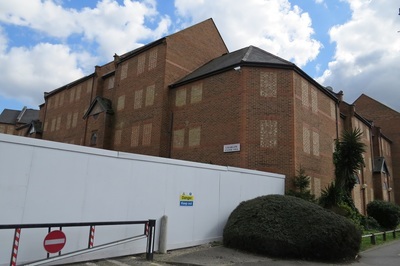 In the central green area is a small man-made hill.Last year joyriders managed to drive a car up the hill before torching it.There are also some terraced houses and low level flats on the site making the whole site 252 homes. 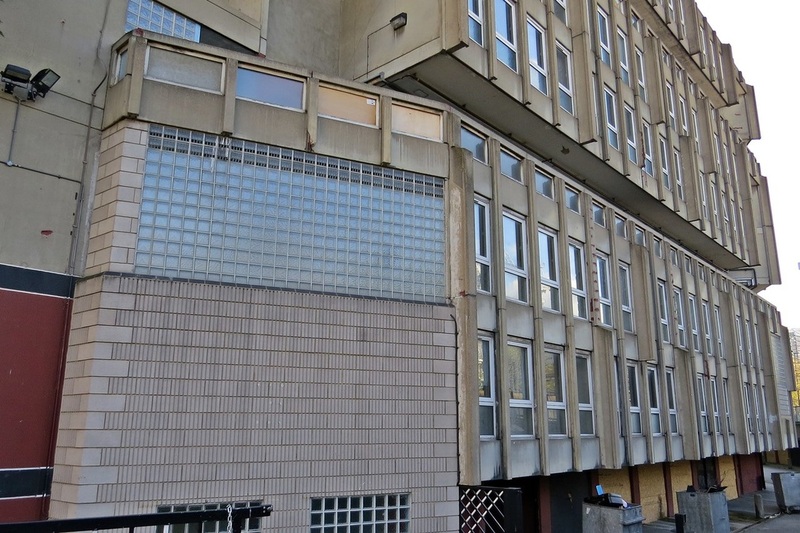 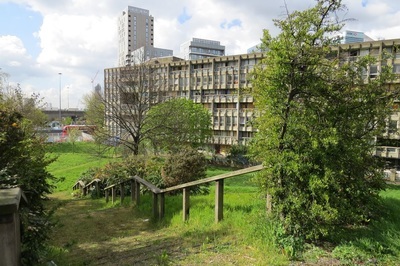 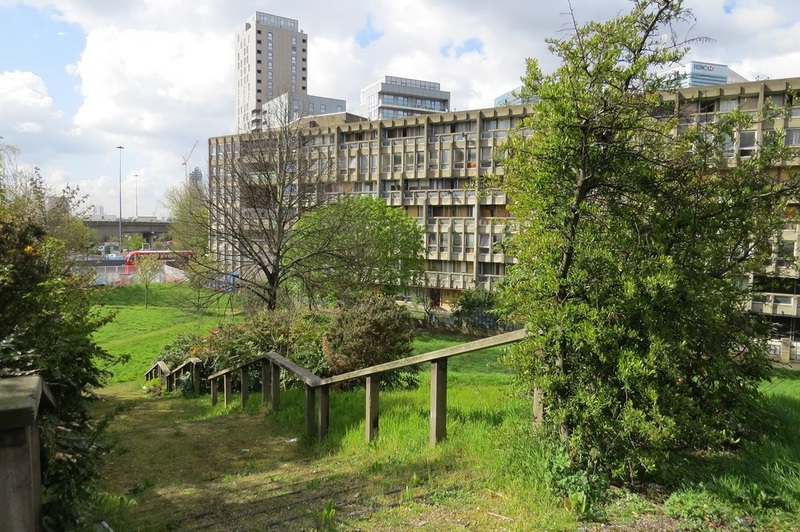 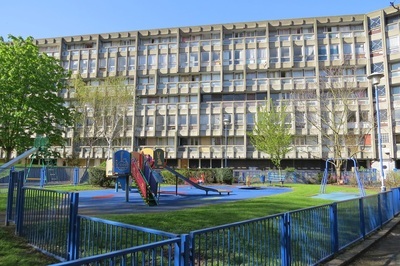 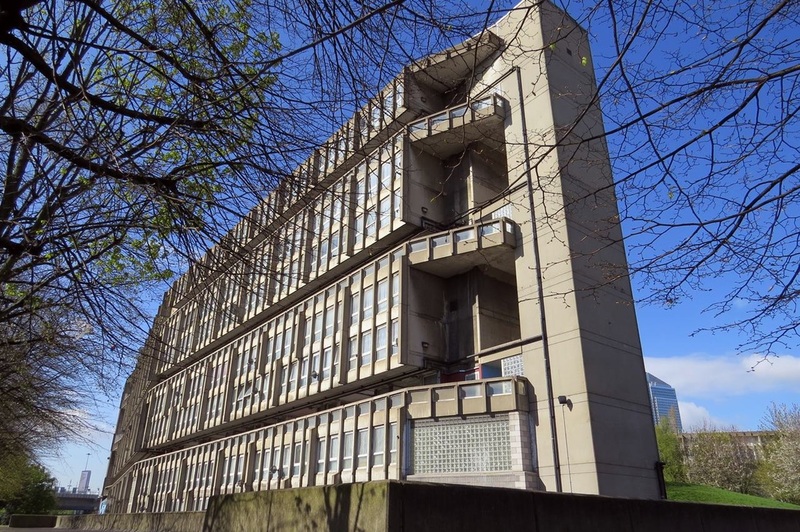 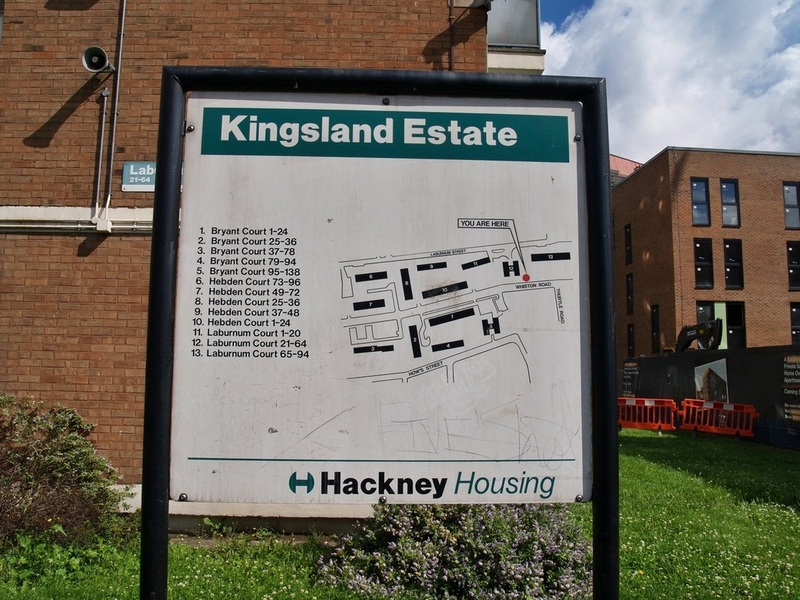 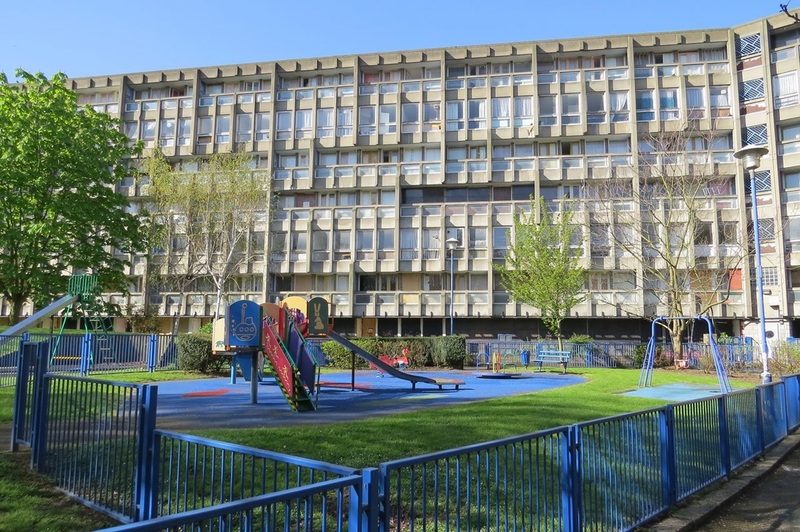 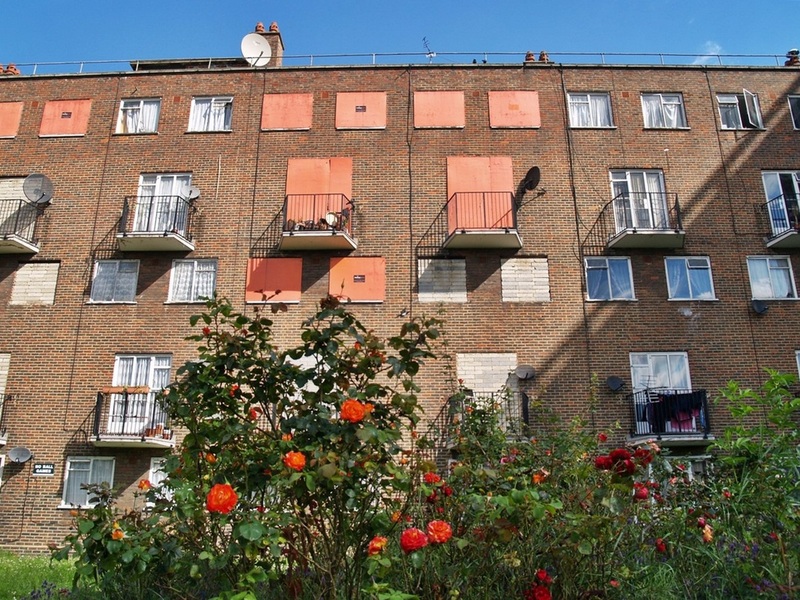 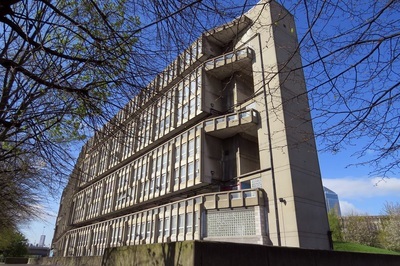 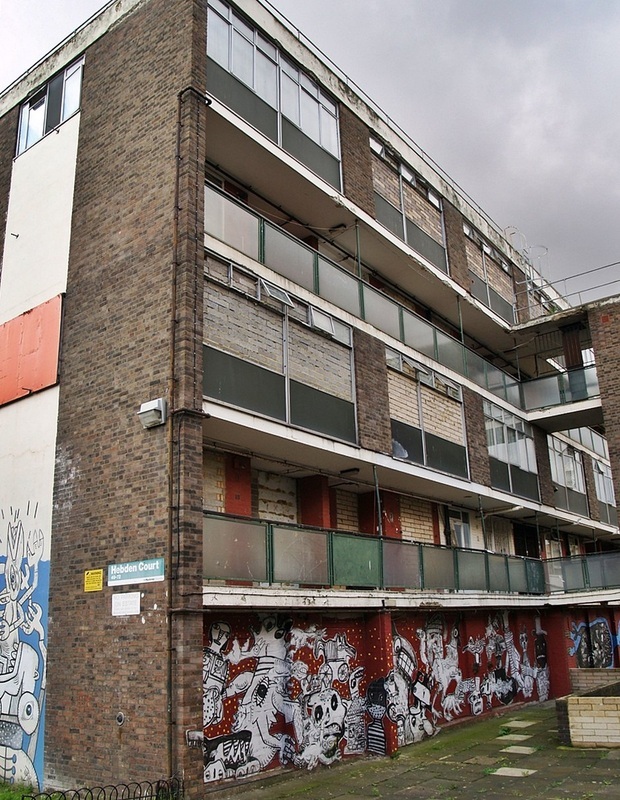 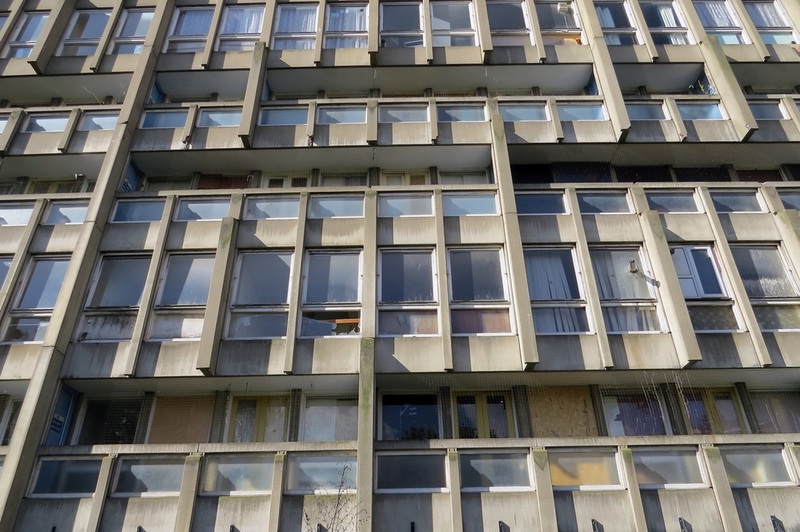 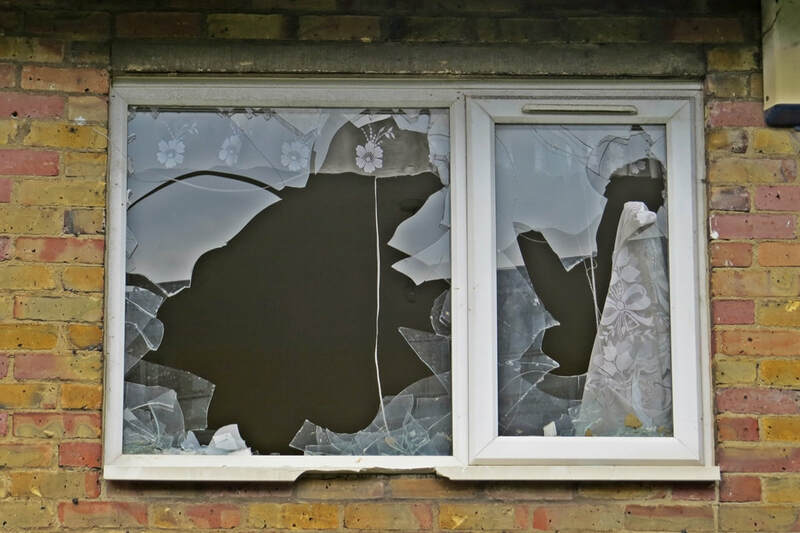 The landlord is Tower Hamlets Council who has decided the estate is past its sell-by date and they will be handing it over to Swan Housing Group to replace it with 1,575 new ones. 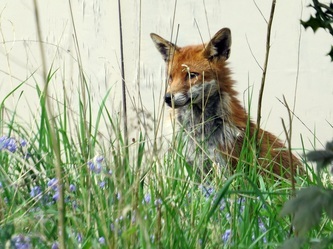 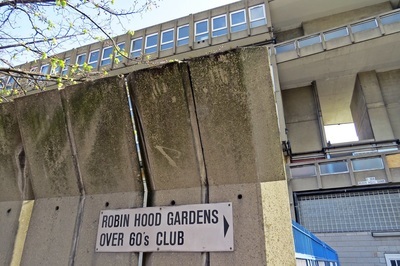 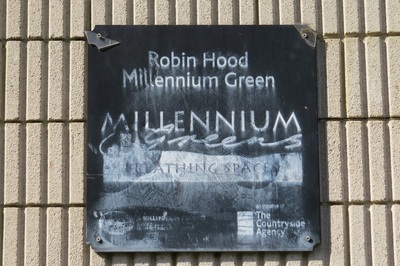 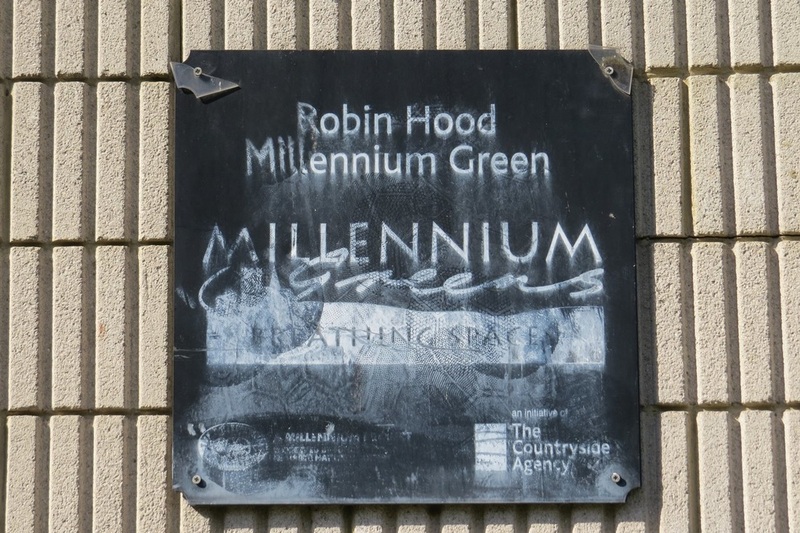 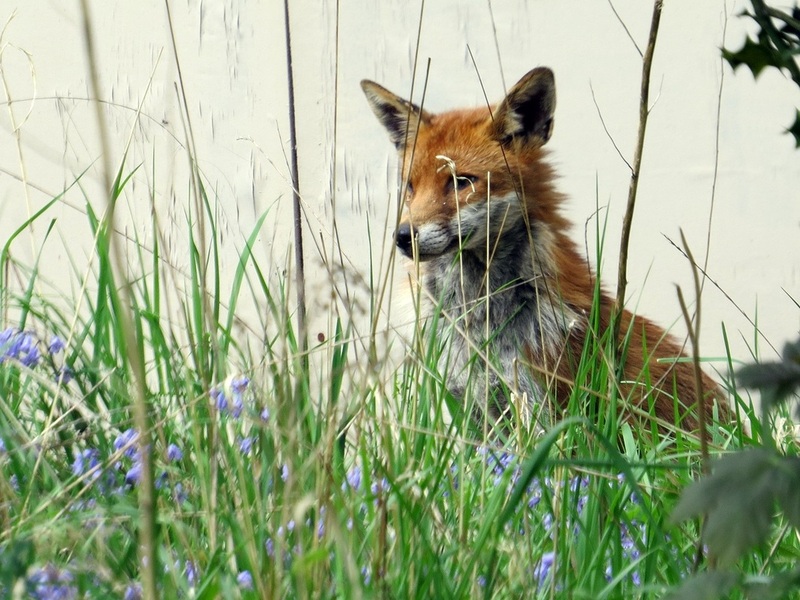 Some locals accuse the council of letting Robin Hood just go to rot. 45 per cent of the new builds will be “affordable” which includes “intermediate” rents being set at up to 80 per cent market rates. 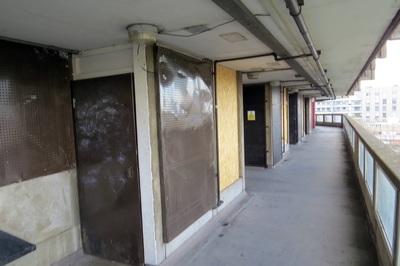 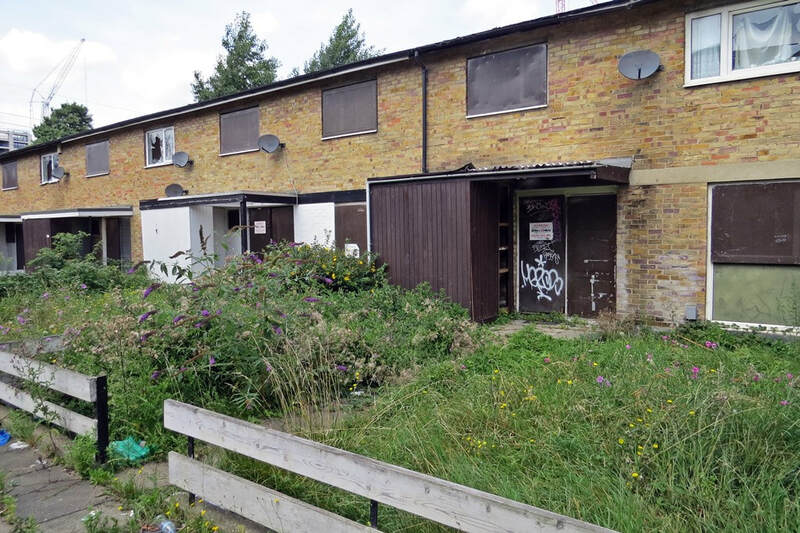 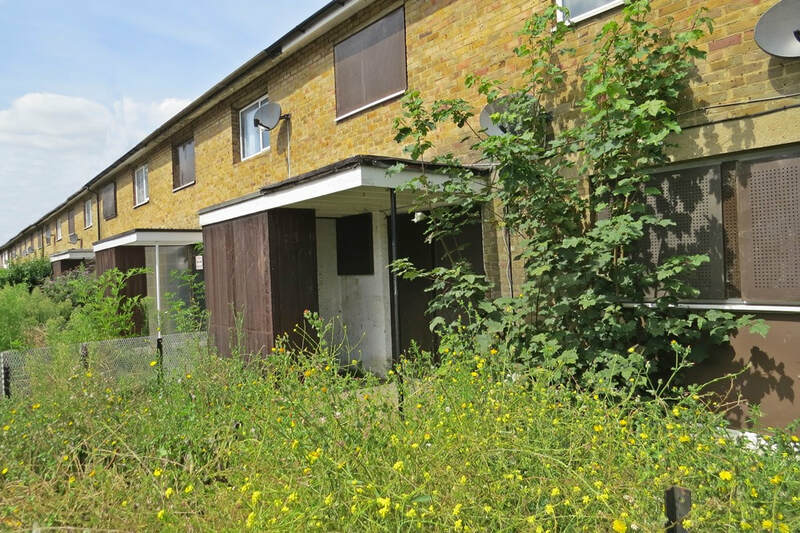 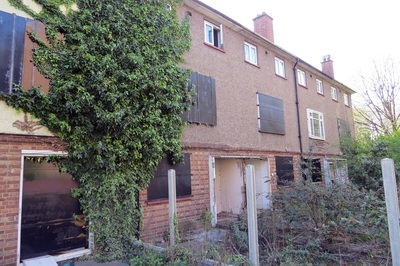 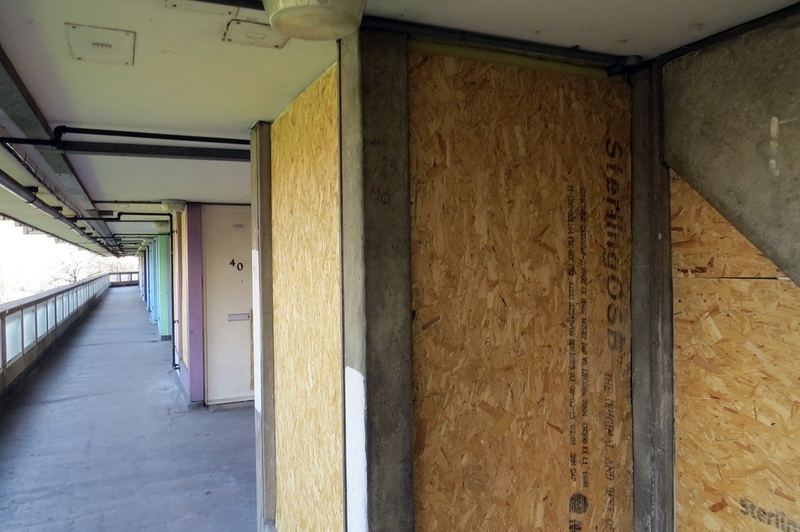 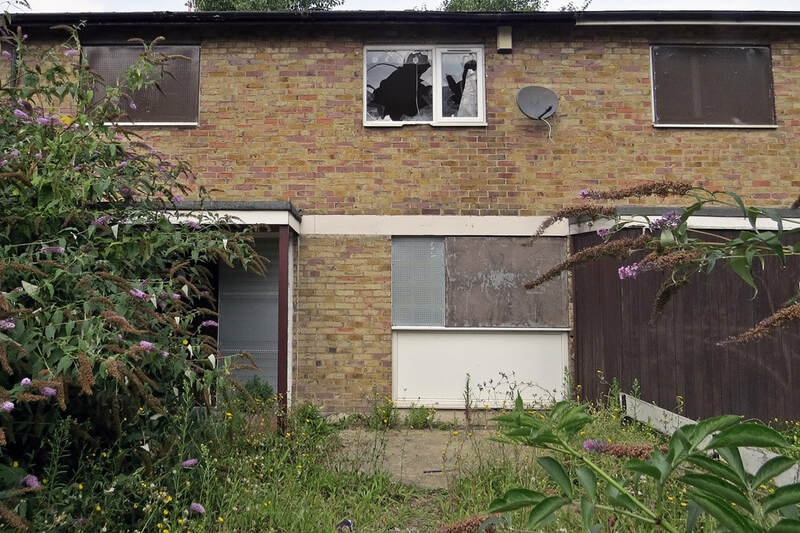 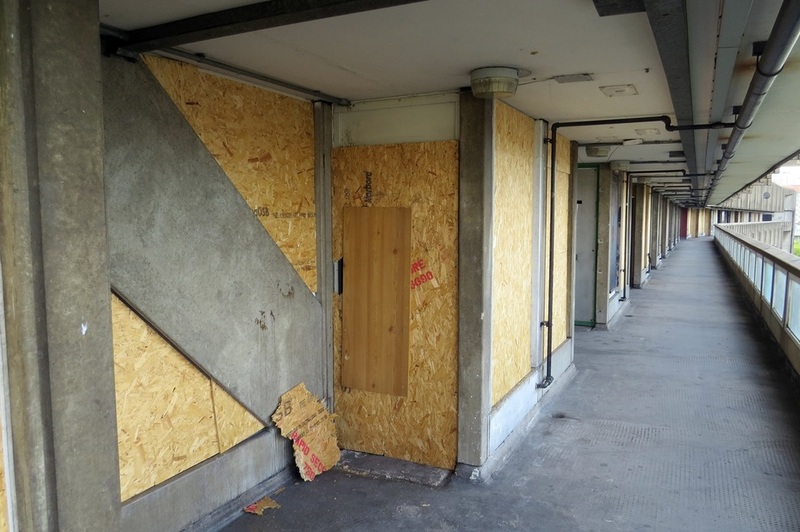 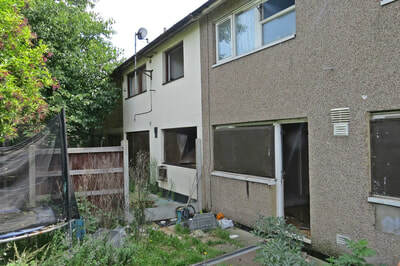 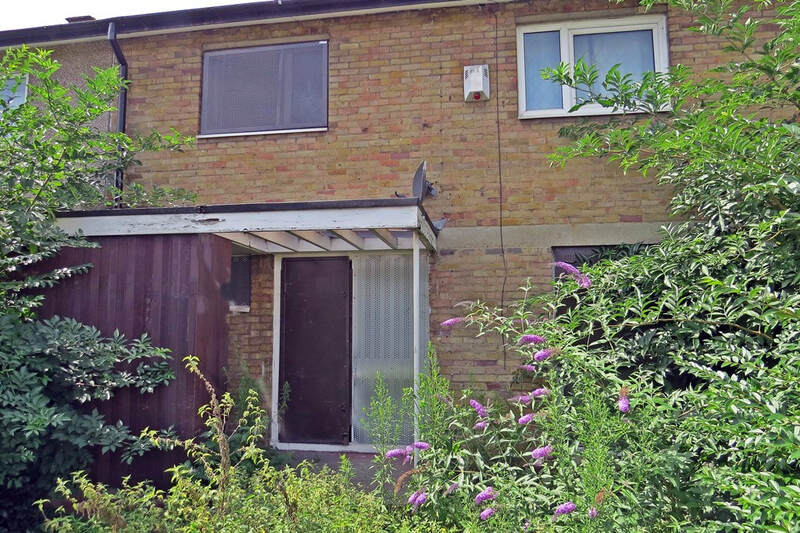 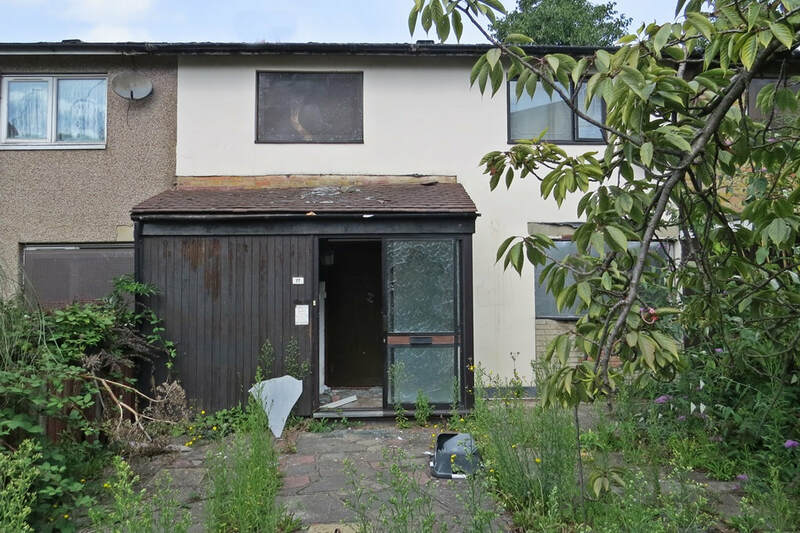 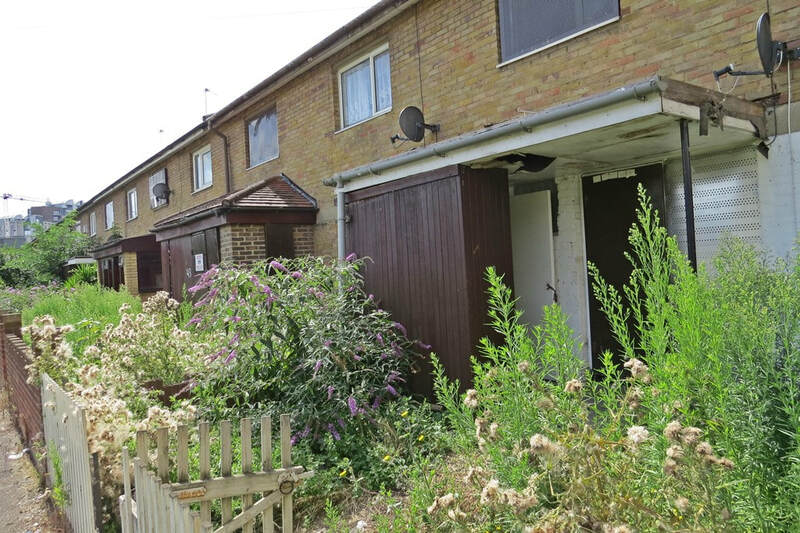 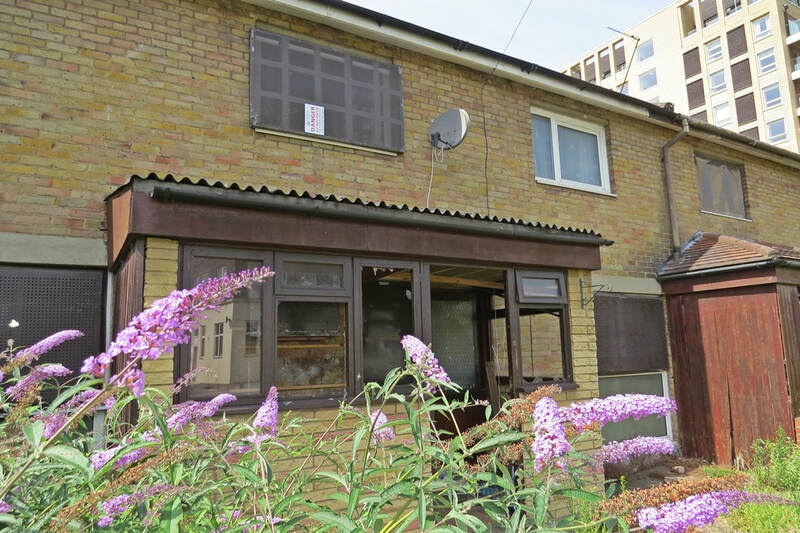 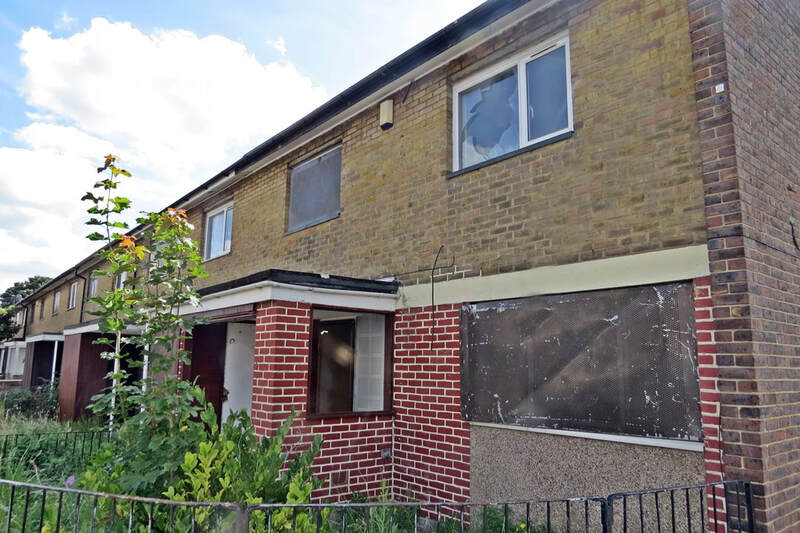 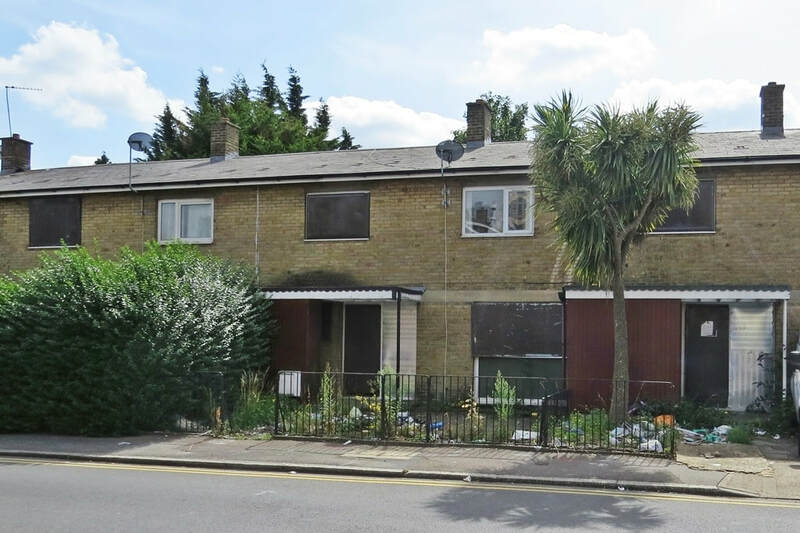 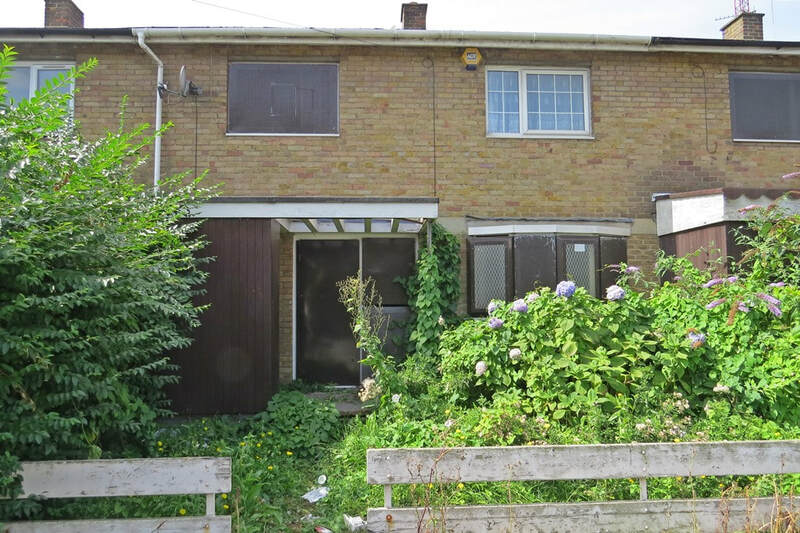 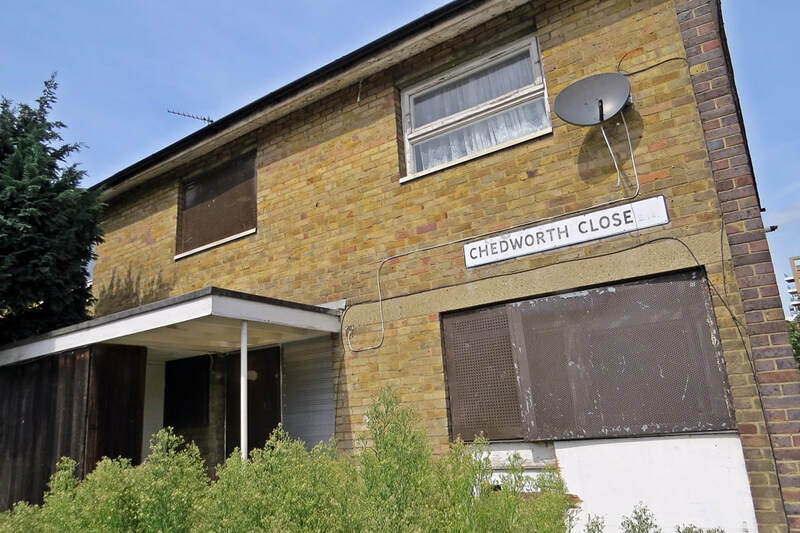 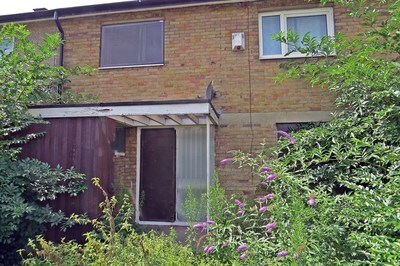 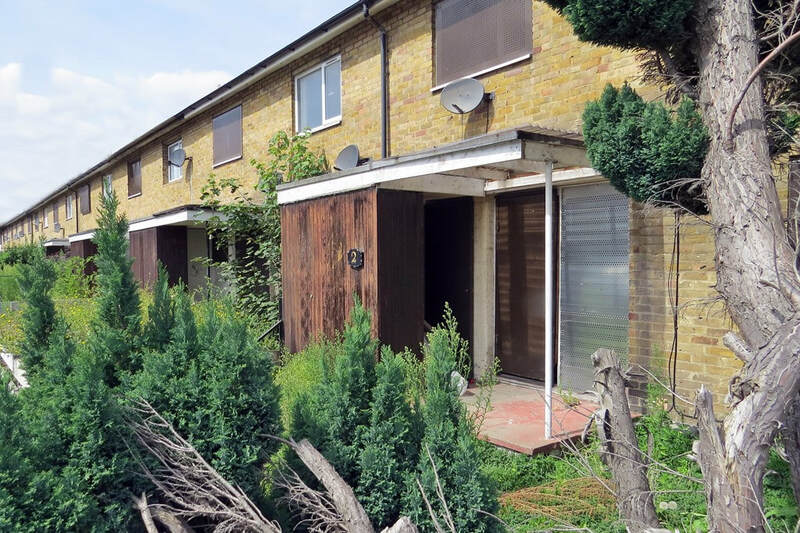 The low level properties are empty and boarded up and one of the two large blocks is empty apart from a couple of leaseholders. 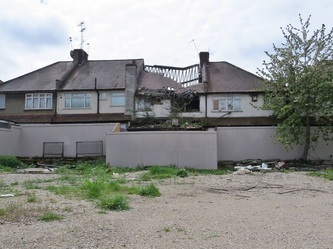 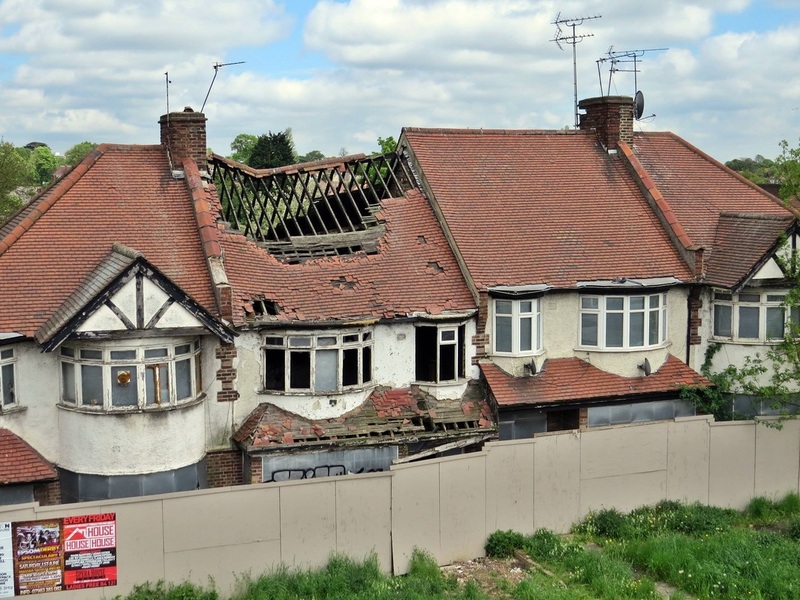 This late 15th century thatched timber-framed house near Hounslow was ravaged by fire in 2003 and has decayed considerably since then. The timber frame survives but the he building is unstable, and protective covering is now deteriorating. 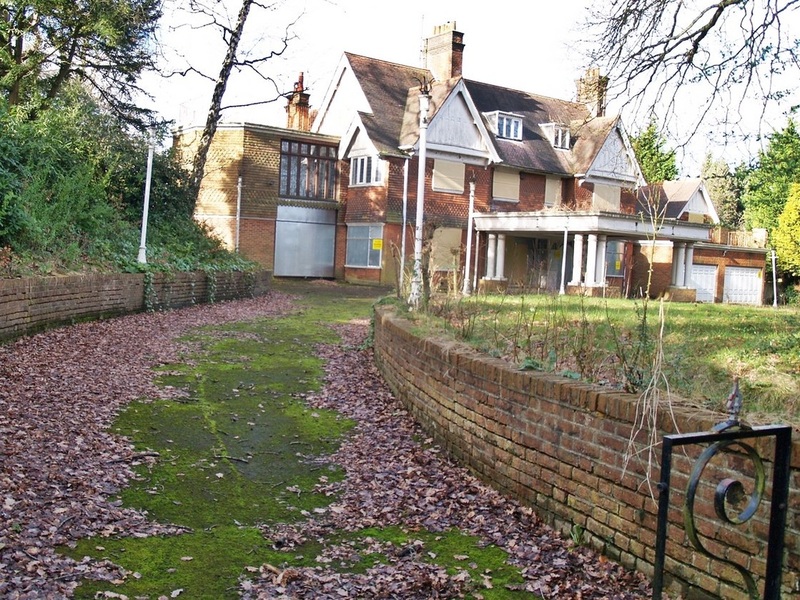 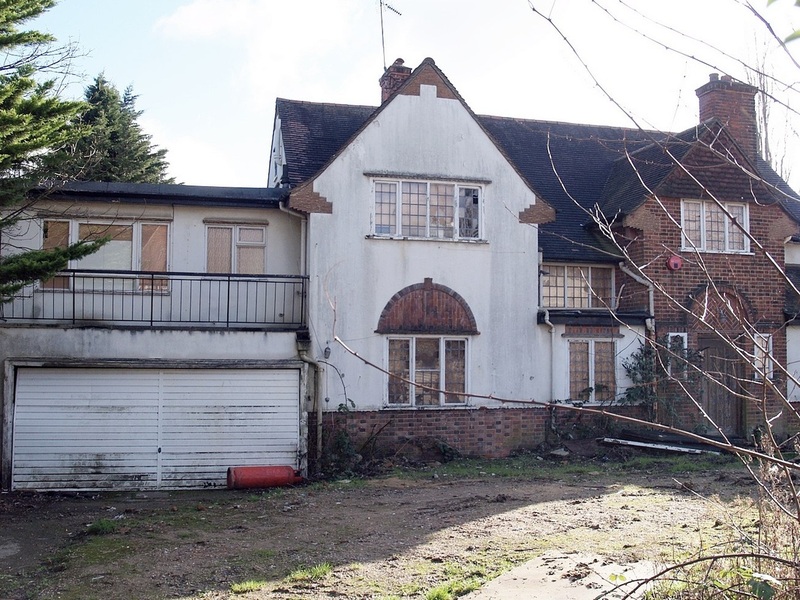 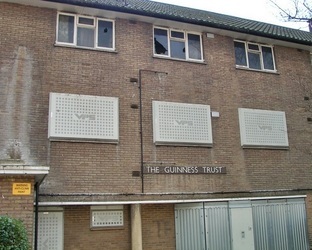 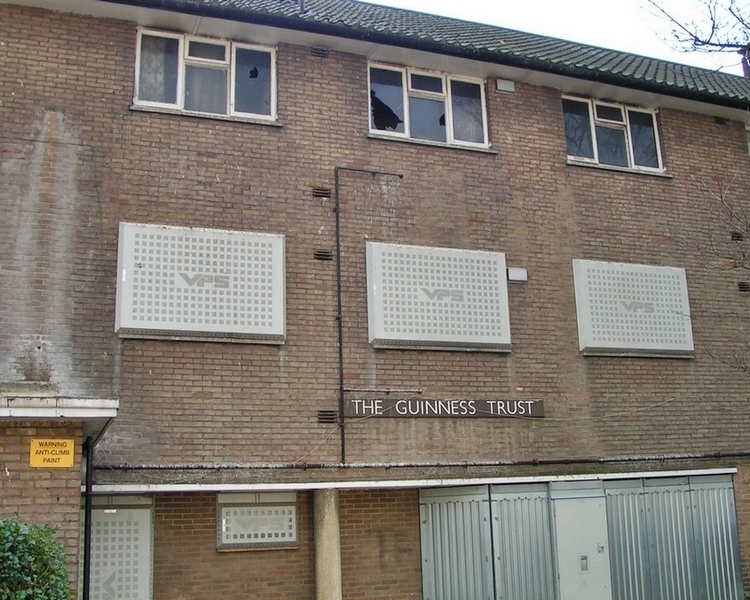 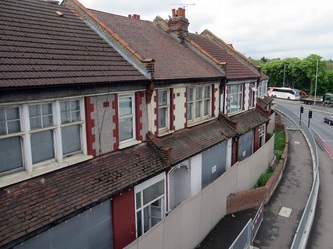 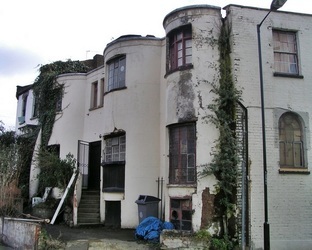 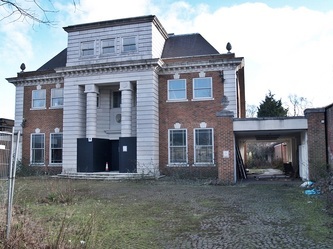 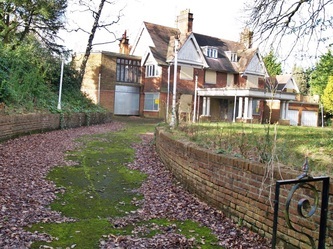 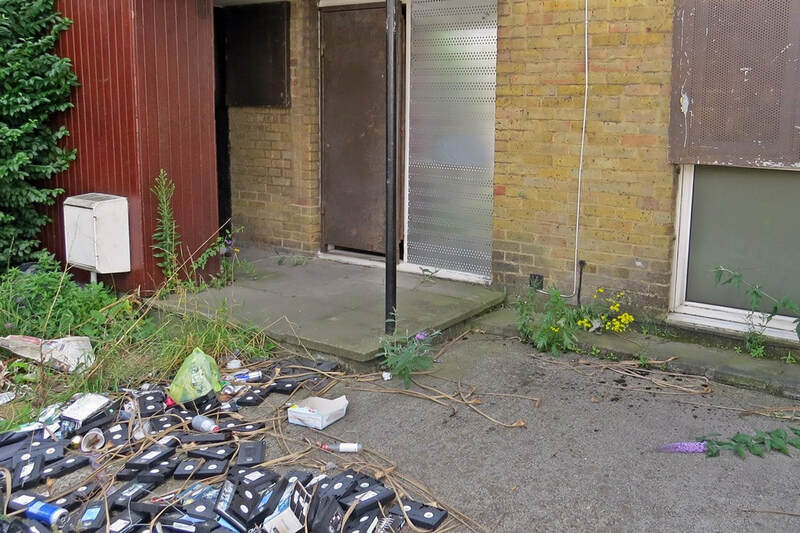 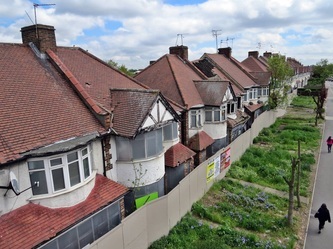 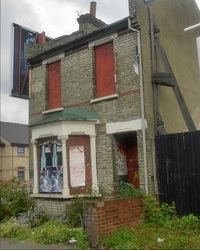 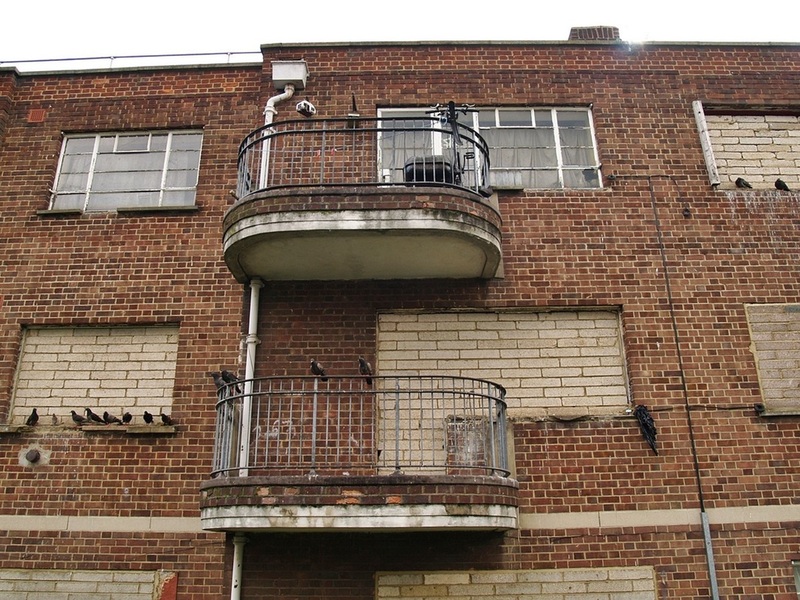 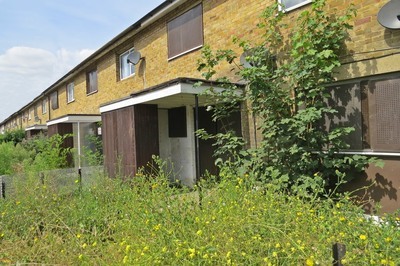 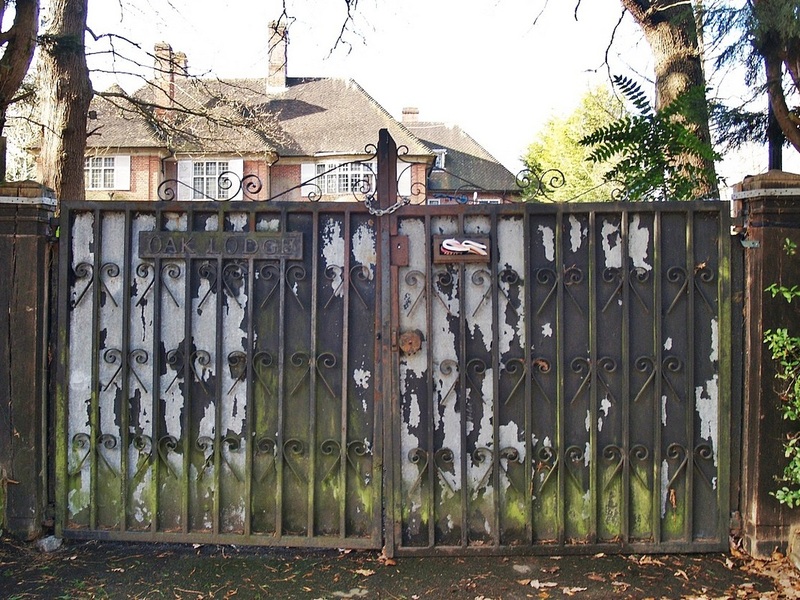 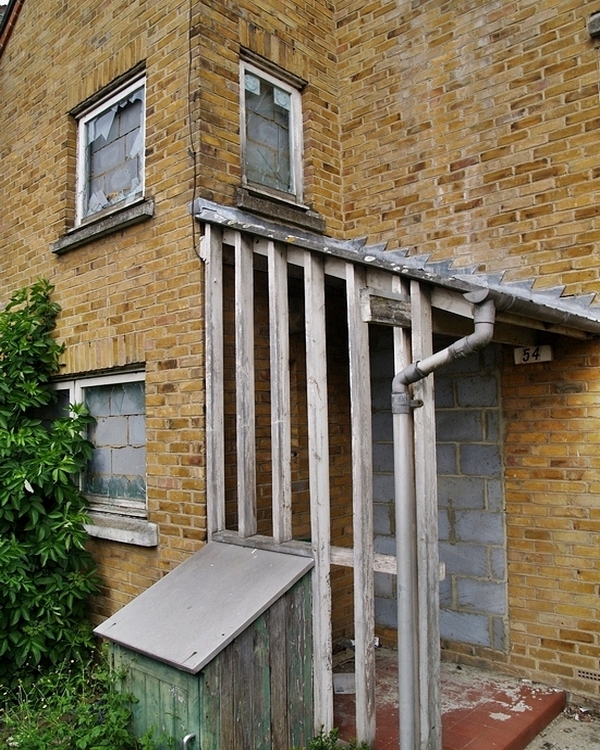 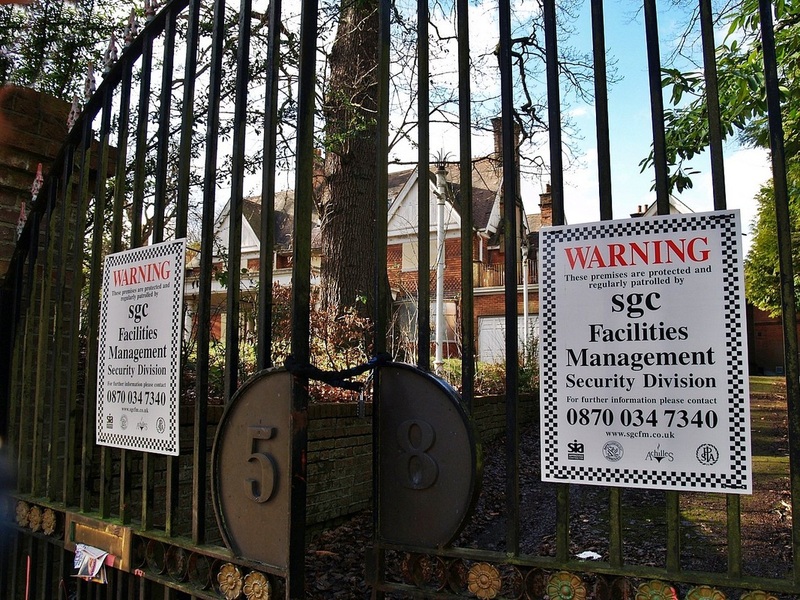 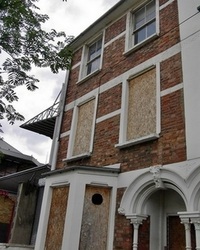 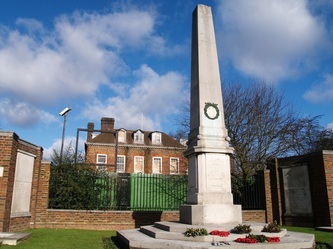 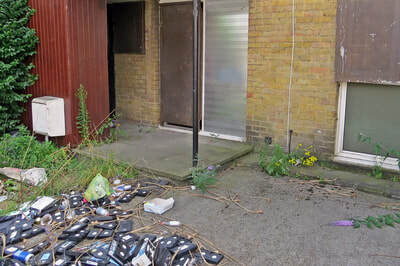 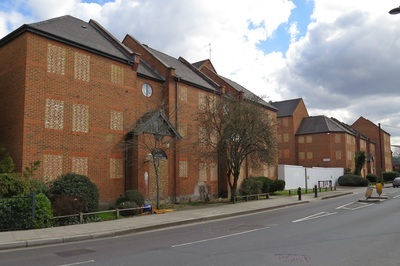 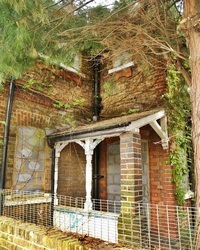 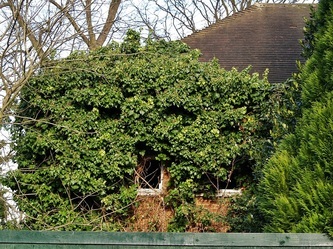 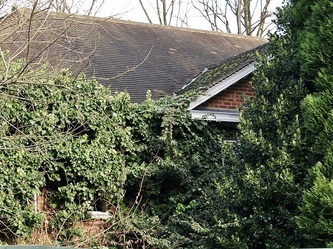 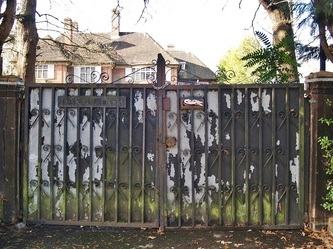 The council is monitoring the site and has taken several actions against the current owners to make them keep the site tidy and secure.A stalemate has developed between the building's owner and Hounslow Council, which has rejected several planning applications including one for a 55-bed nursing home on the site. 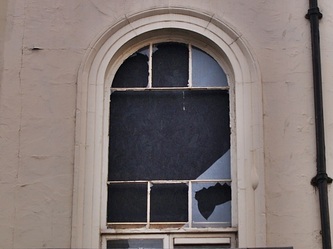 The owner, who is now proposing turning the site into a hotel, claims that the building is now beyond repair and would have to be rebuilt from scratch to be restored to its original glory. 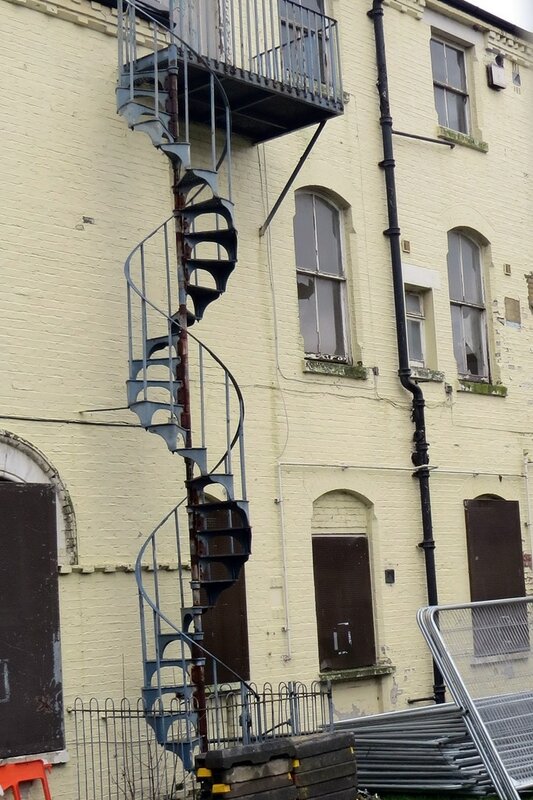 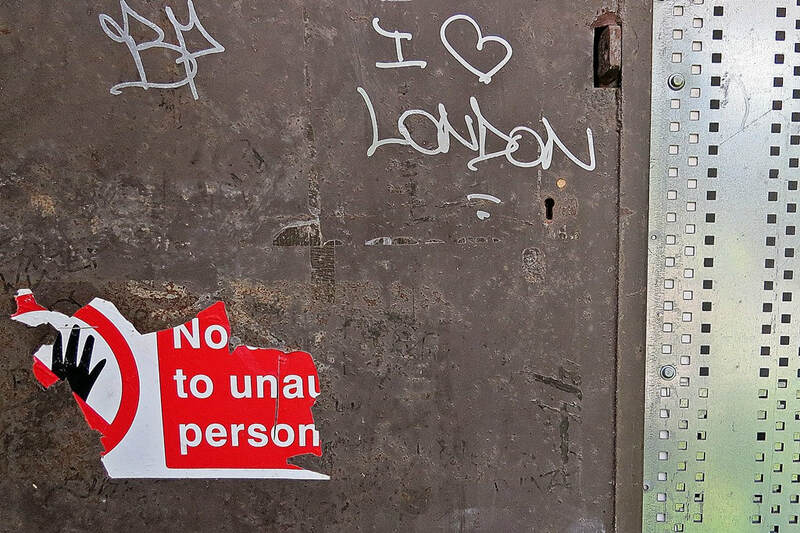 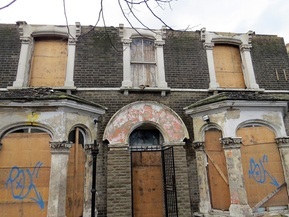 This building is extremely unsafe and I wouldnt recommend that any Derelict London readers attempt to enter it. 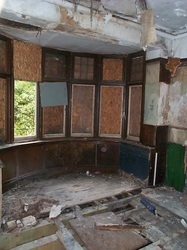 Poor old St Mary’s Lodge. This has featured on the Derelict London website since very the early days and this building's decline has been particularly depressing. 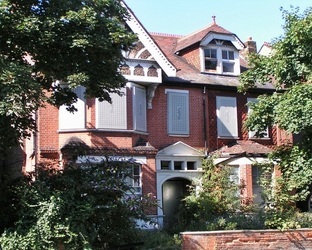 Designed and constructed in 1843 by one of the leading architects of the day, John Young (who also designed the Royal Marsden Hospital), it was built for himself, his wife, their nine children and two servants and incorporates some wonderful architectural flourishes, such as arched windows and terracotta brickwork details. 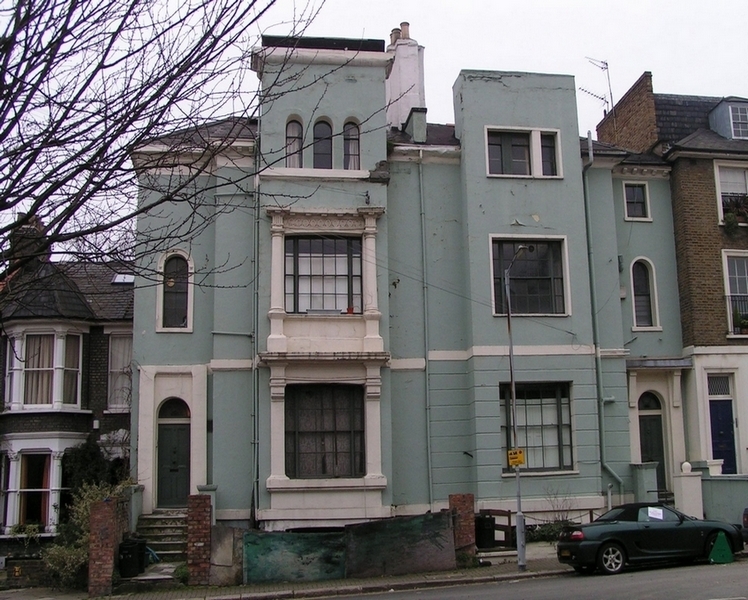 Young enlarged the house in the 1860s and also added an elegant garden at the rear. The Youngs remained at St Mary’s Lodge until John Young’s death in 1877, after which it remained a family home until 1959. 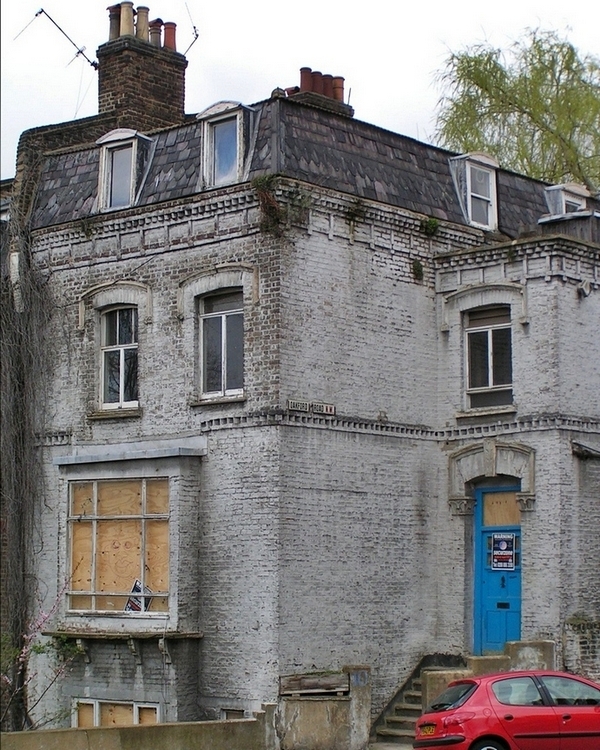 From the early 1960s, the local authority used St Mary’s Lodge as a women’s hostel, offering refuge to up to nine women at a time. 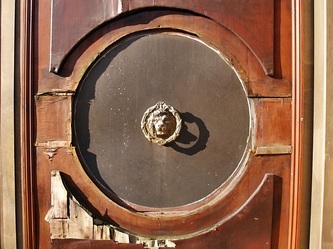 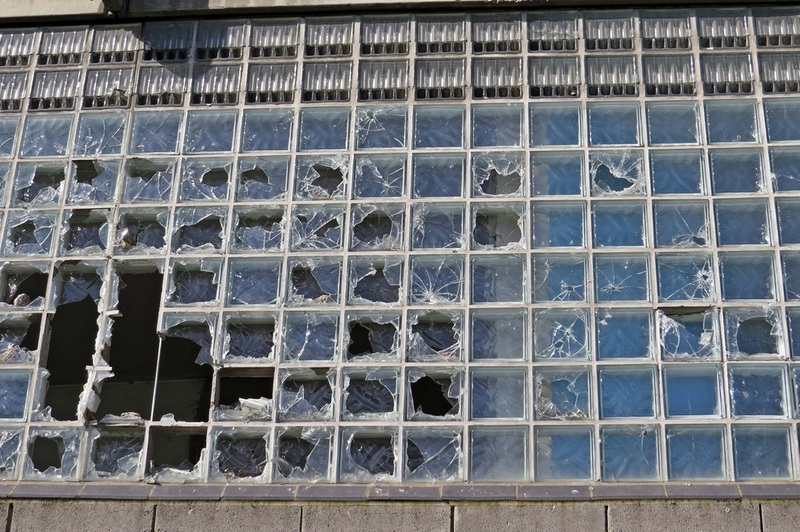 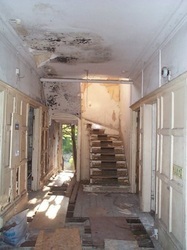 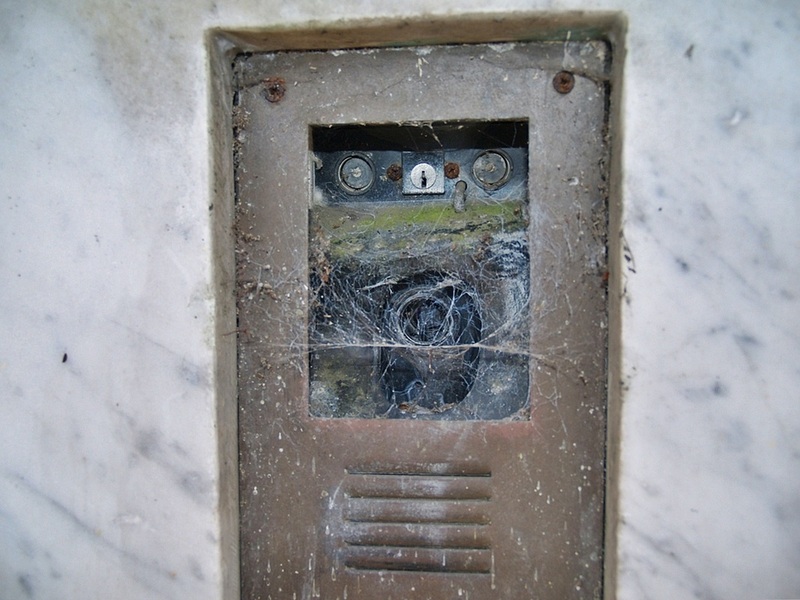 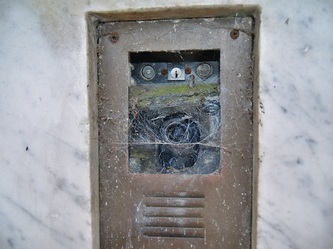 The hostel was closed in the mid-1990s and the building and grounds were left unmaintained and unsecured. 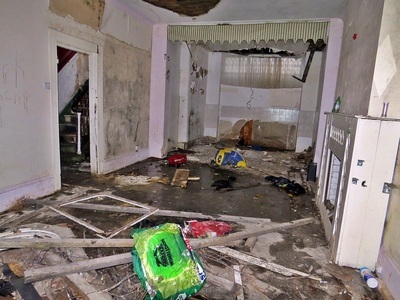 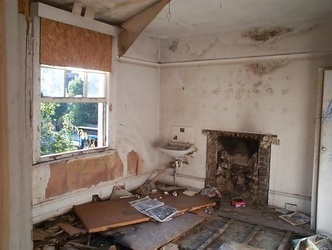 There was a major fire in 2005 and vandals, squatters and the elements have left the abandoned house and grounds in a poor state. 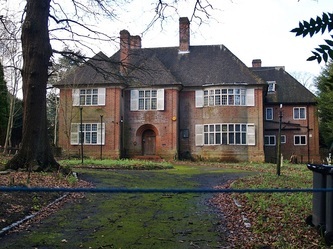 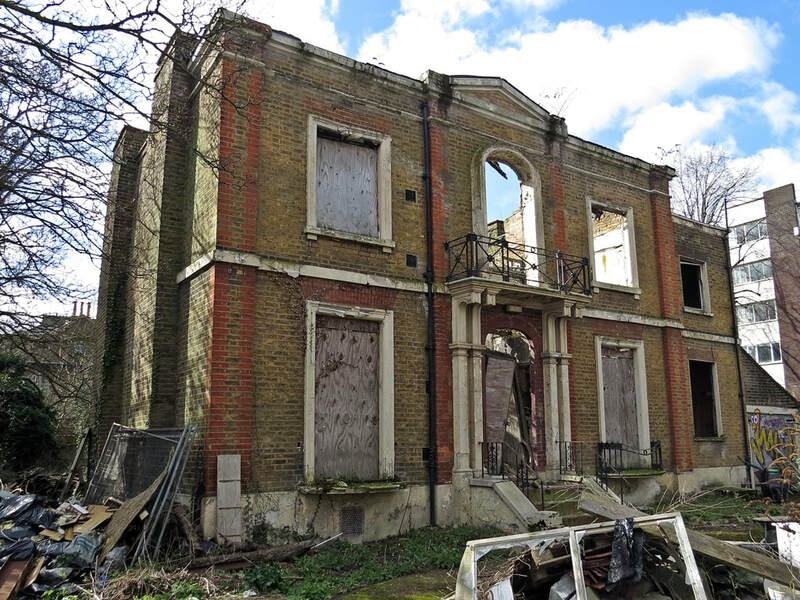 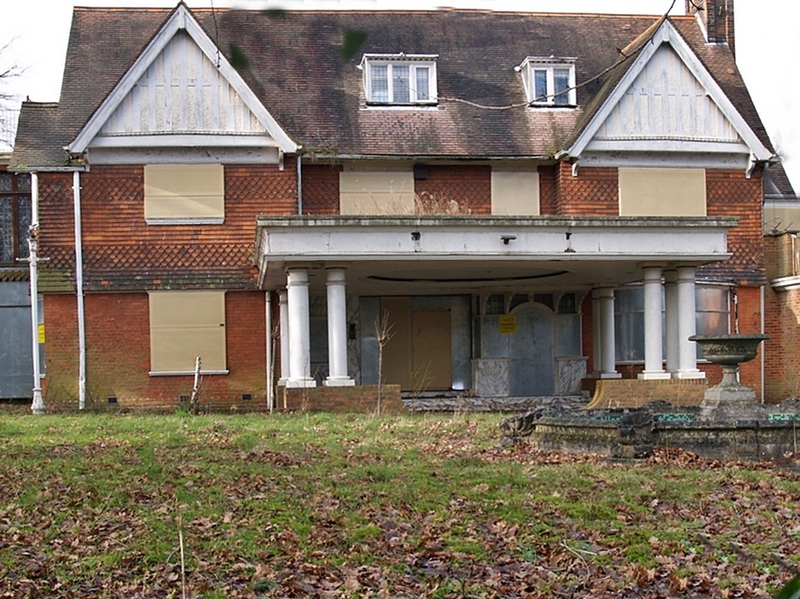 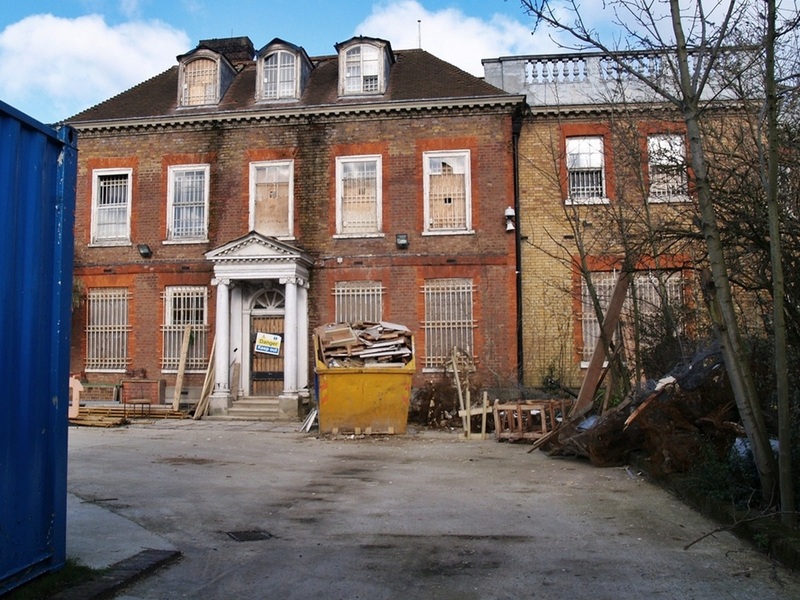 When I last wrote about this site in 2007 I said that St Mary’s Lodge’s future was uncertain - it still is in 2018 but in an even worse condition. 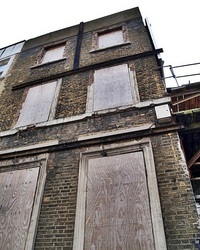 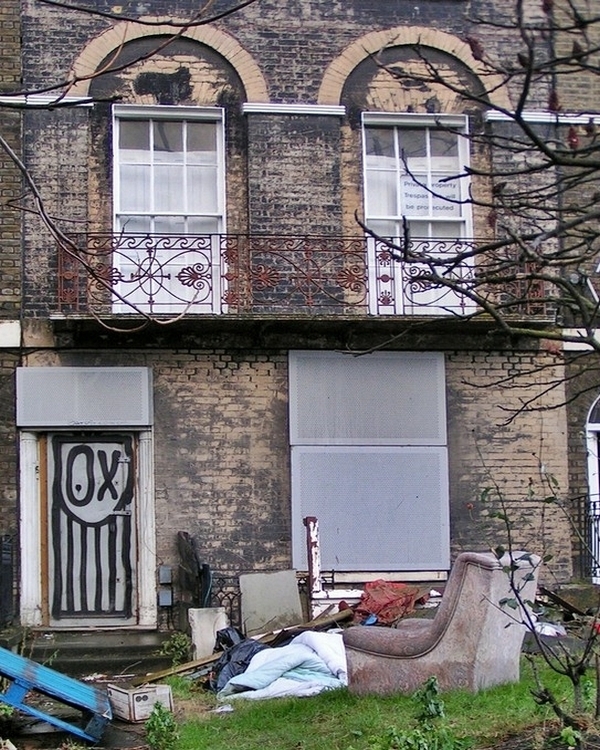 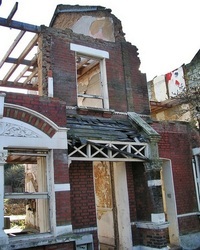 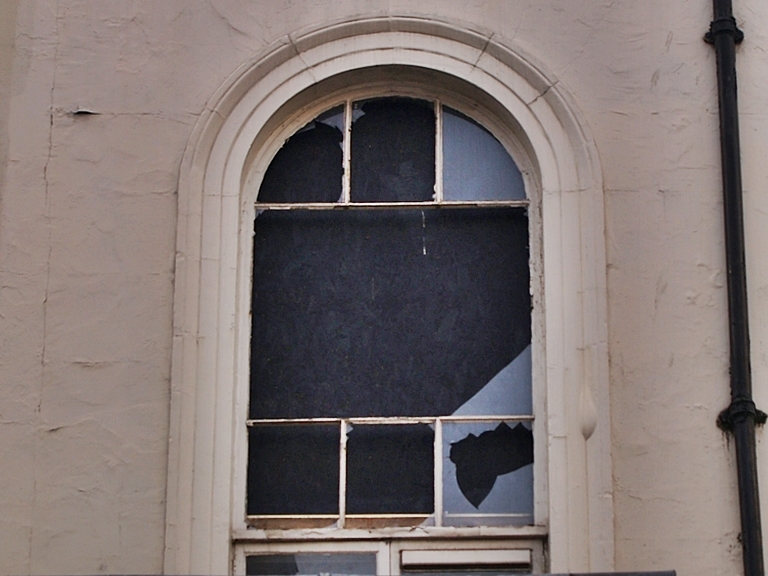 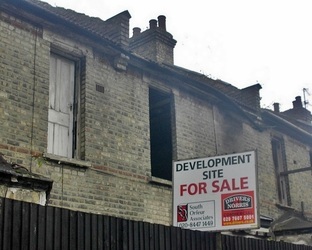 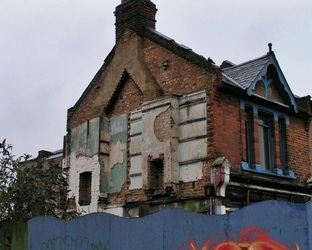 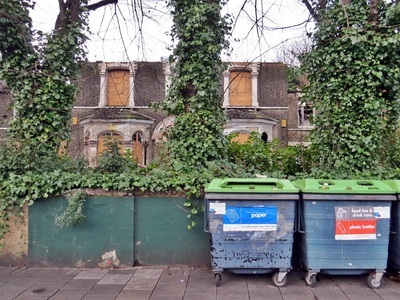 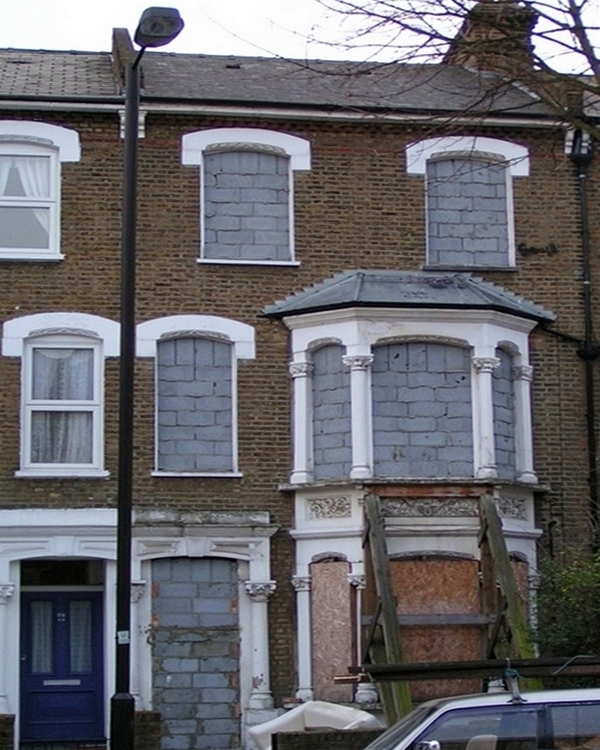 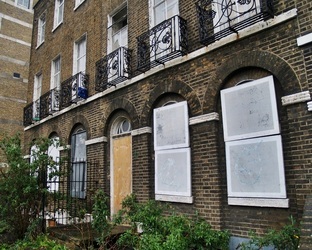 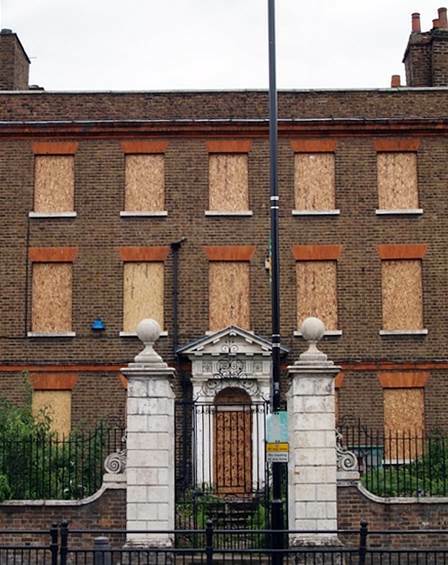 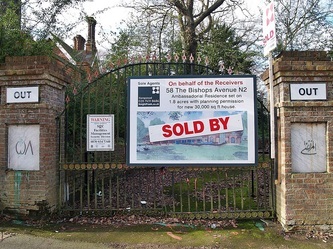 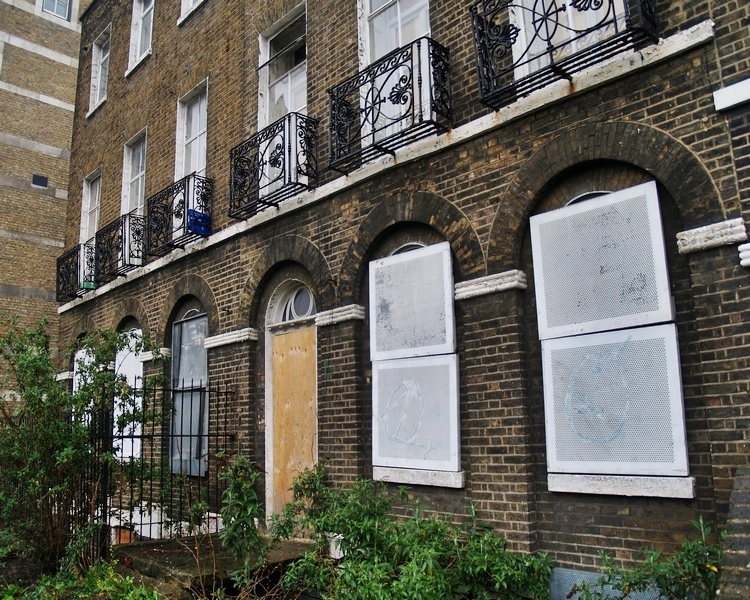 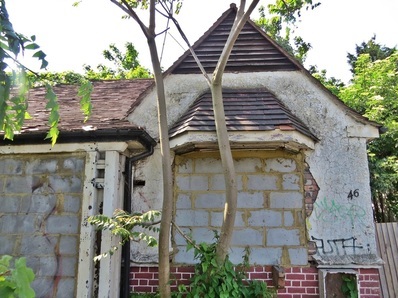 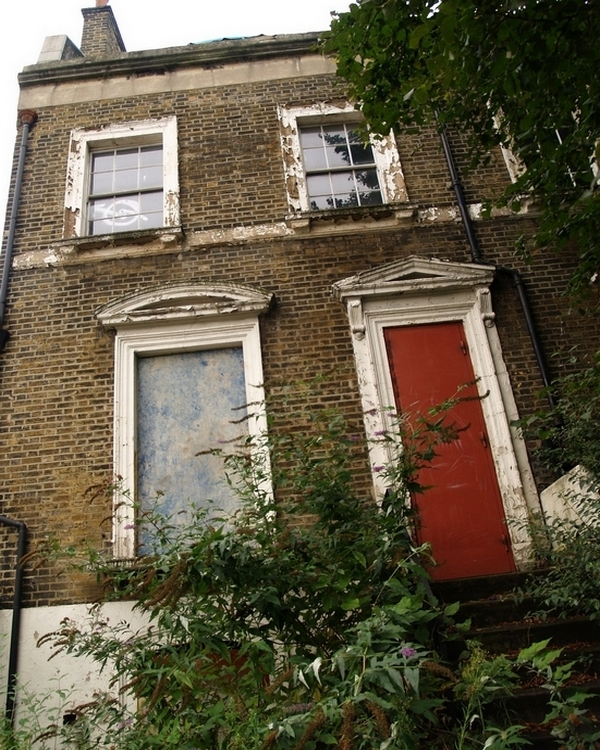 After years of unsuccessful negotiations between Hackney Council and owners proposed options as recent as 2017 include restoring the lodge on its own and turning it into a school, or transforming the whole site and also building affordable housing - there is a covenant that he site’s use is restricted to education or community use and was sold at an undervalue because of that covenant. There has been suggestion that the community could negotiate an alternative educational provision in return for allowing the site to be developed for residential purposes providing an income for a school on an alternative site. 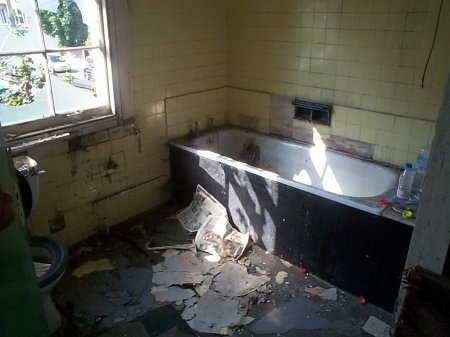 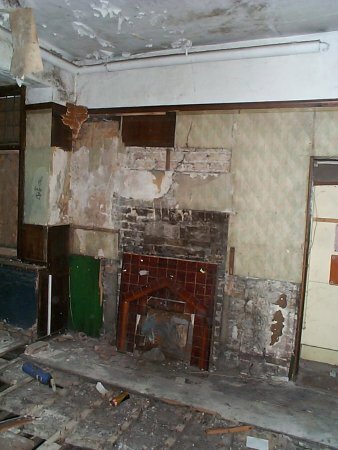 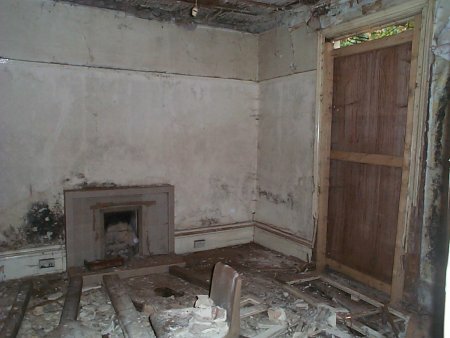 The pictures below were photographs of the derelict interior of St Marys are reproduced by kind permission of the stmaryslodge website - these were taken prior to the 2005 fire which gutted the place. 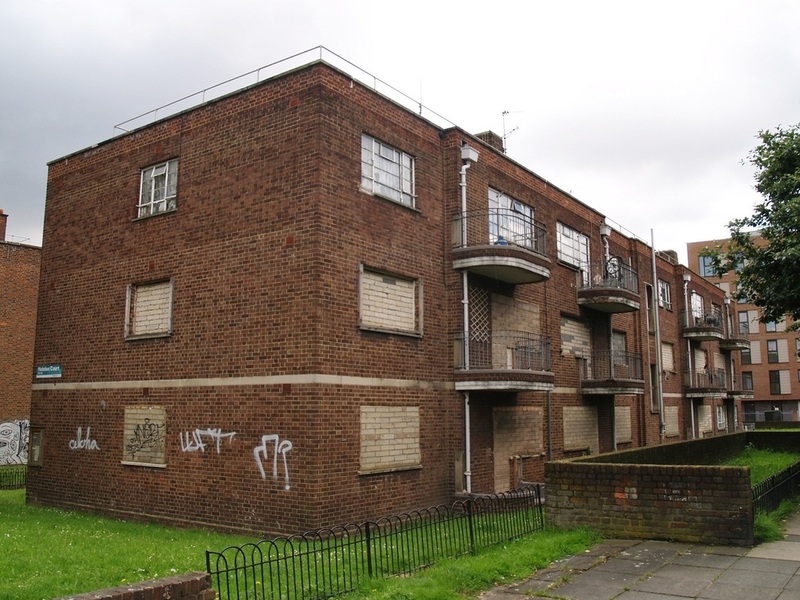 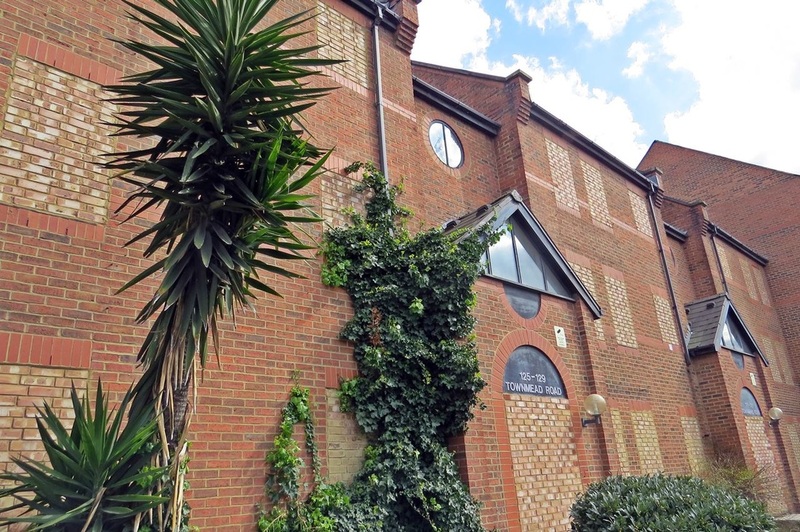 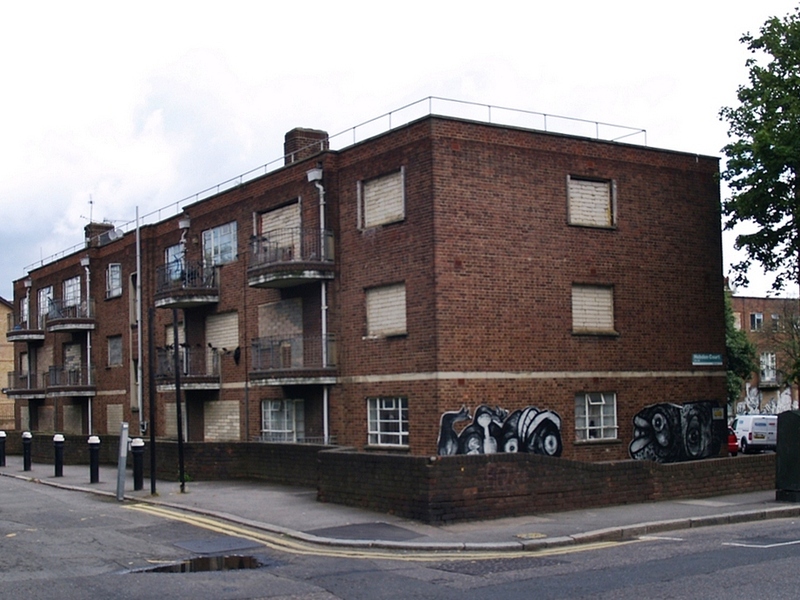 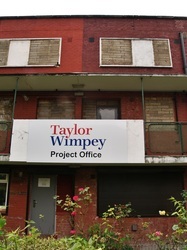 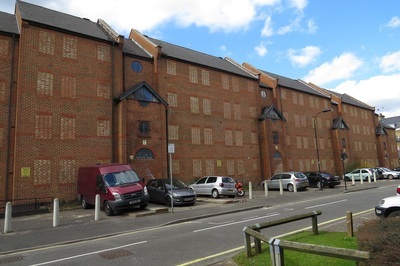 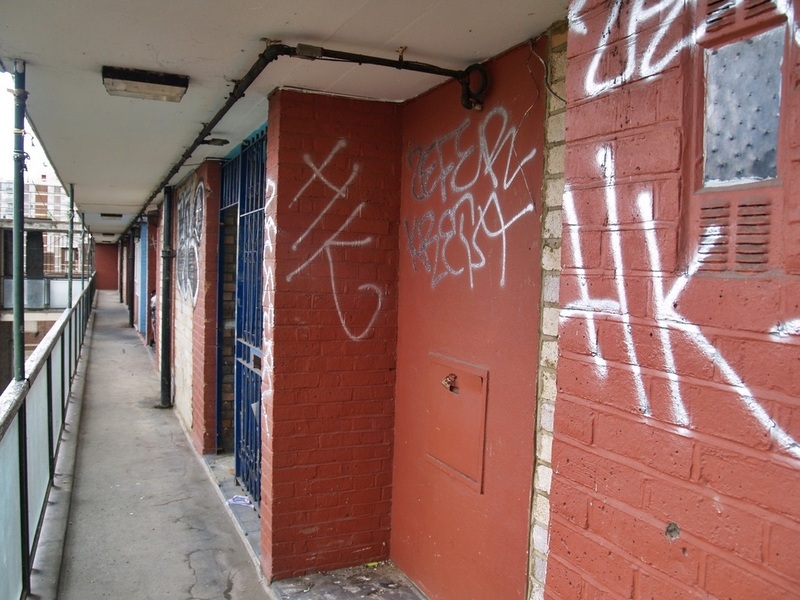 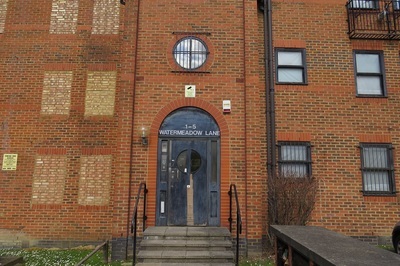 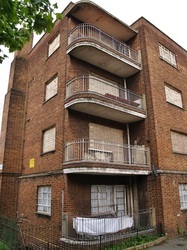 This 1980s council estate consisting of 80 flats was condemned by Hammersmith and Fulham Council in 2008 as it was deemed by the council to provide substandard accommodation as they said it provided cramped conditions. 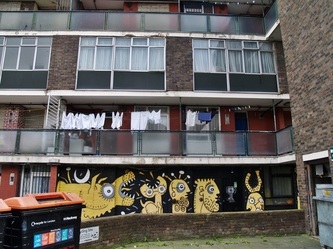 A few of the tenants were fed up at being told what was good for them and were not happy their neighbourhood being split up & being decanted elsewhere. 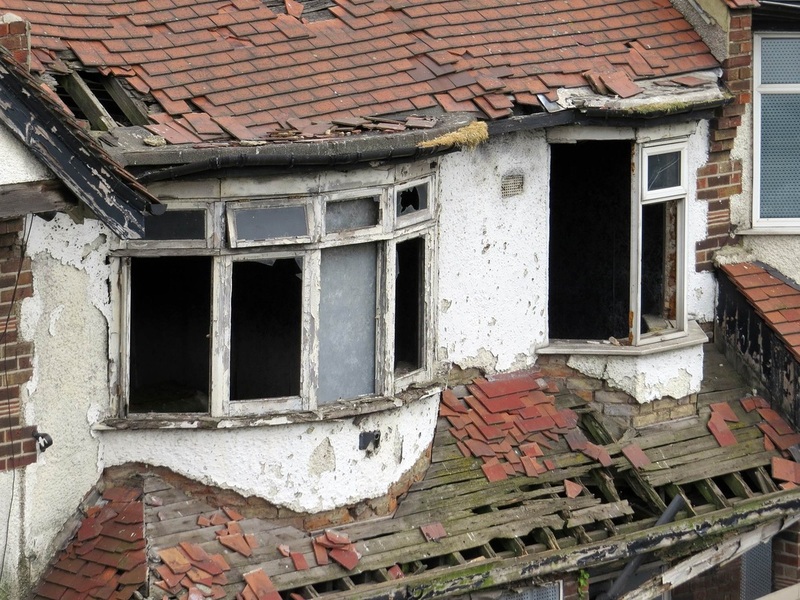 The blocks that are set for demolition include Charlow Close, Potters Road, Townmead Road and Watermeadow Lane. 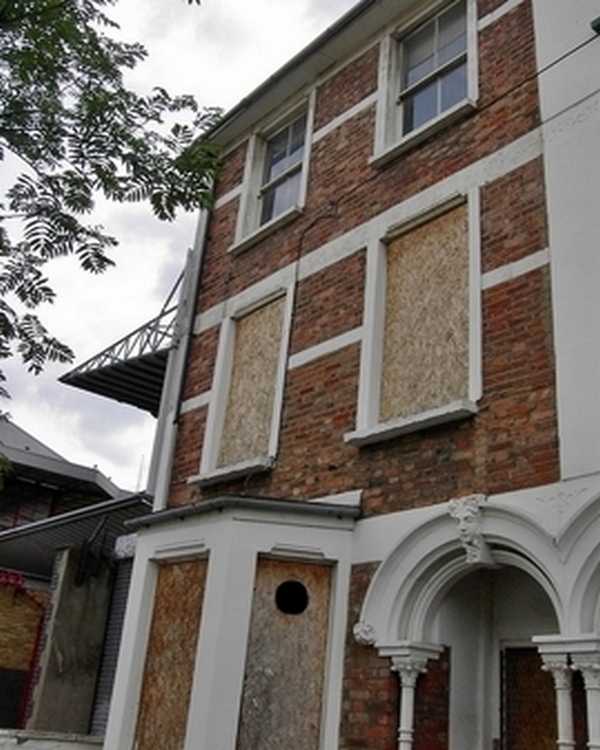 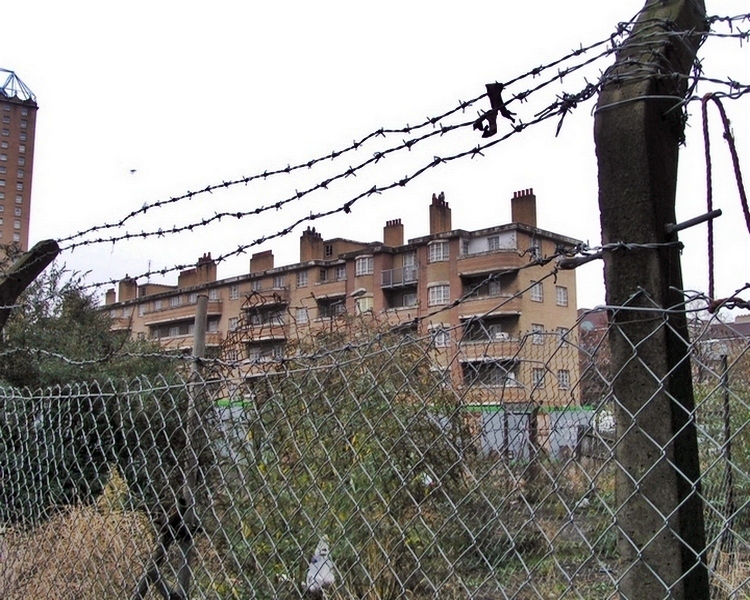 There is one leaseholder still hanging on in there which is delaying demolition. 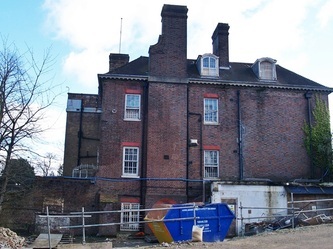 There are believed to be historic land contamination issues and having a cleared site would enable the Council to carry out further below ground investigative work before deciding what to do with this 1.2 acres of prime real estate worth millions of pounds adjacent to Chelsea Harbour Club and within spitting distance of the Thames in this affluent part of town. 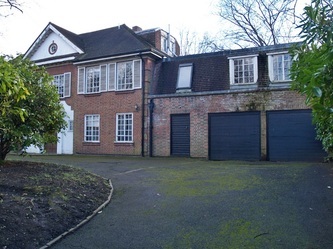 Heath House is on the highest point in London situated on the edge of Hampstead Heath. 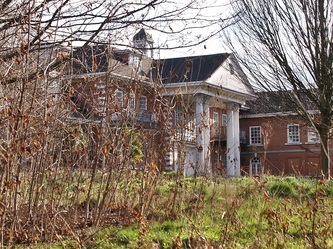 Heath House was occupied by Samuel Hoare in 1790. Hoare was a Quaker banker who lived there until his death in 1825. 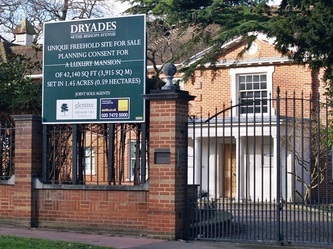 Hoares Bank continue to this day as the UK's leading independent private bank & remain wholly owned by the Hoare family. 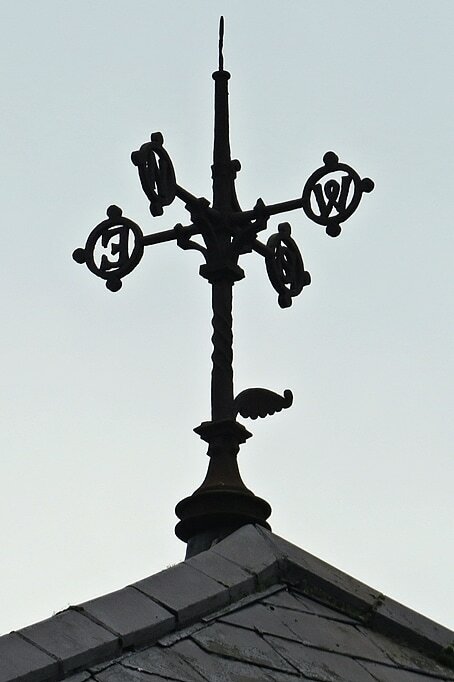 It is said that from its roof, you can see six counties on a clear day. It seemed to have been empty for quite a long while but as of 2018 is now been renovated. 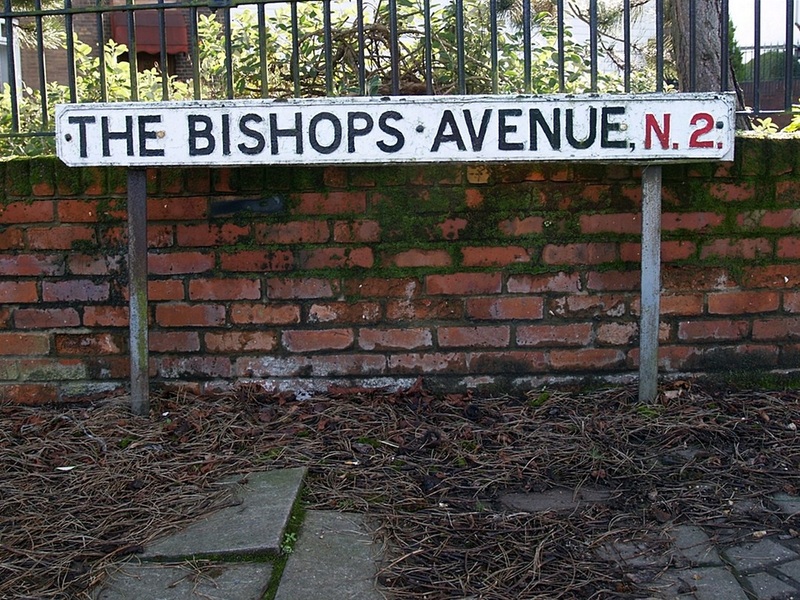 The Bishop's Avenue connects the north side of Hampstead Heath to East Finchley. 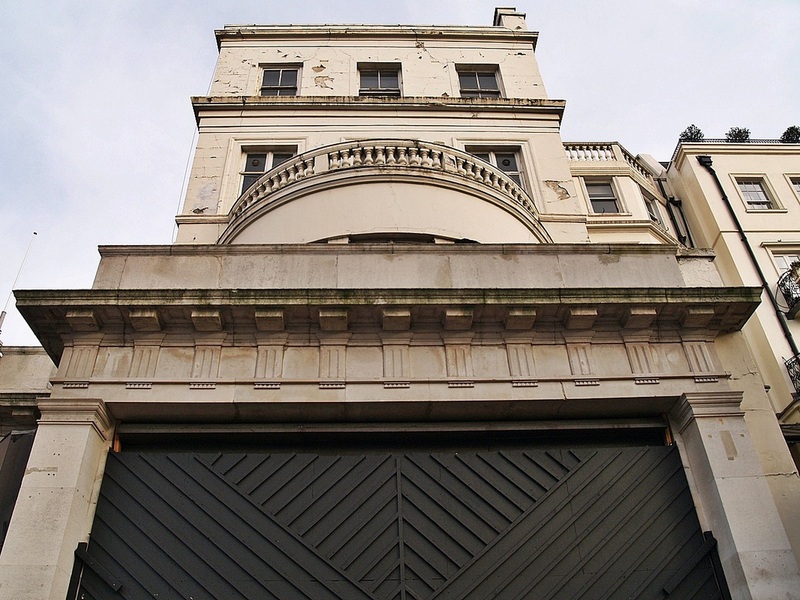 It is considered to be one of the wealthiest streets in the world - maybe London's answer to Beverly Hills? 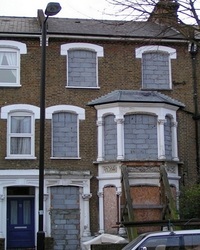 The road is often referred to by its nickname of "Millionaires' Row" or "Billionaires' Row". 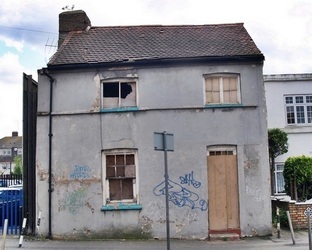 In 2006, the smallest houses in the street were selling for £5 million while a larger house sold to the President of Kazakhstan for £50 million in 2008. 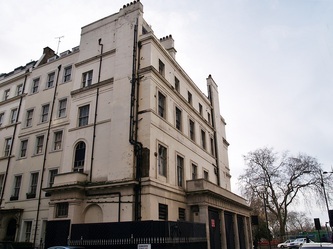 It is understood the Saudi Royal Family own ten of the street's properties, with other billionaire owners believed to be the Sultan of Brunei and Britain's richest man, Lakshmi Mittal. The houses are undeniably luxurious but many of the modern mansions just shows that money cant buy good taste. 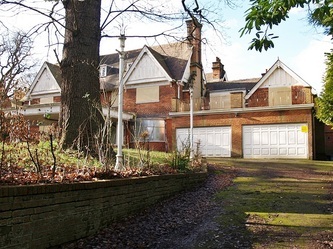 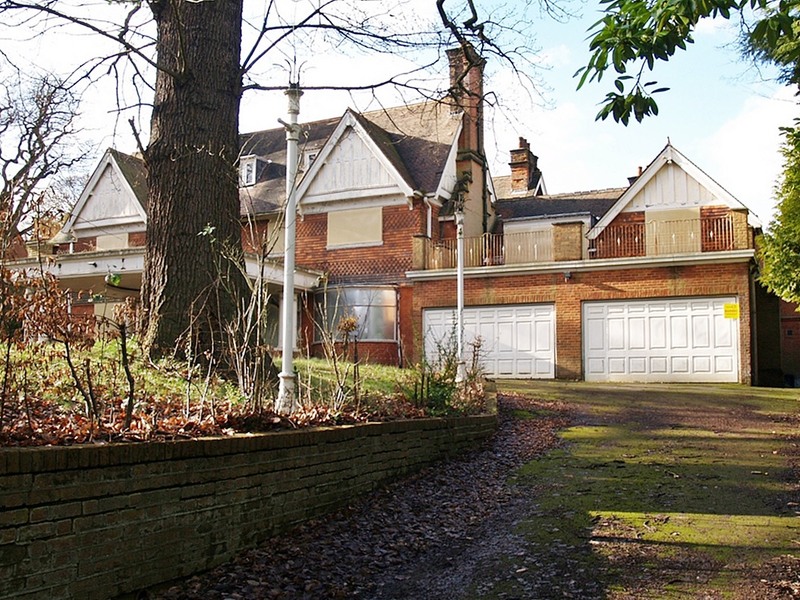 You can see Aston Martins & Bentleys within many of the landscaped grounds though many driveways are empty and covered with moss with no signs of life within the gates at all. 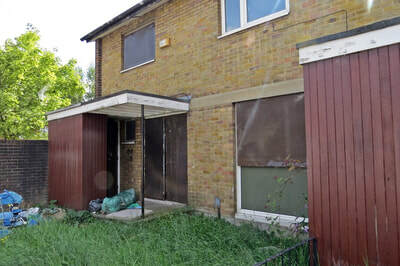 Whilst these rich people own these houses they dont often live in some of them and many houses sit vacant sometimes with caretakers and security or some are left to decay. 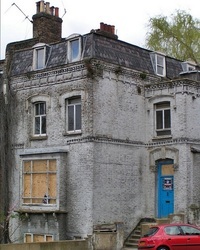 The trend seems to be to buy a vacant building and rather than do it up just demolish it and build another mansion. 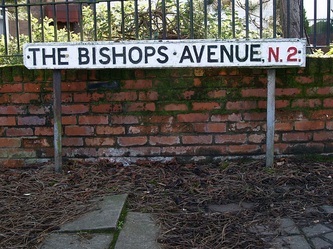 The Bishops Avenue has always invited intrigue. 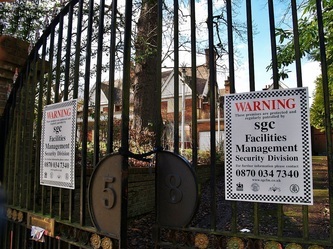 In 1984, Greek Cypriot fashion tycoon Aristos Constantinou was shot dead in his private chapel. 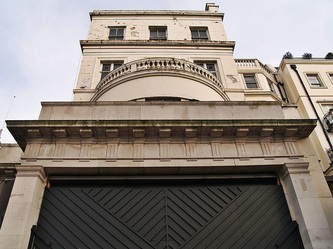 In the early Nineties, the street lost another prominent resident when Asil Nadir fled to Northern Cyprus to escape charges of theft totalling £34 million. 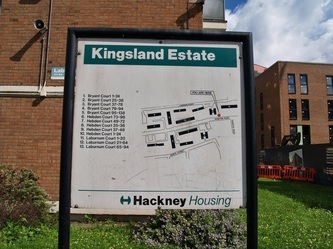 The Kingsland Estate was opened by the Mayor of Shoreditch in 1949 and in 2007 almost three-quarters of the residents on the estate voted in favour of the demolition and rebuild of the houses, and all of these apparently will be offered tenancies once the revamp is complete which gets underway soon. 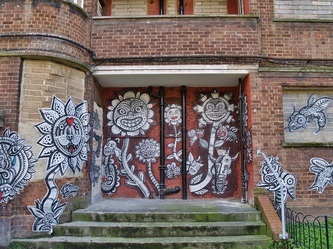 The artwork is by Egyptian Nazir Tanbouli. 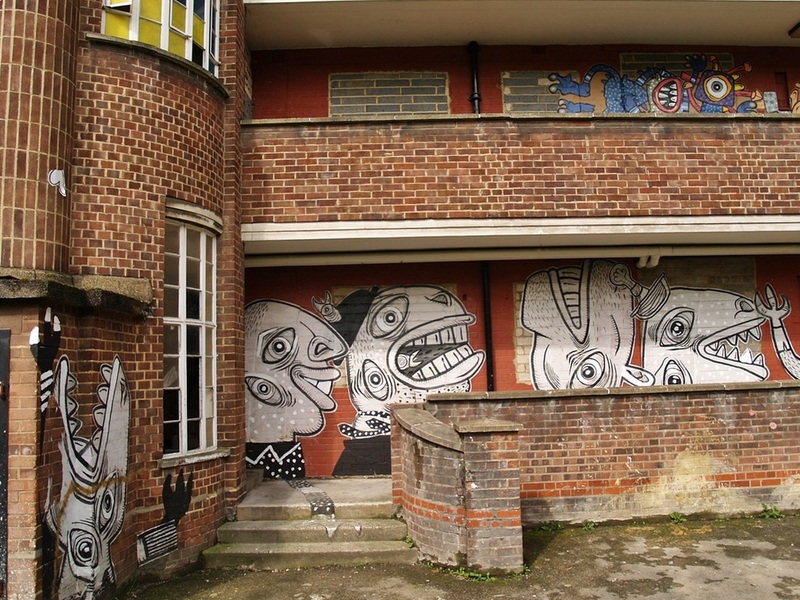 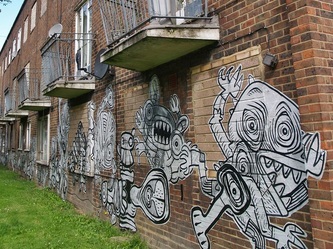 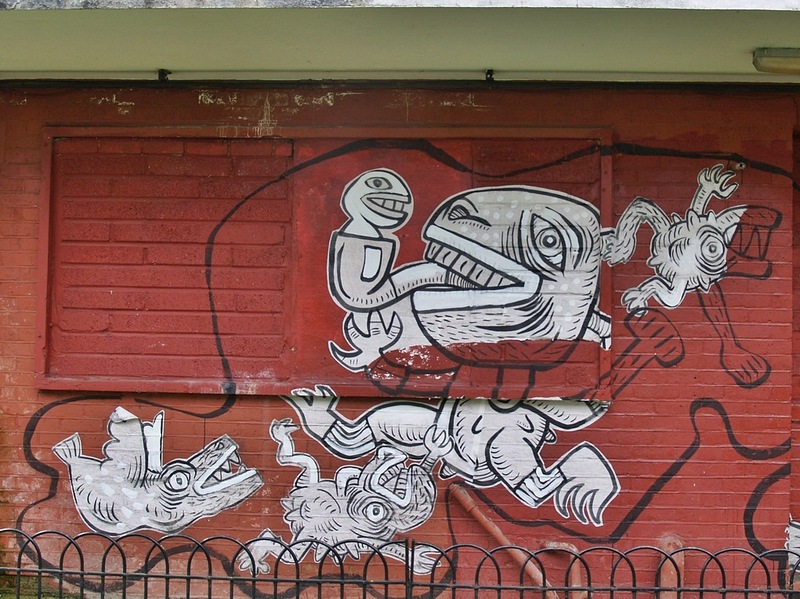 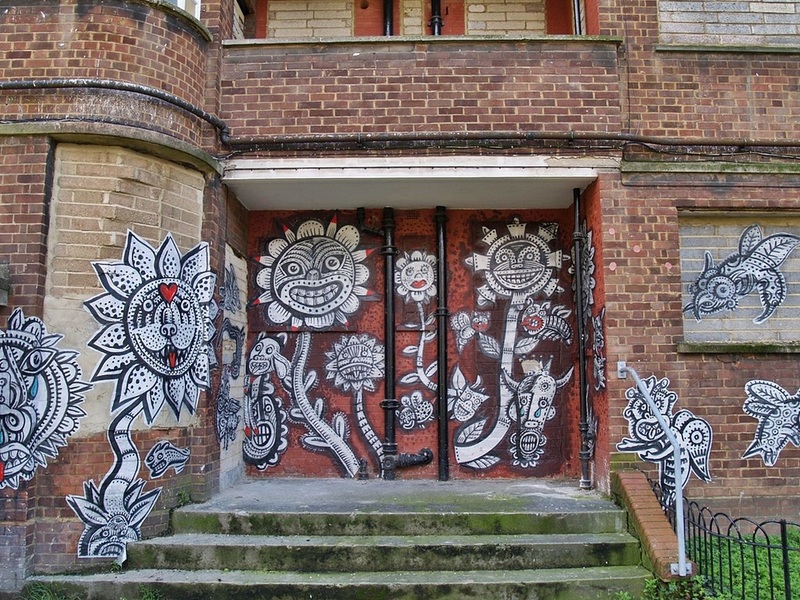 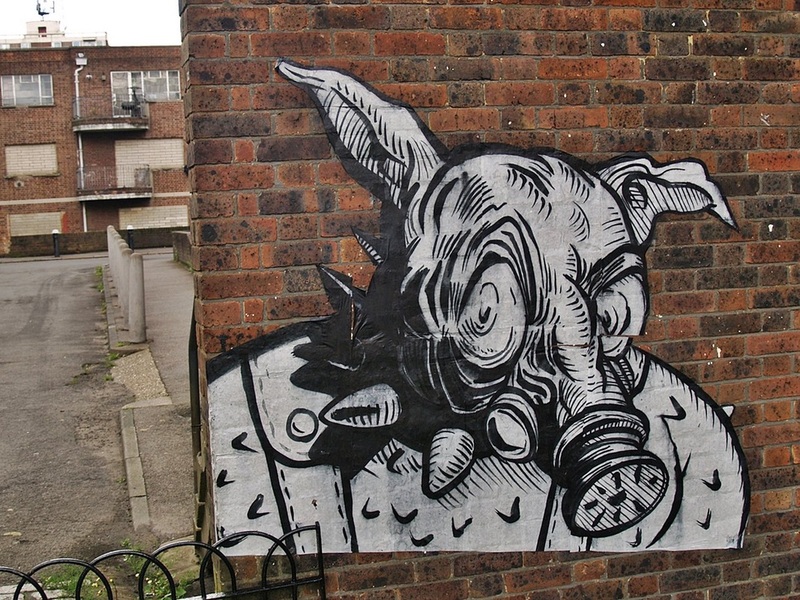 He was given permission by housing association L&Q to paint the outside wall of his studio, which is on the estate, on the basis that the whole place is about to be demolished later this year to make way for around 700 new homes. 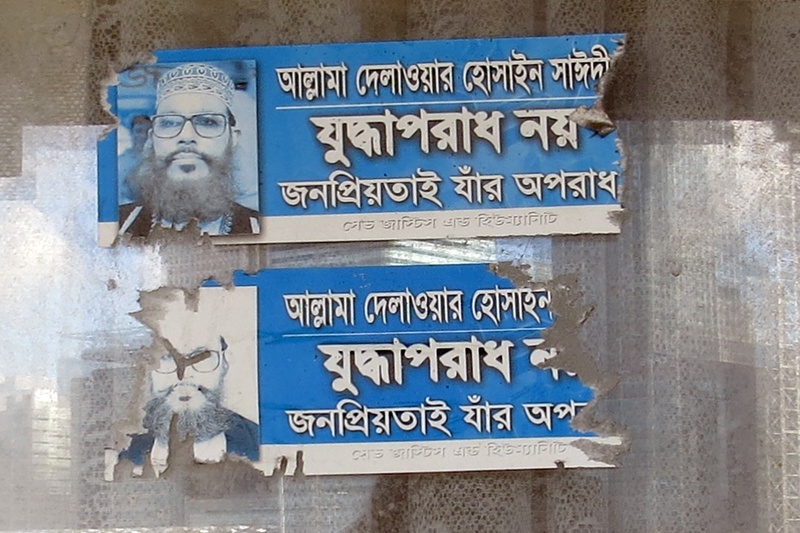 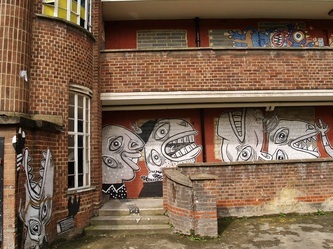 But his images were so popular with the remaining locals he was given permission for an open canvas of the whole estate. 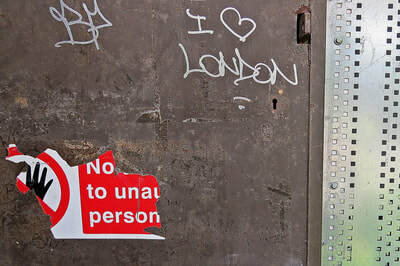 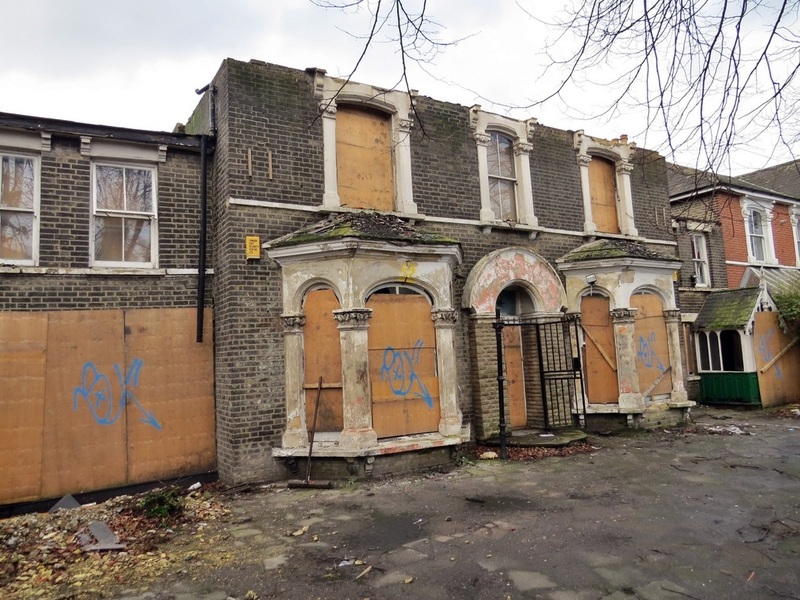 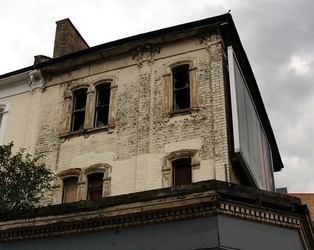 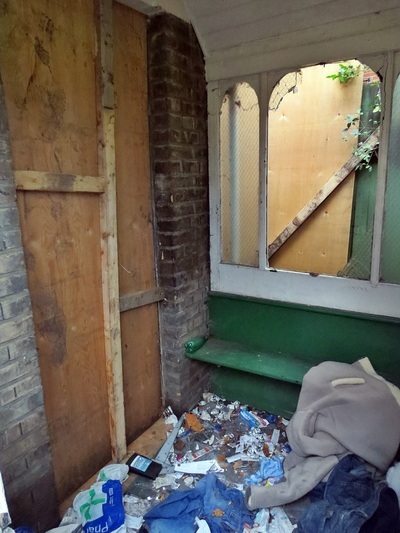 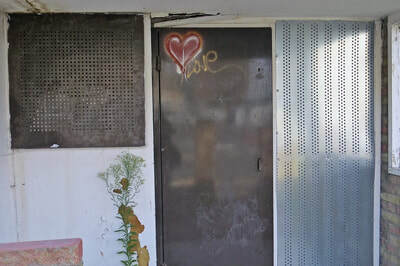 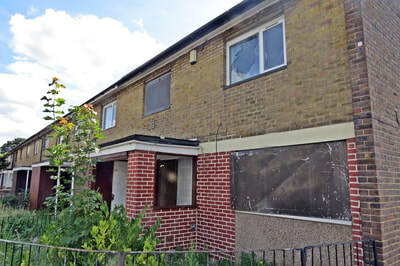 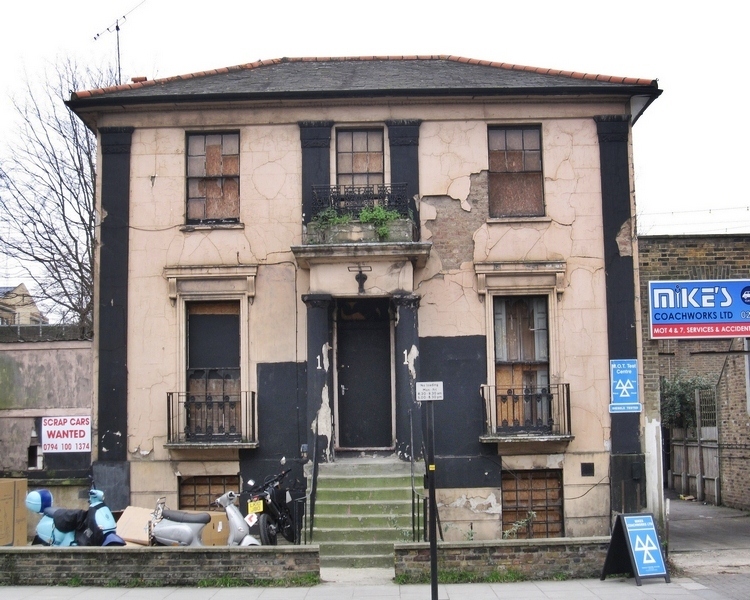 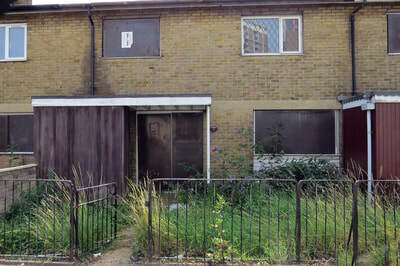 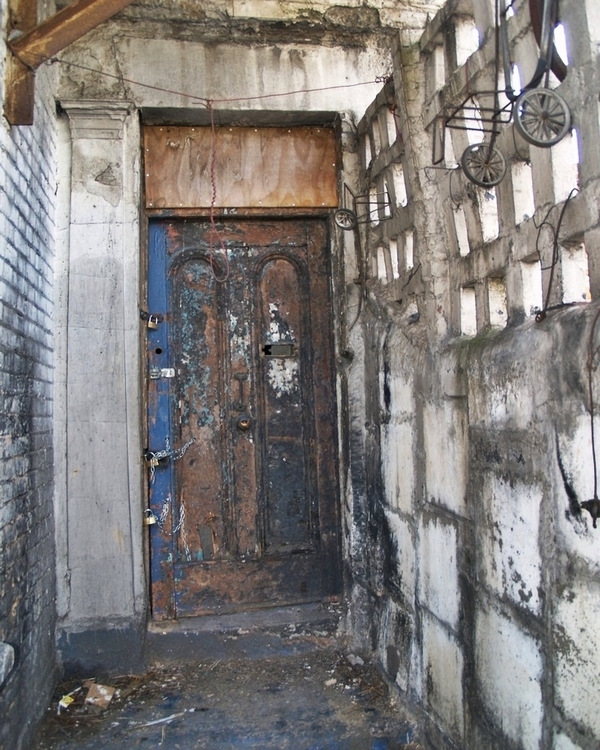 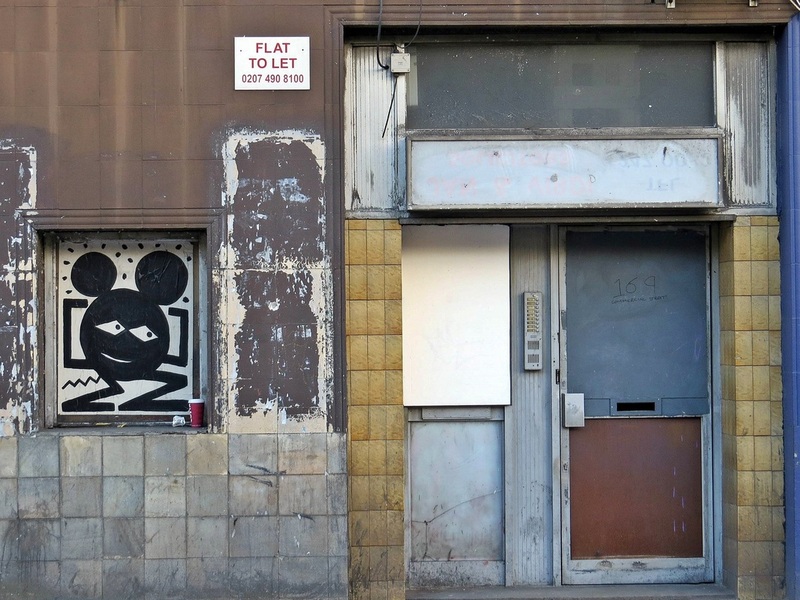 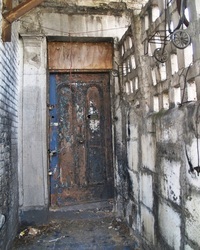 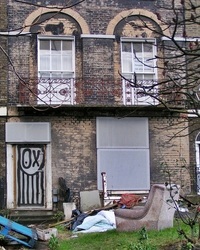 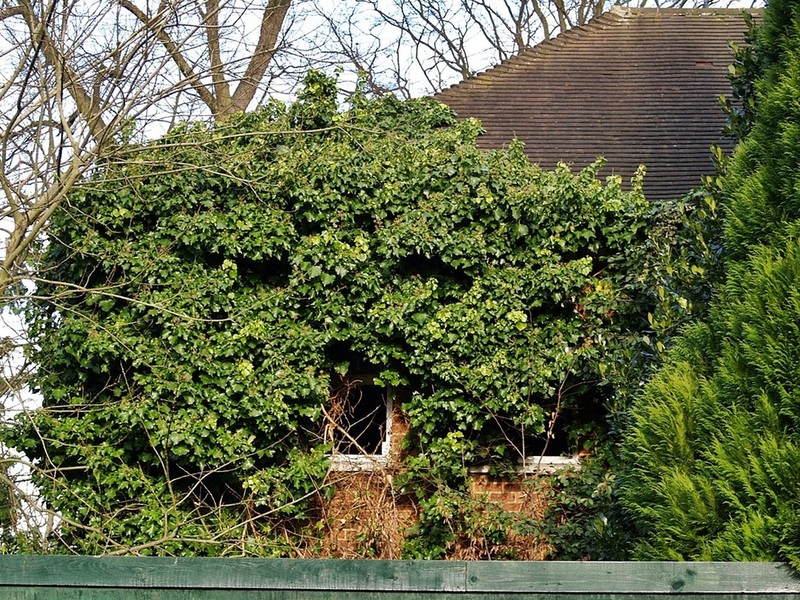 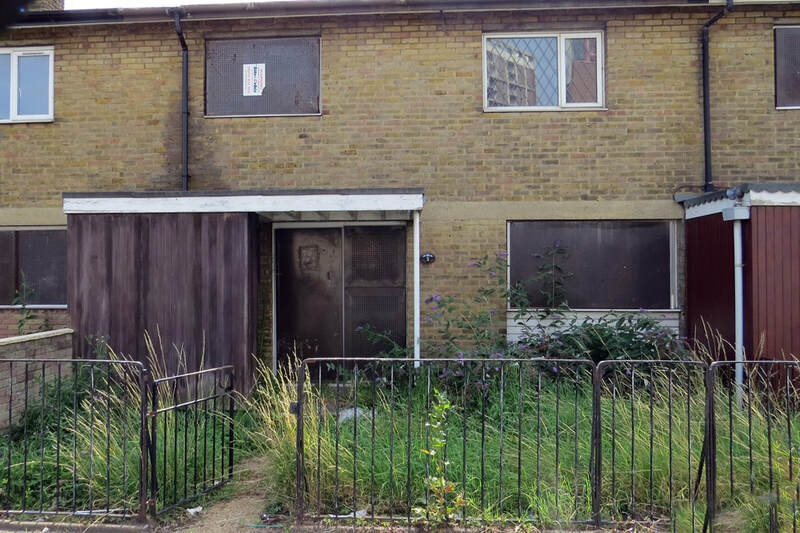 Andrew Pealling writes to Derelict London: "I have just seen my parents old flat on your fascinating website. 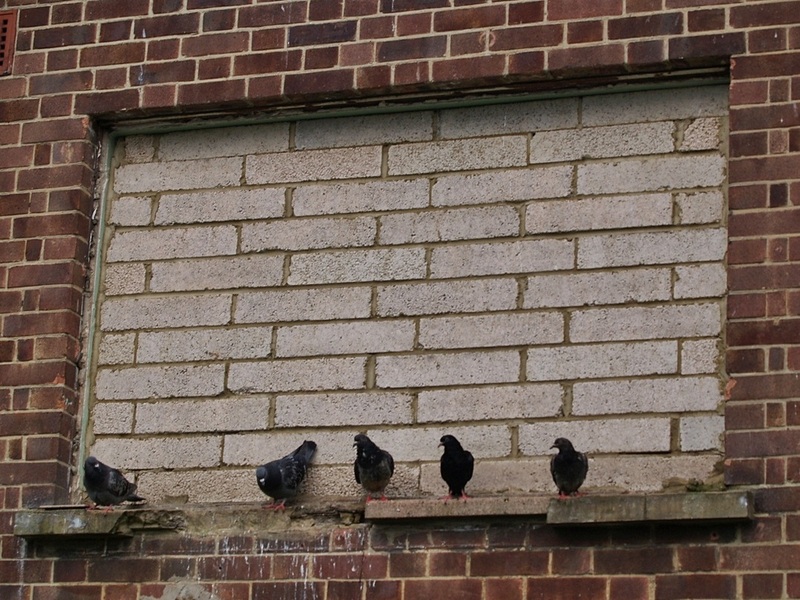 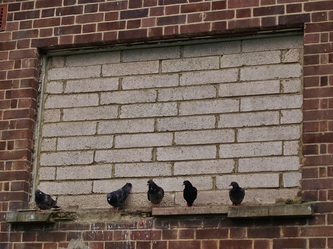 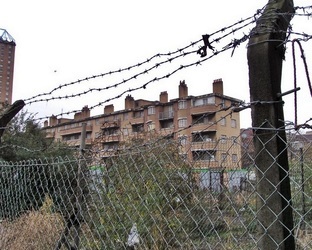 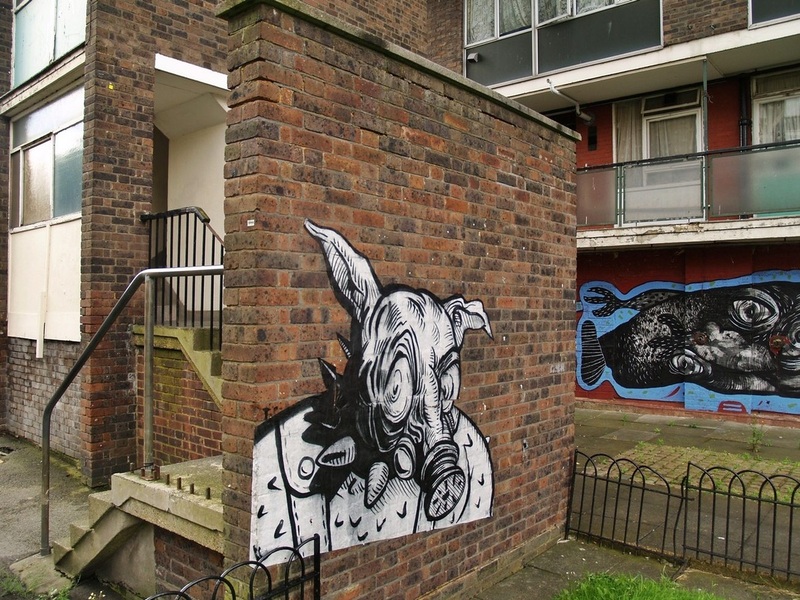 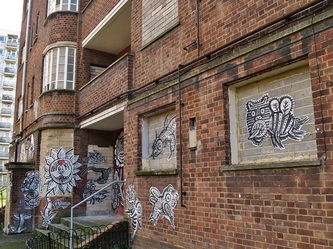 It was on the Kingsland estate under the section of derelict flats. 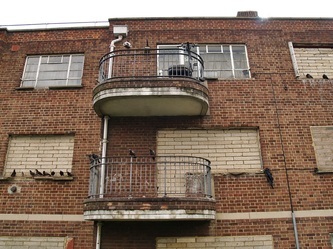 We lived on the top corner flat of Hebden Court number 33. 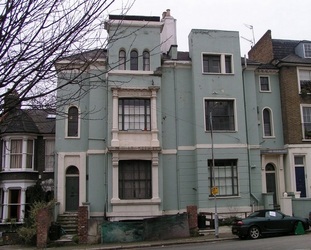 My parents,sister and brother moved in as its first tenants and I was born there. 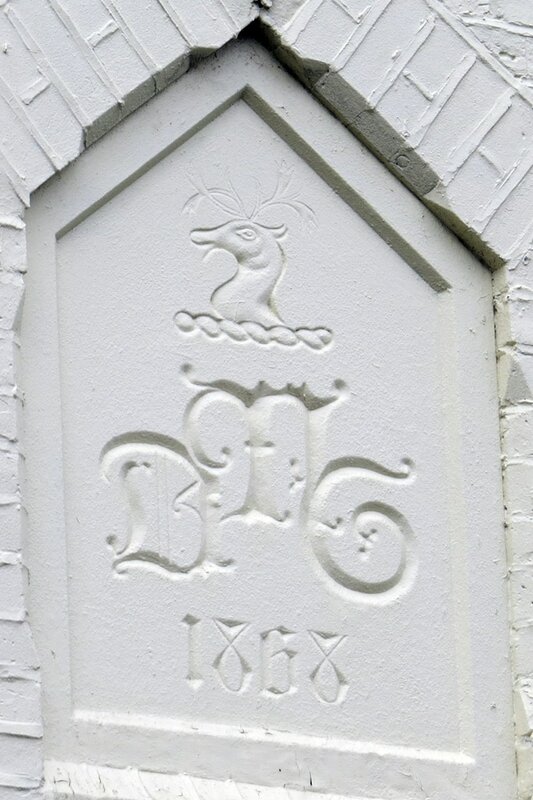 Mum passed away in 1988 and dad in 2001. The flat was boarded up shortly after. 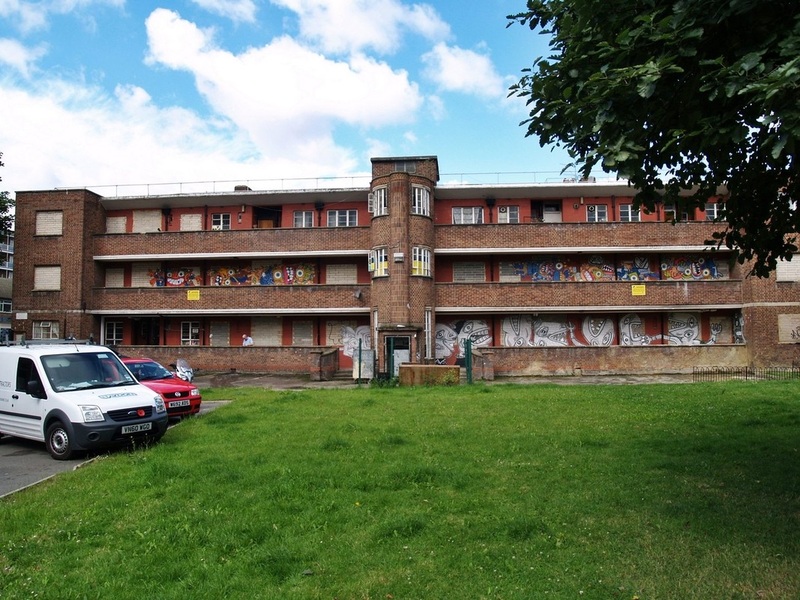 I had loving caring parents and the whole estate was occupied by decent hard working families. 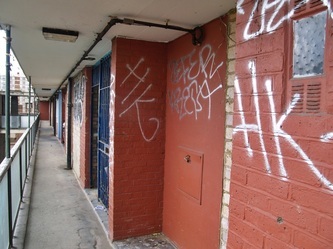 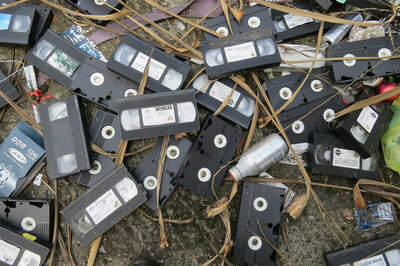 Things altered for the worse in the 80s and as decent people moved away scumbags moved in. 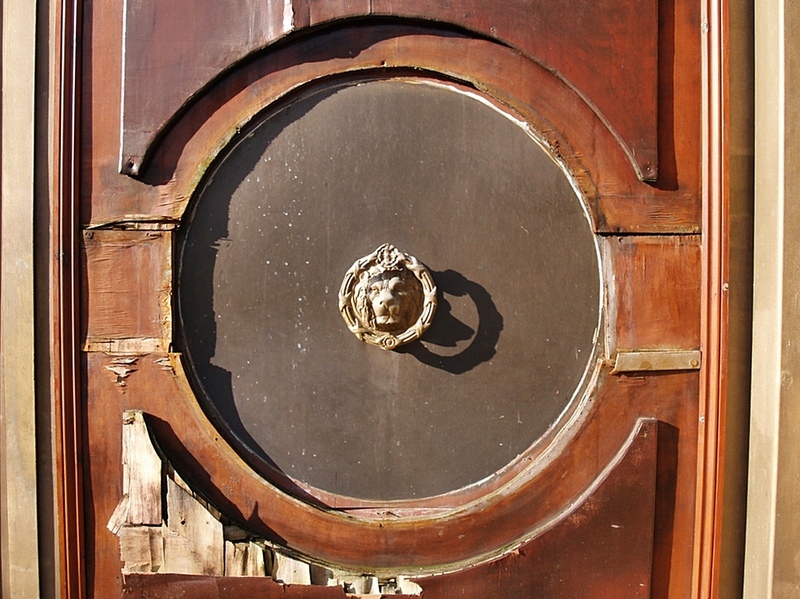 Dad was terrorized by break-ins and late night knocks on the door for rest of his tenure. 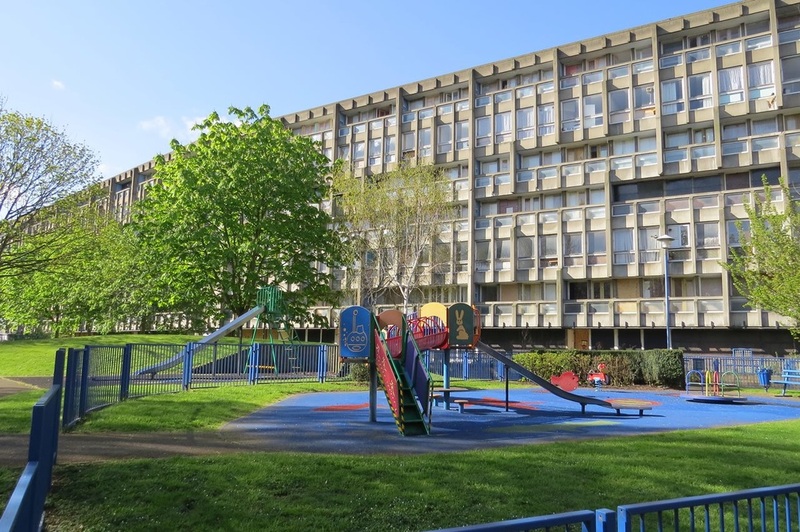 I was moved to tears by your pictures as I recalled some of the happiest years of my childhood spent with wonderful parents and good friends. 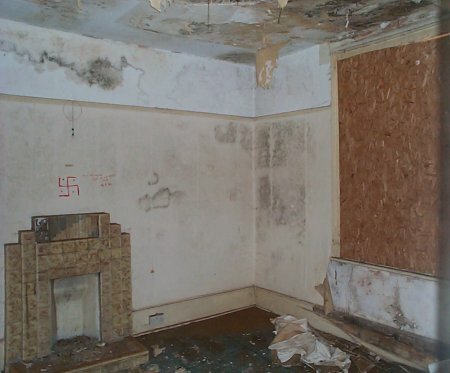 Long may your excellent website continue". As of Summer 2014, the estate has just been demolished apart from a handful of flats in Laburnan St.
"A hop, skip & a jump to Shoreditch & Islington"
Many of the houses previously featured on this website further up the North Circular nearer Palmers Green have actually been refurbished and are now looking in great condition (as you can see on the "Then and Now" section on this website) . 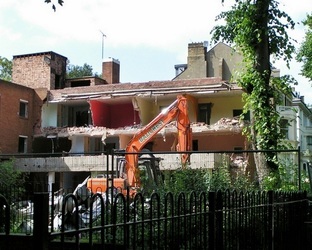 The ones on Bowes Road just before it bends into Telford Road havent been so lucky. 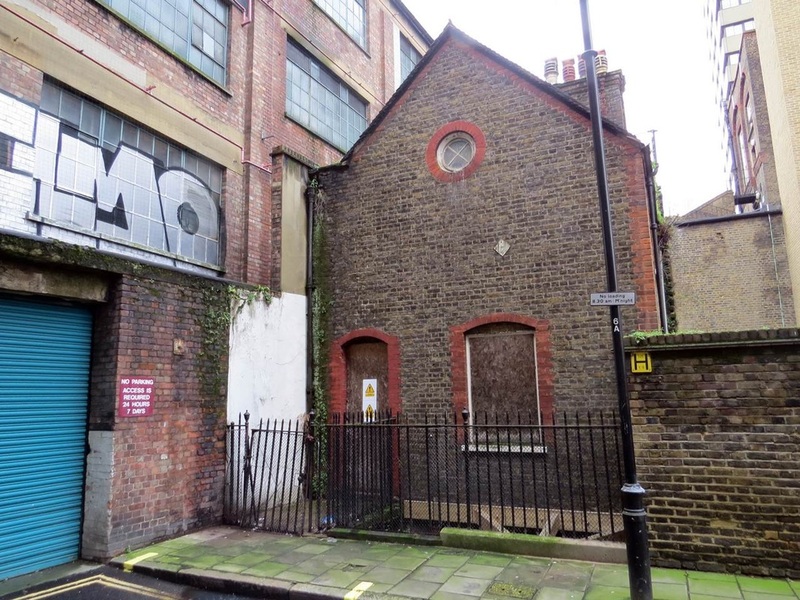 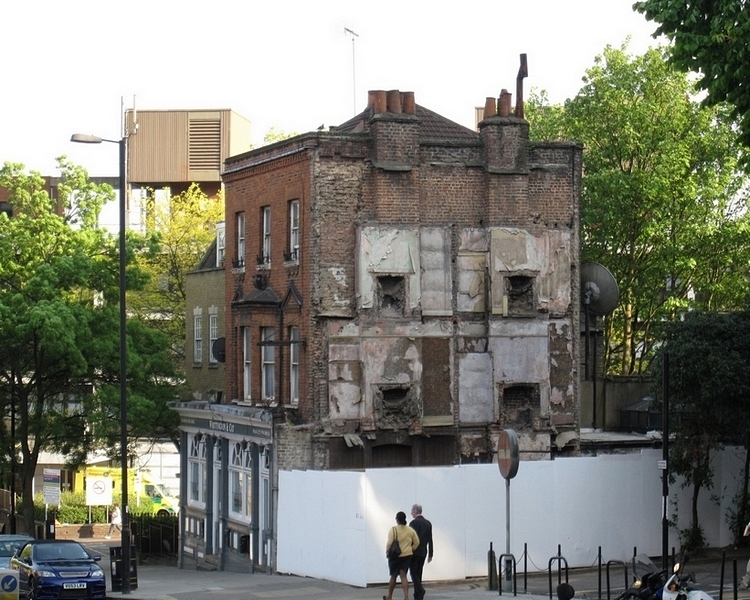 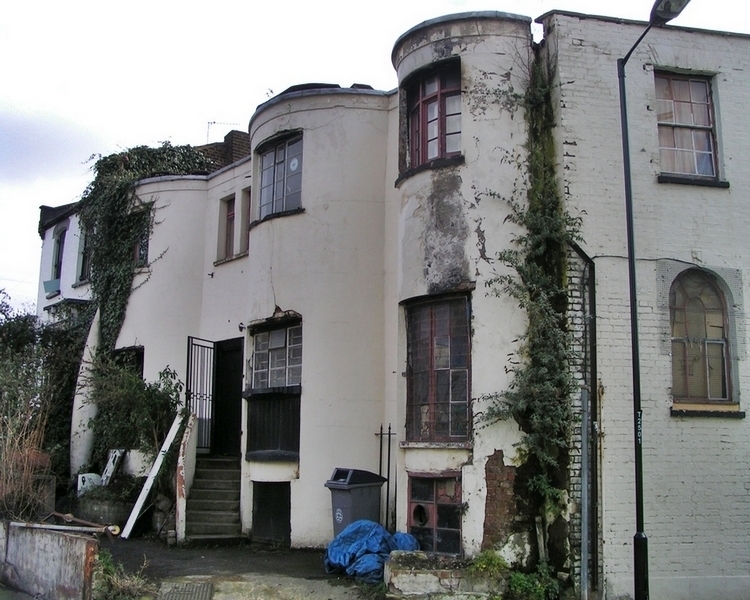 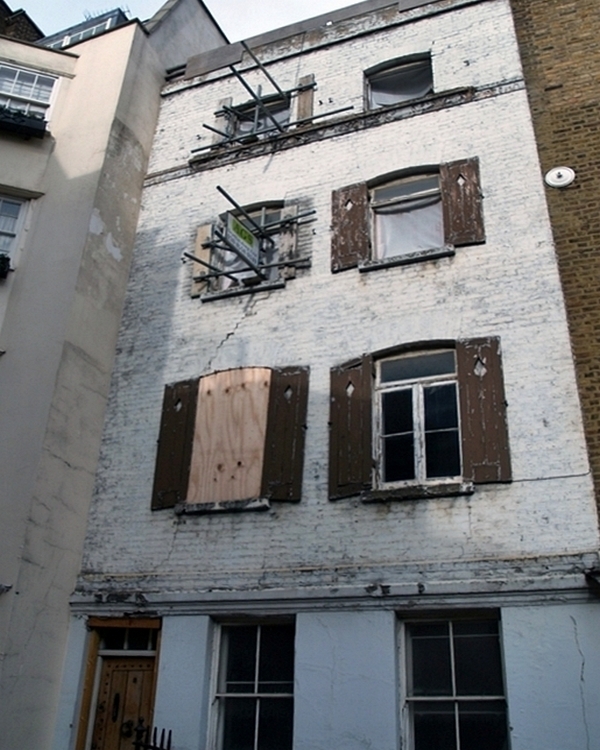 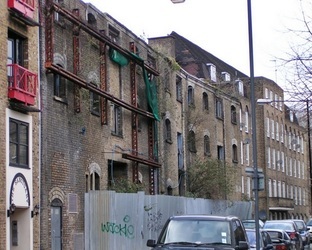 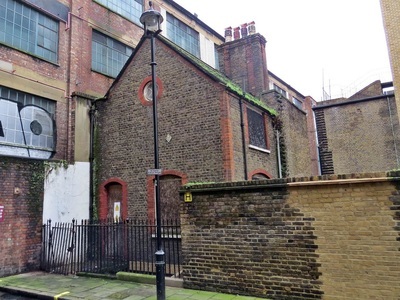 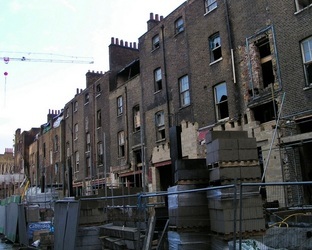 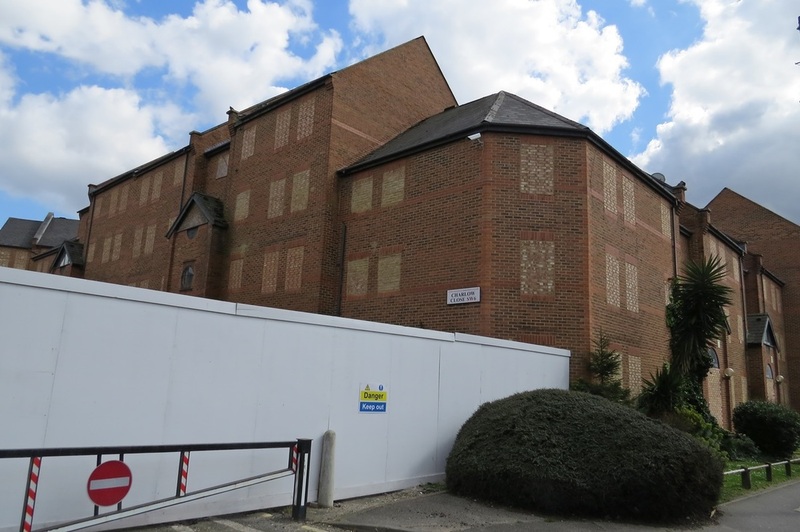 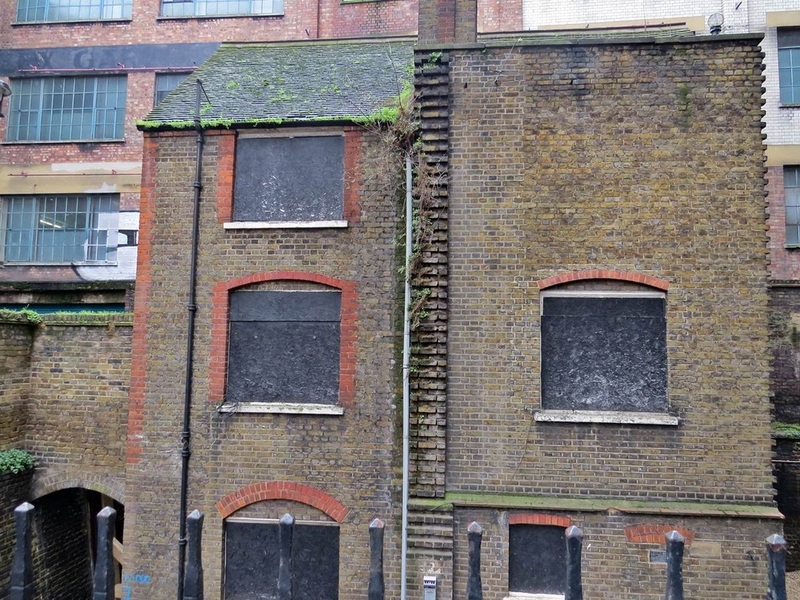 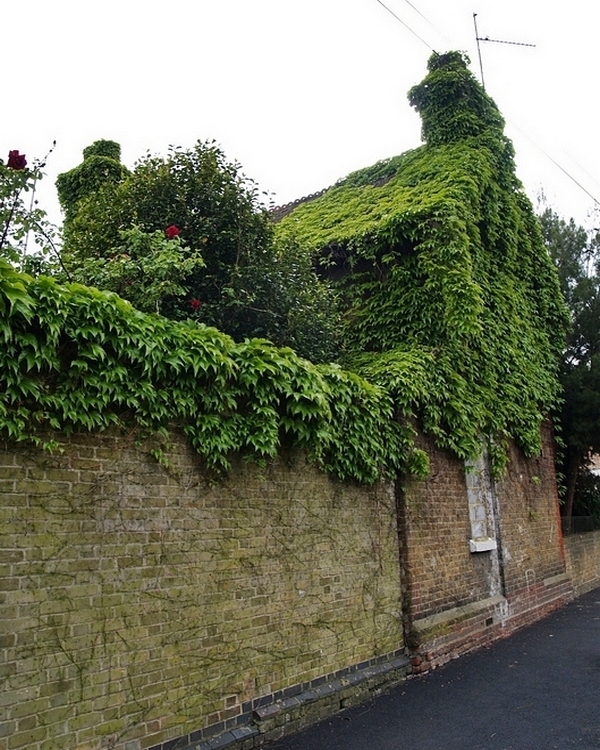 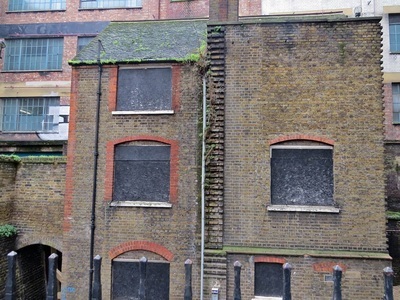 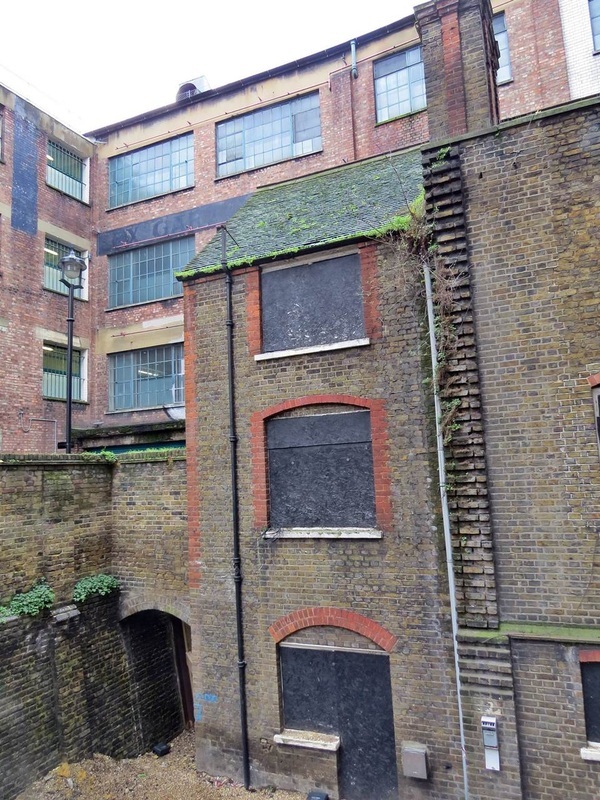 Proposals were made for demolition of these existing properties and erection of 42 flats and 14 mews houses. 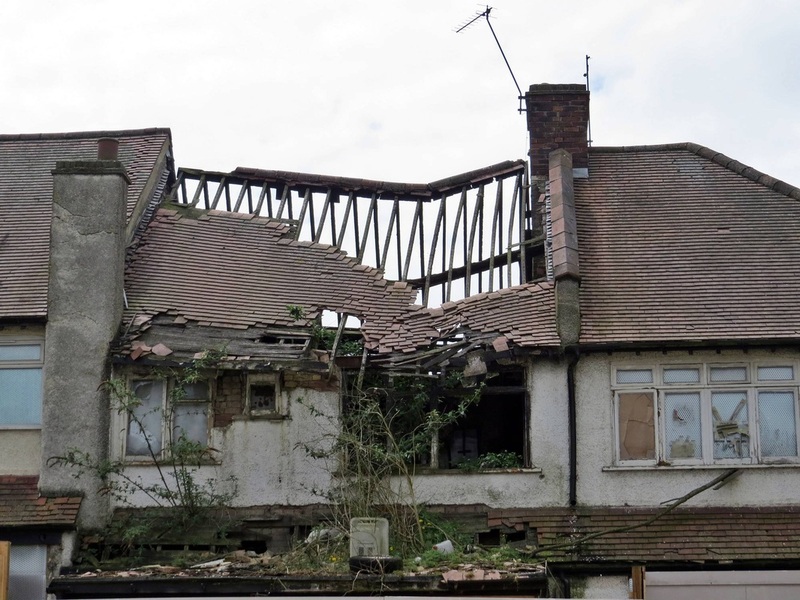 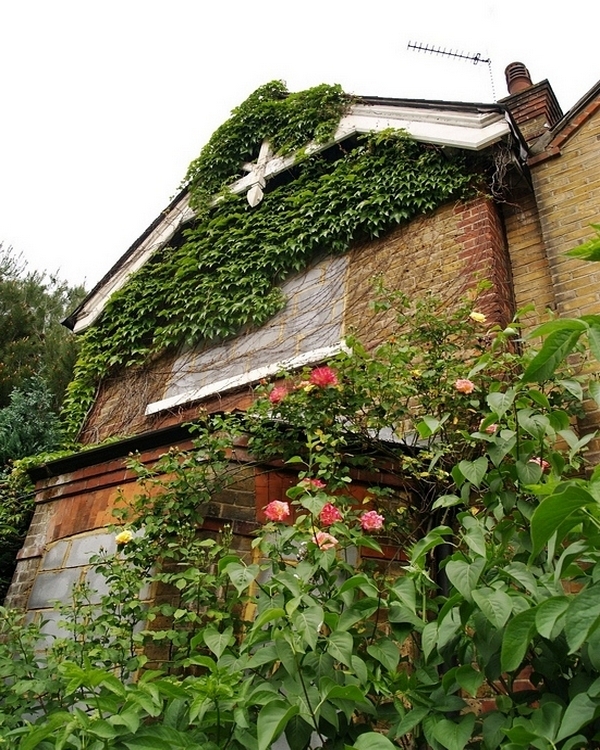 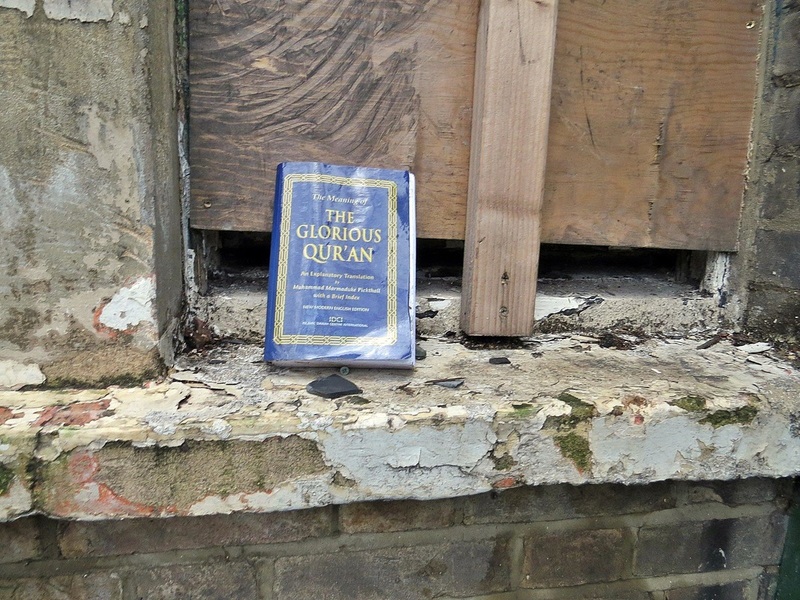 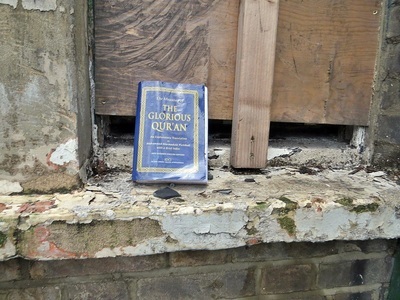 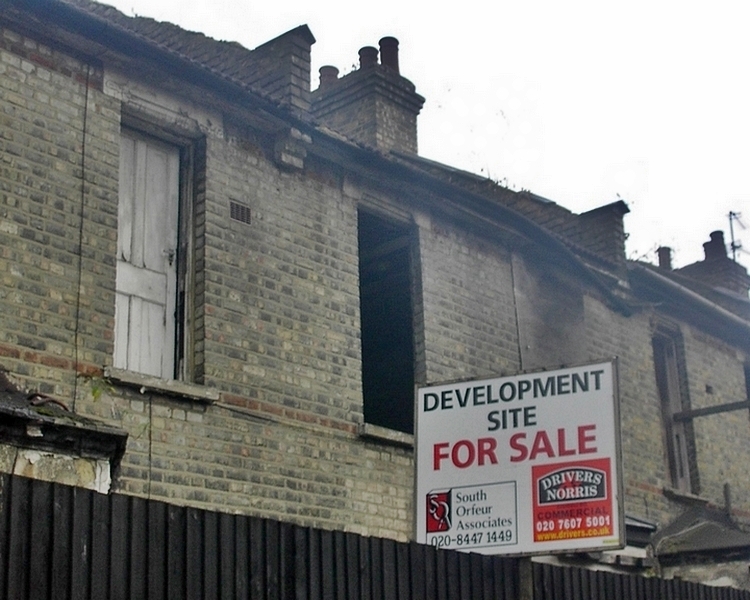 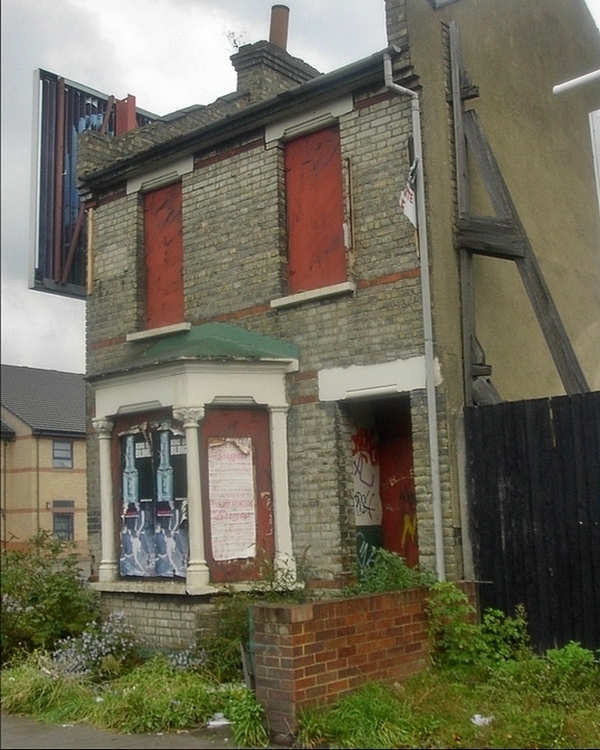 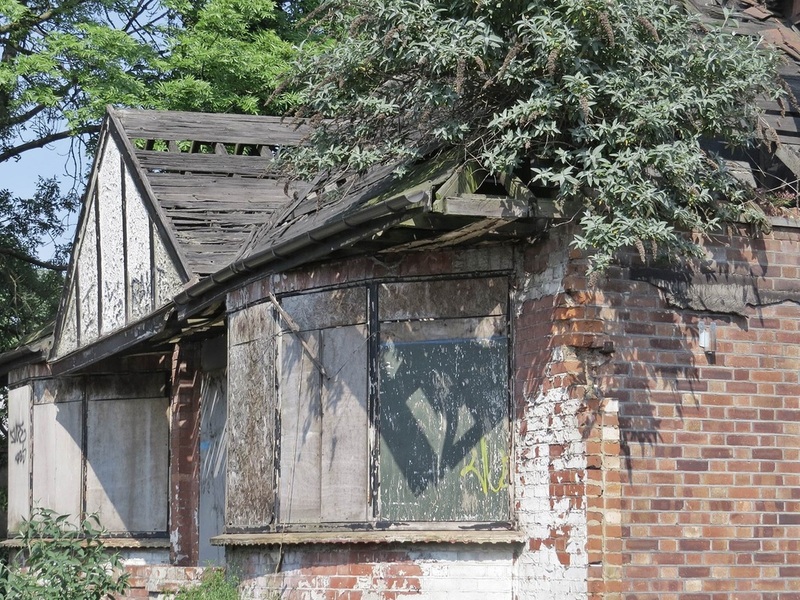 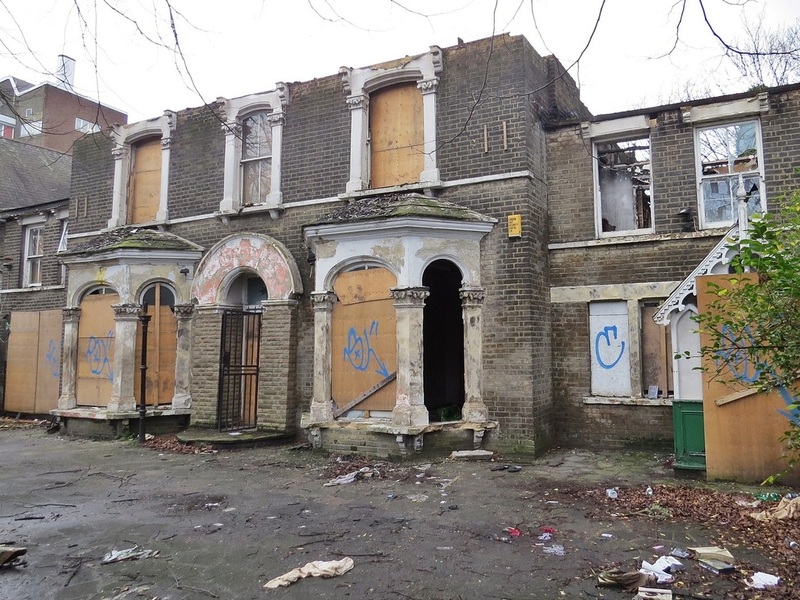 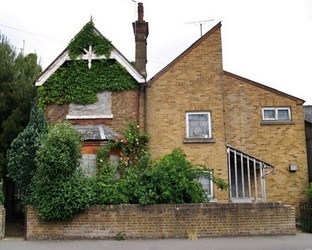 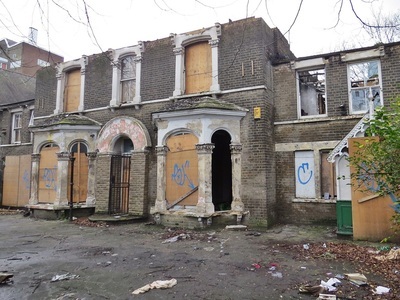 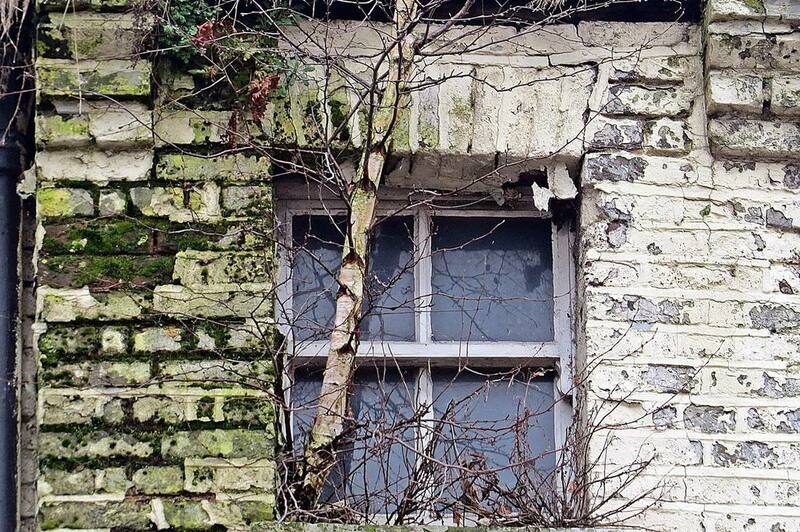 The house with the collapsing roof has been derelict for years and I featured it in the Derelict London book. 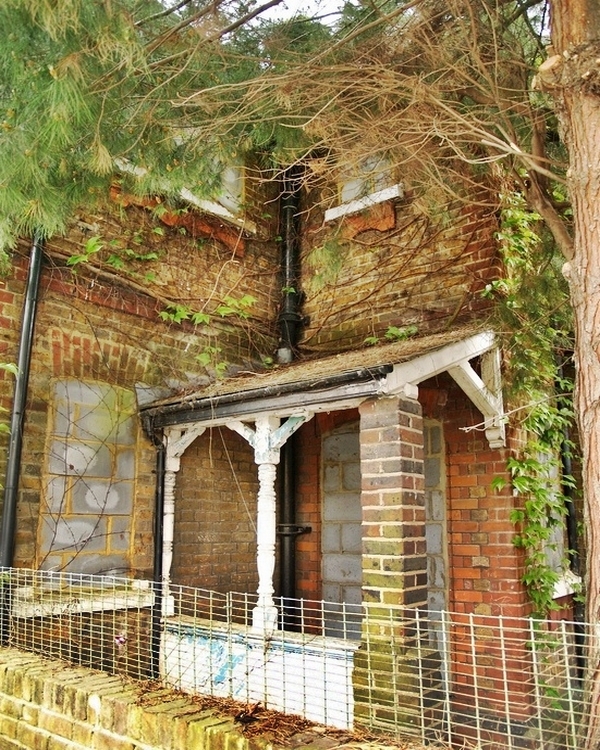 I don't remember the other houses being derelict for as long but I could be wrong on this. All the above houses plus these ones pictured below on the other side of the road were finally demolished in 2014. 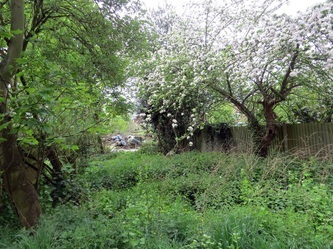 The old gardens of the houses had become quite a pleasant wilderness. Whilst these buildings were well boarded and steel shuttered some people had created little entrances and appeared to be sheltering there at nighttime. A local resident told me that he believed these people to be Romanians. 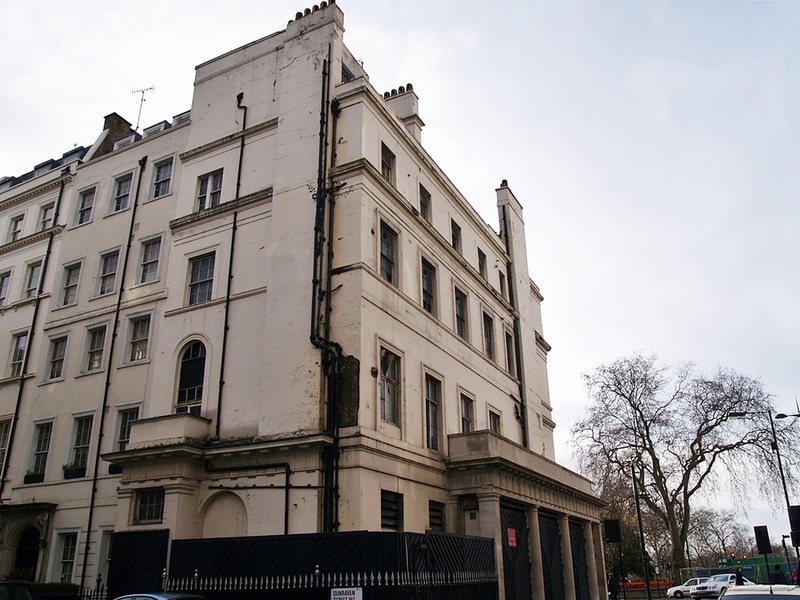 PARK LANE ,WESTMINSTER. 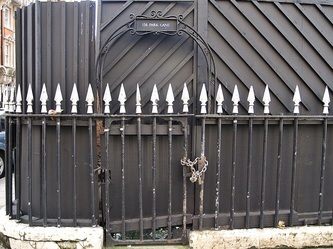 W1 - 138 Park Lane aka "The Nicholas Cage Mansion"
This Grade 2 listed building occupies the site of two small houses, originally built in 1758. 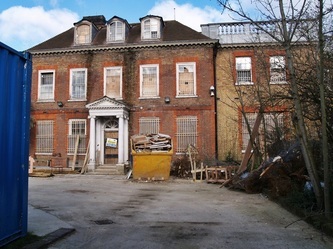 Occupants in the early years included: Sir Joseph Pennington, Richard Fitzpatrick (M.P), Henry Fitzroy Stanhope (son of 2nd Earl of Harrington) & Lord Charles Bentinck. 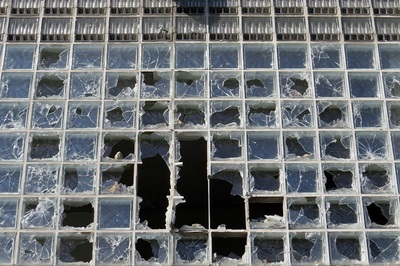 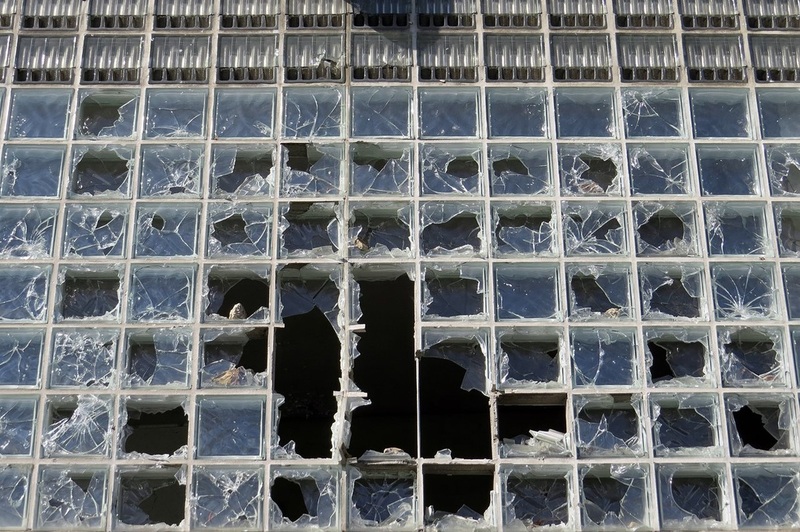 The empty buiding was bought for £10 million in 2007 and is registered to a limited company based in Jersey. 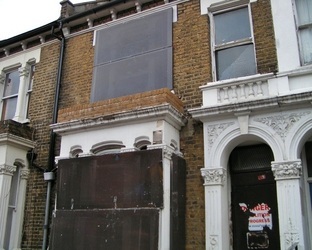 The owner is rumoured to be a Middle Eastern businessman though a previous group of squatters believe that HSBC are part owners. 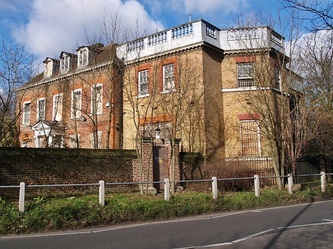 This mansion made the national press in 2010 when a Facebook party titled “Nicolas Cage Mansion Party” got out of hand as riot police were reported as having running battles with party-goers. The party was advertised widely on Facebook as a “night of mayhem” to celebrate squatters taking over this six-storey Georgian mansion on Park Lane.But events rapidly spiralled out of control when thousands of teenagers heard about the party through social networking sites, passed the invite to their friends and then descended en masse. 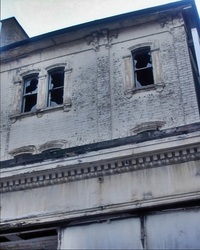 Police officers arrived to try and stop revellers from climbing onto the building’s roof which they feared would collapse under the weight of so many people. 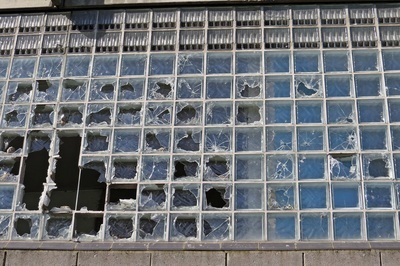 They called for riot police to back them up after a small number of partygoers started hurling bottles and bricks in protest. 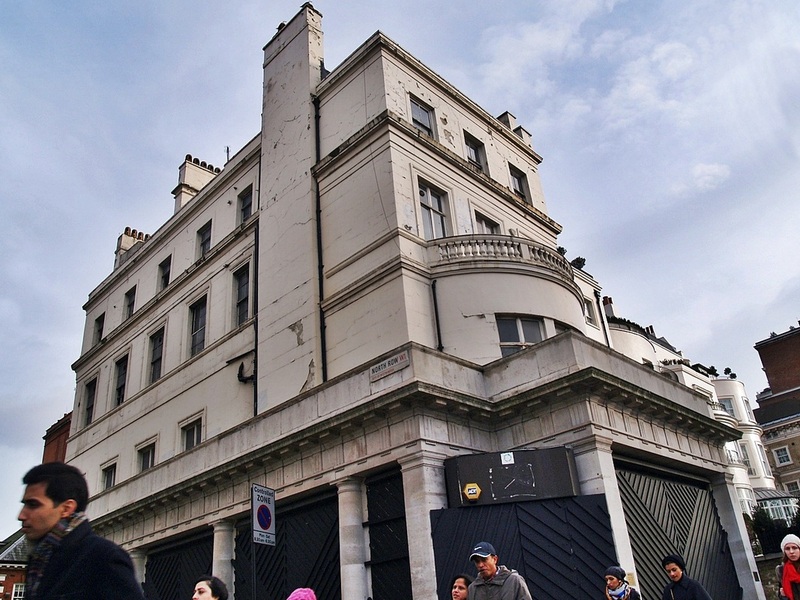 Park Lane was closed off for more than three hours as officers tried to persuade the revellers to leave. 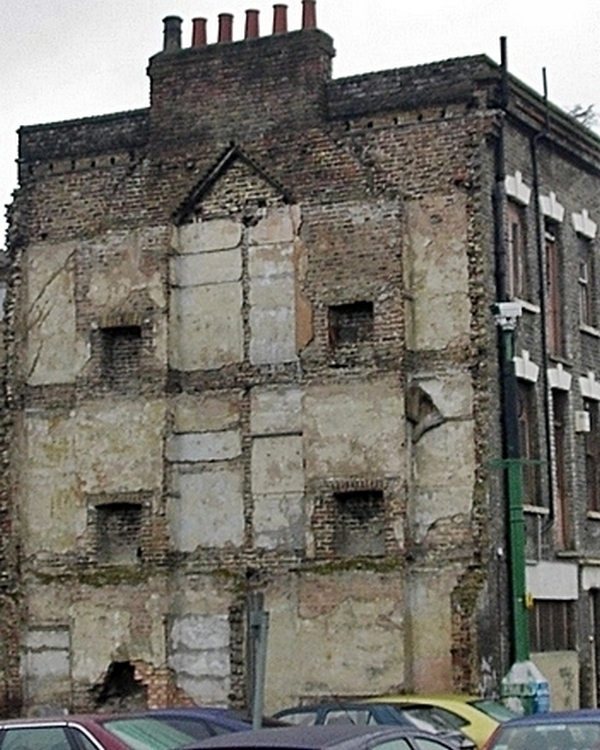 Courtney Love, who lives off Park Lane, had to abandon a gig in Camden that night because she could not get through police lines. The building has been boarded up for a number of years and there are no imminent plans for re-use. 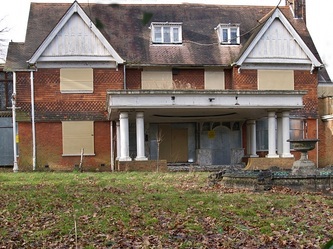 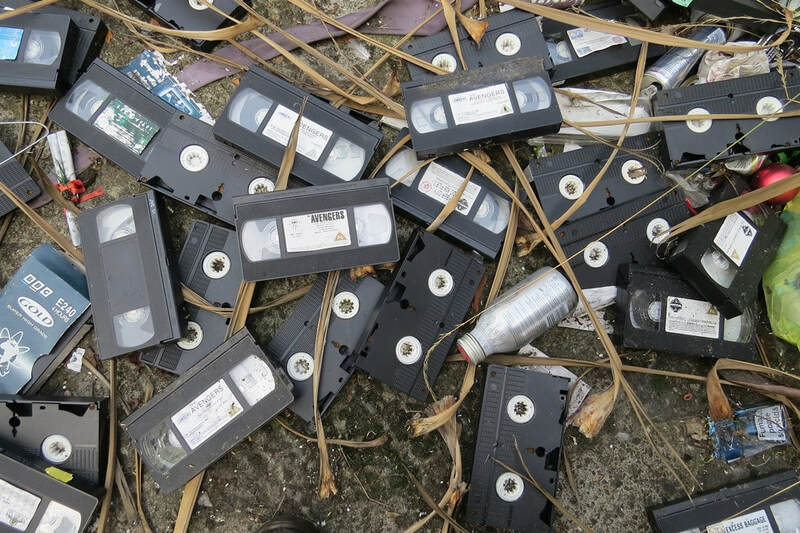 The sad end of Muscle Mansion. 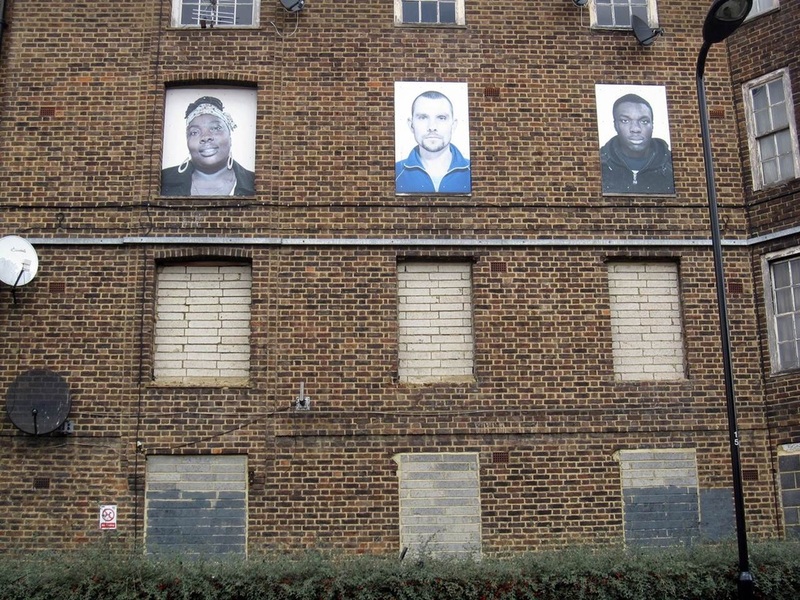 Newham bodybuilder Charles 'Wag' Bennett spotted Arnold Schwarzenegger, who was just 19 at the time, when judging the Mr Universe competition. He and his wife Diane invited Arnie to Forest Gate in 1966 to live at his house in Romford Road and train as a bodybuilder at the gym they ran downstairs.Diane coached him on the English language made his shirts and cooked him turkey breasts every hour on the hour for most of the day.Arnie referred to the Bennetts as his "British parents" whilst living there for two years. Wag was well known for his training including two other Mr Universe title holders plus the Incredible Hulk, Lou Ferrigno! 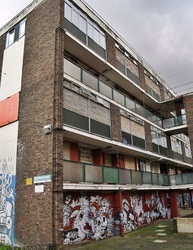 Knowing its history I had a look at the building a few years ago and it looked a little unloved following Bennett's death in 2008.. 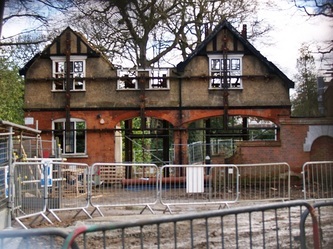 I was therefore shocked in January 2014 to see that the building IS now a burnt out wreck. 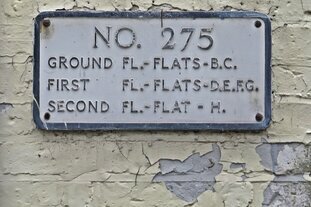 I only stumbled upon this when in Forest Gate researching the site of the Upper Cut Club round the corner. 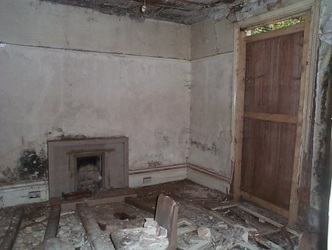 This is where Jimmi Hendrix composed Purple Haze in 1966. 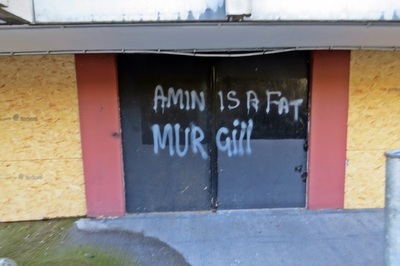 I wonder if Arnie found the time to catch a gig at the Upper Cut around the same time? 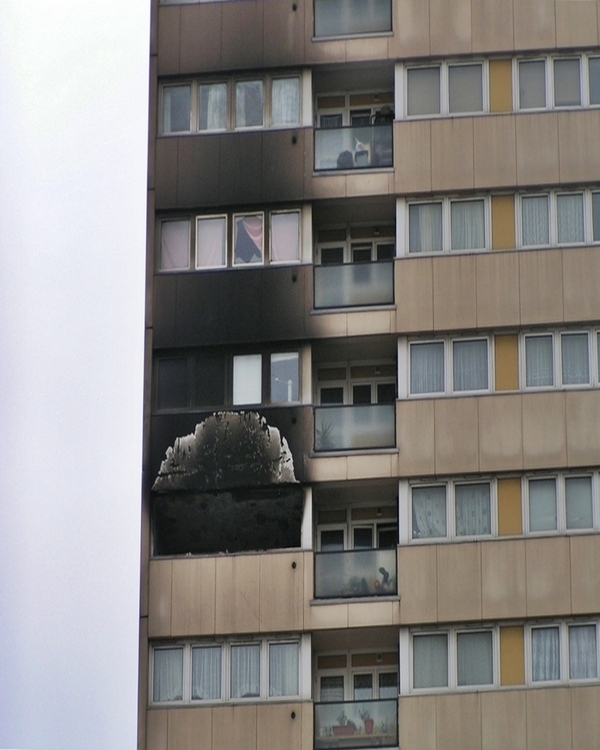 Apparently the fire was in April 2013 and according to local press 60 firefighters tackled the fire which took about four hours to bring under control. 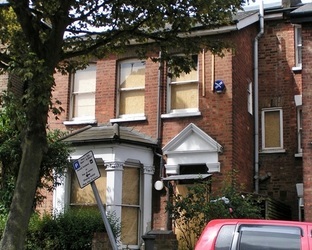 Romford Road was closed for about 11 hours while the scene was investigated by police. Two men were rescued from the house and were later arrested with arson. Right in the centre of Soho is this school keeper's house, which was built somewhere between 1750-80 sitting in the grounds of Westminster Kings­way College (WKC) Soho campus. The main college building was built in 1880 as the Pultney School. Obviously, this building predates the college and its original form was likely to be part of a row of labourers’ dwellings. 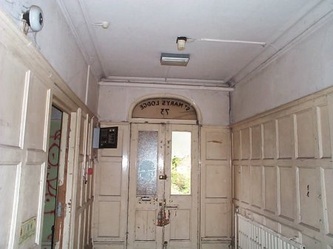 The building has been left empty and unused for over 25 years.Though not listed it is on a local building conservation list & is protected from demolition. 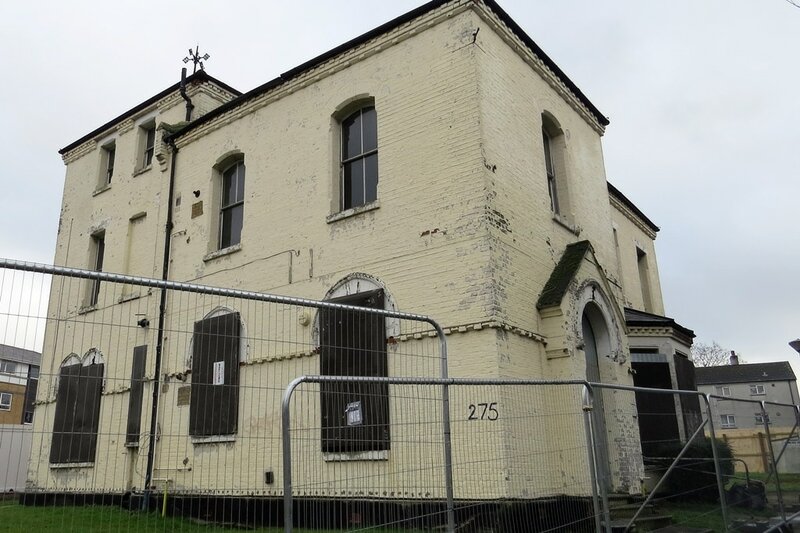 The WKC are looking to extend their building that would incorporate the derelict building in a refurbished form but whether that actually happens remains to be seen. Plans by a local community group to turn the building into an arts hub called The Soho Foundry have also been proposed. 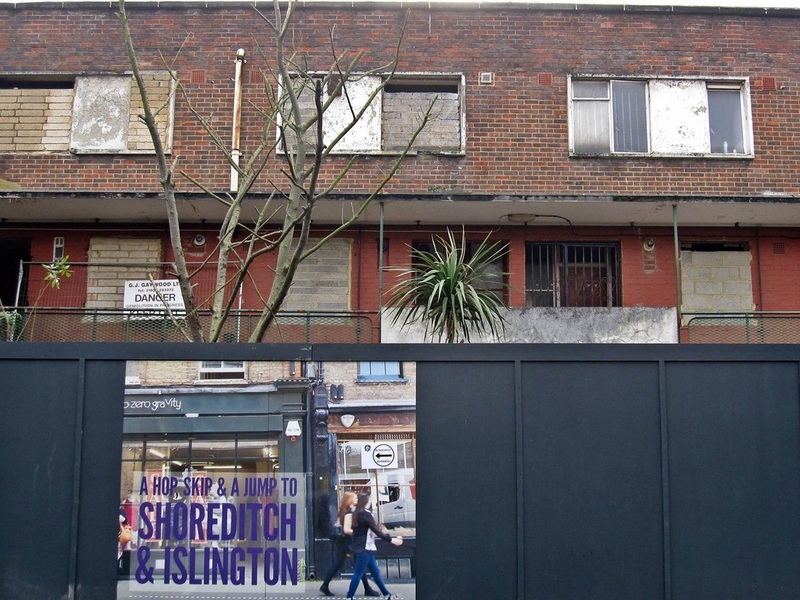 This is led by the guy who was responsible for the legendary Foundry in Shoreditch which many of us frequented before closing in 2010 to make way for a hotel development. 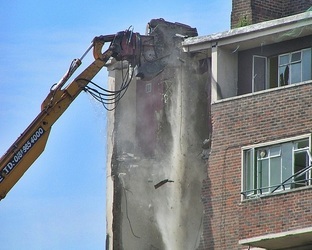 Here we are .... another block of flats lined up for demolition. 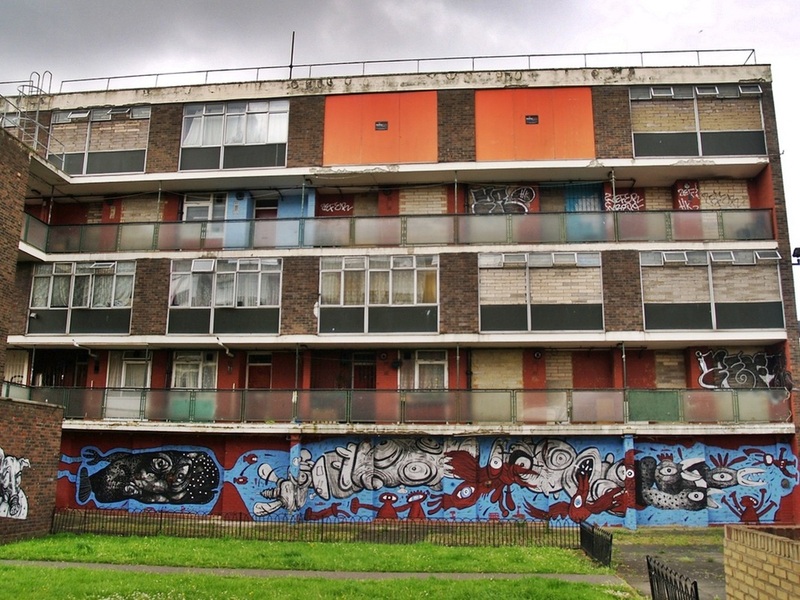 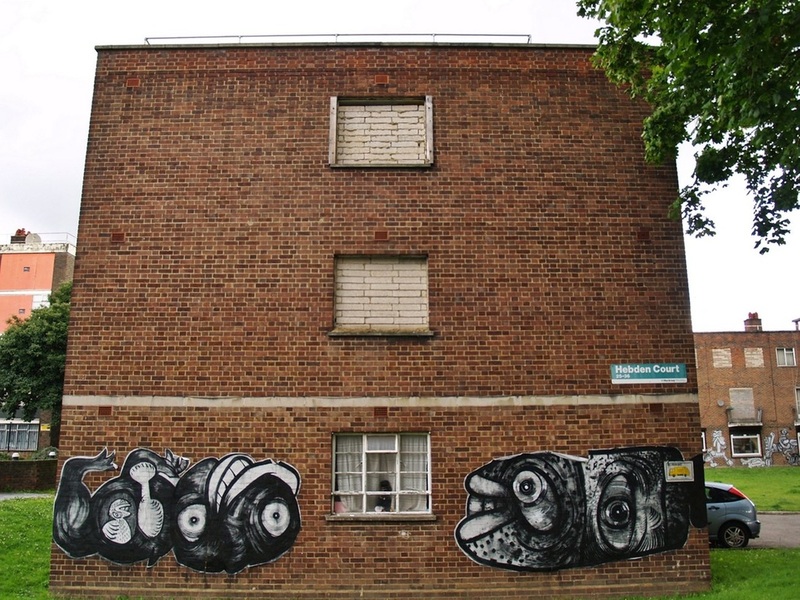 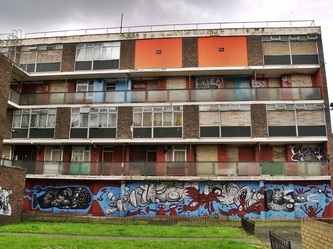 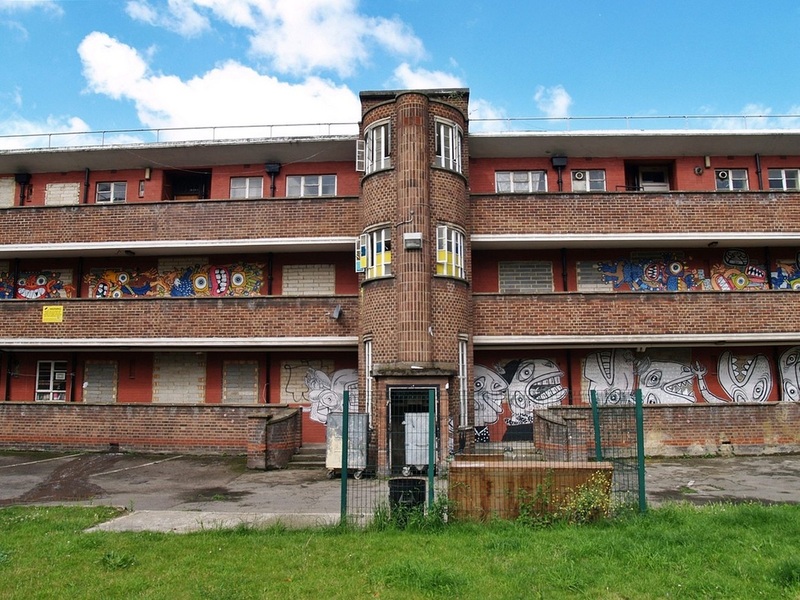 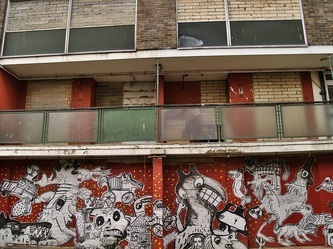 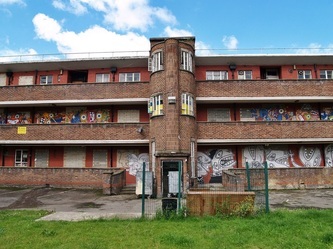 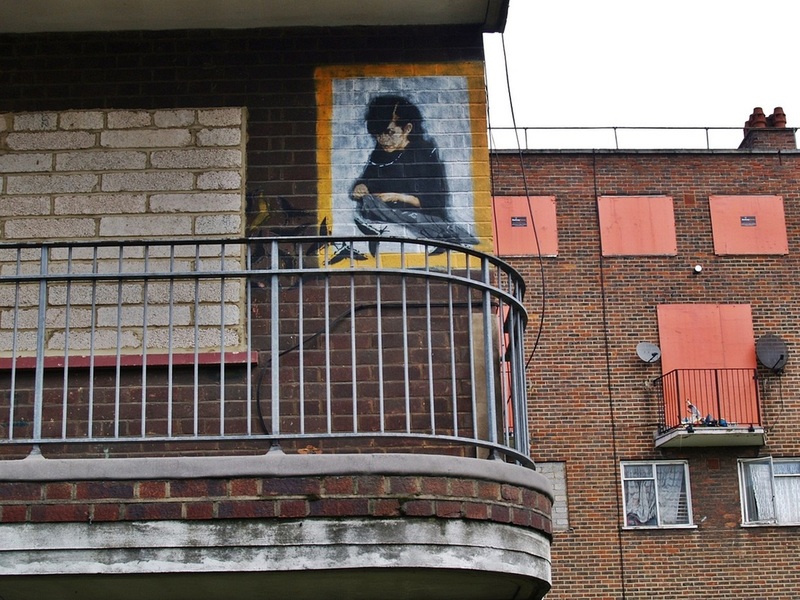 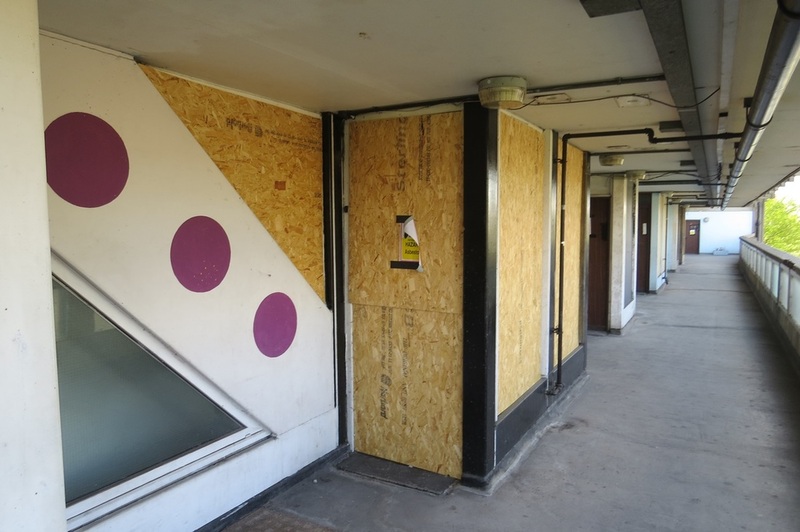 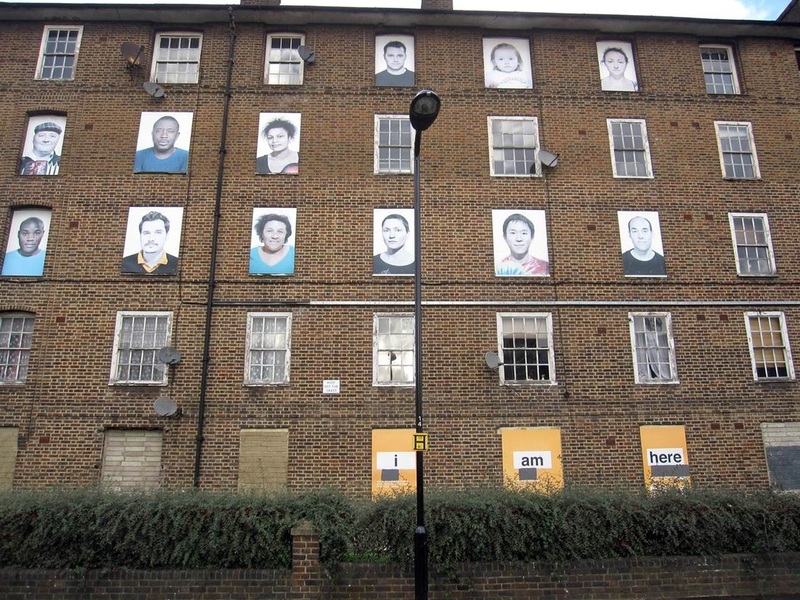 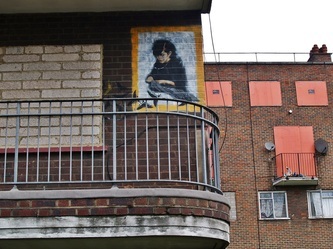 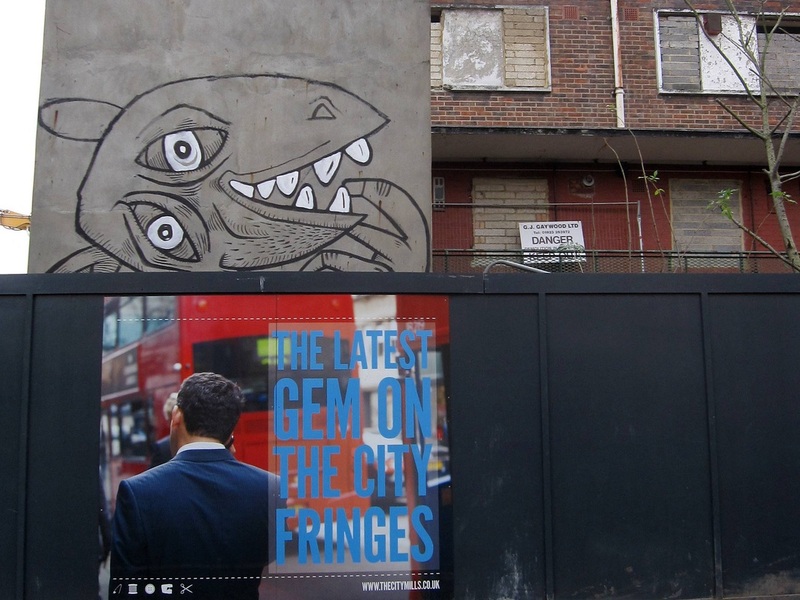 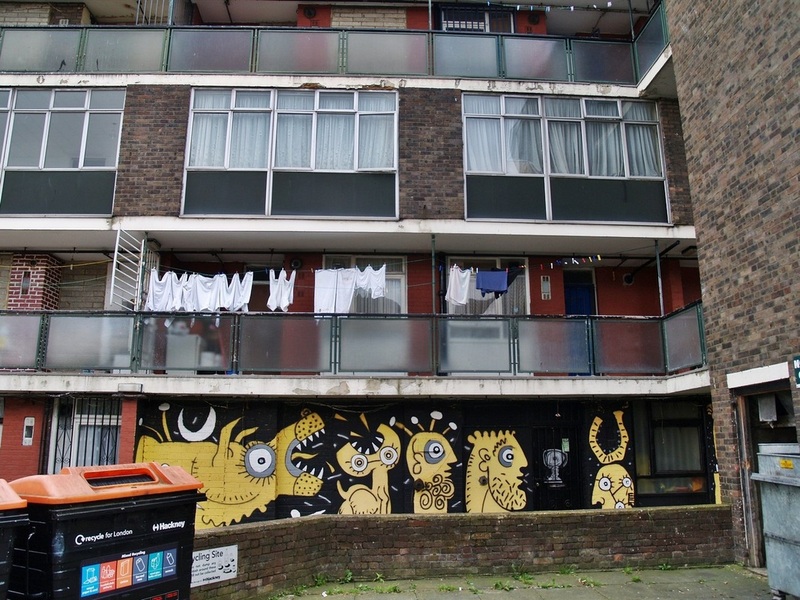 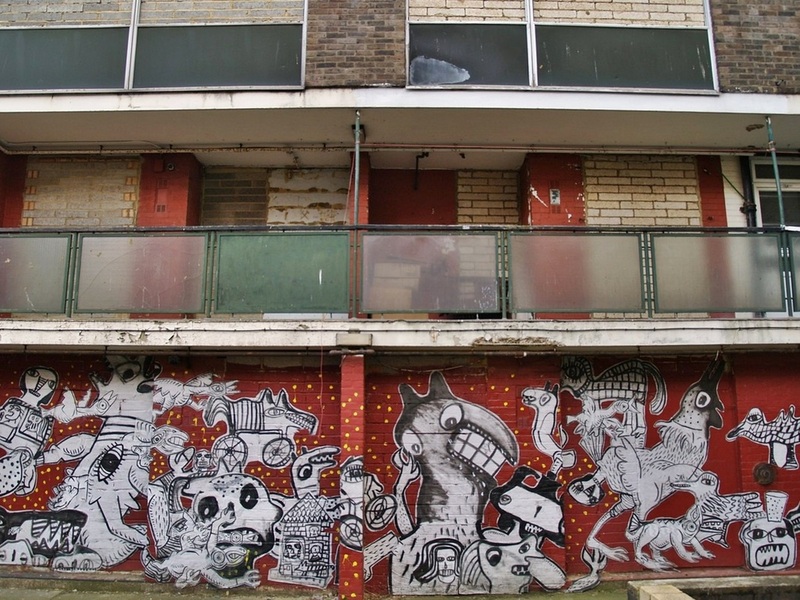 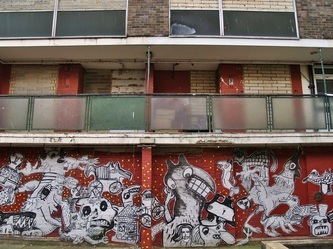 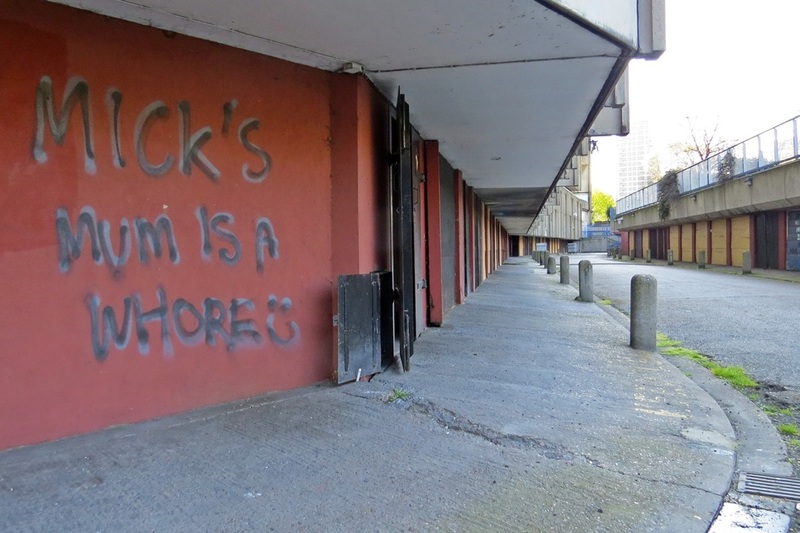 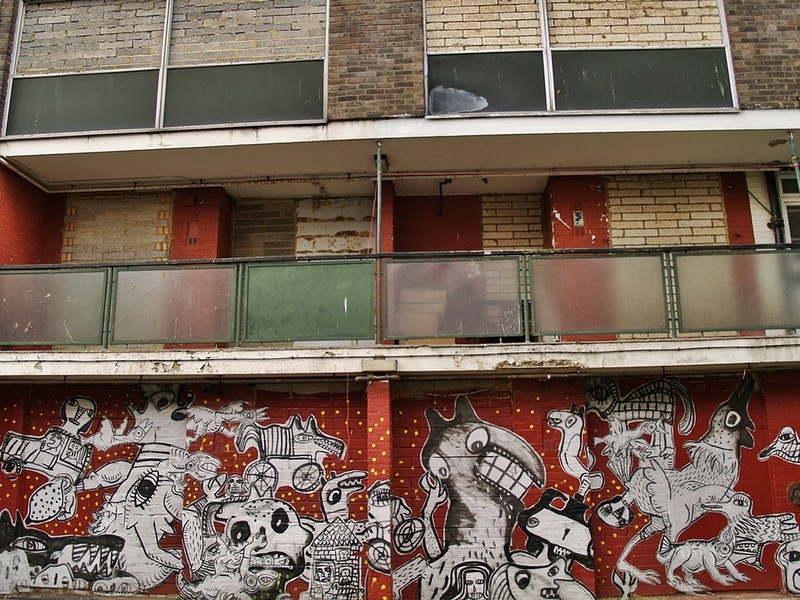 The difference here is that a group of artists have displayed colour portraits of local residents placed over the boards which have covered the windows of empty flats on Samuel House. 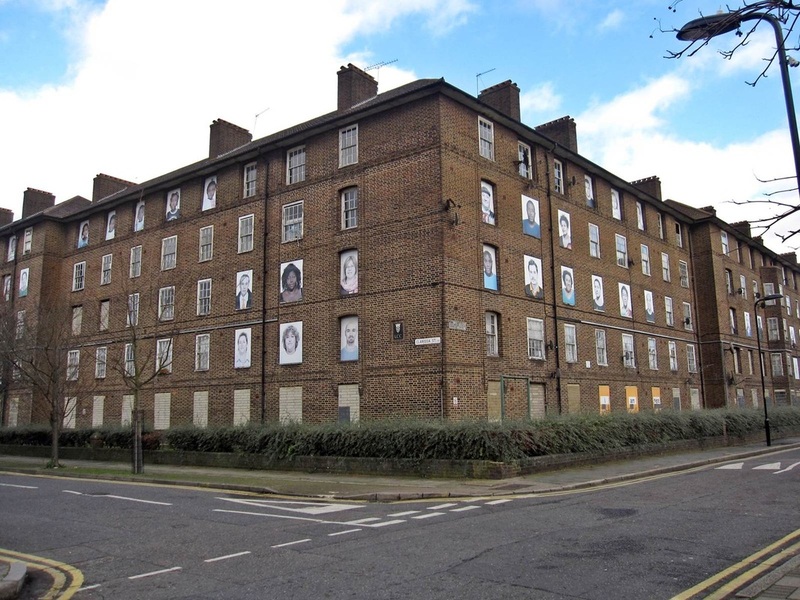 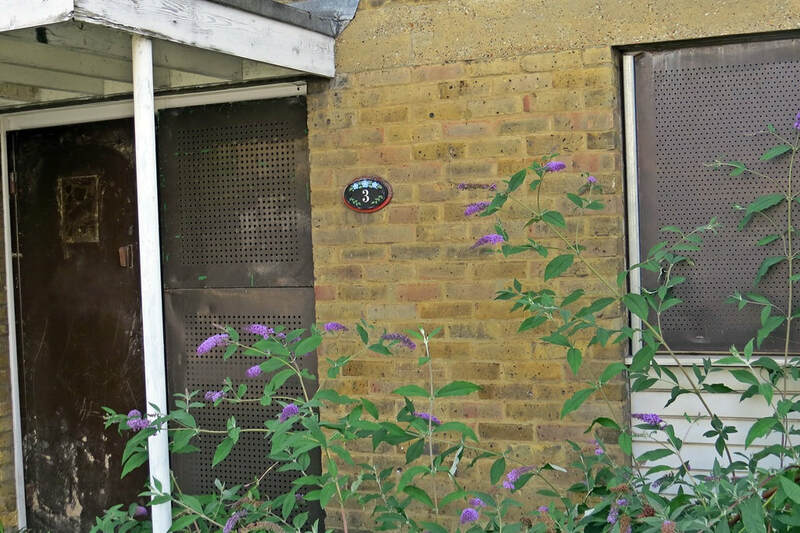 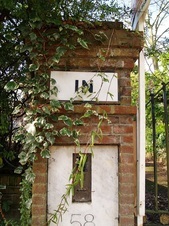 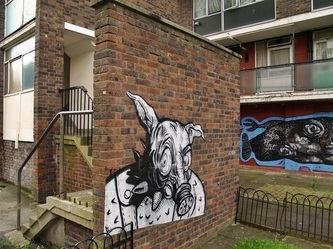 The work entitled "I am Here" was created by Fugitive Images and can be found on Clarissa Street & is clearly visible from the Regents Canal towpath.The 1930s Haggerston Estate was run by Hackney Council until being transferred to London and Quadrant Housing Association who are building a new estate.